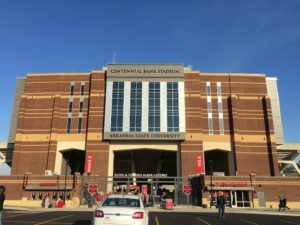 In the pantheon of the college football world, a trip to Arkansas State doesn’t rank very high on the list of dream destinations. 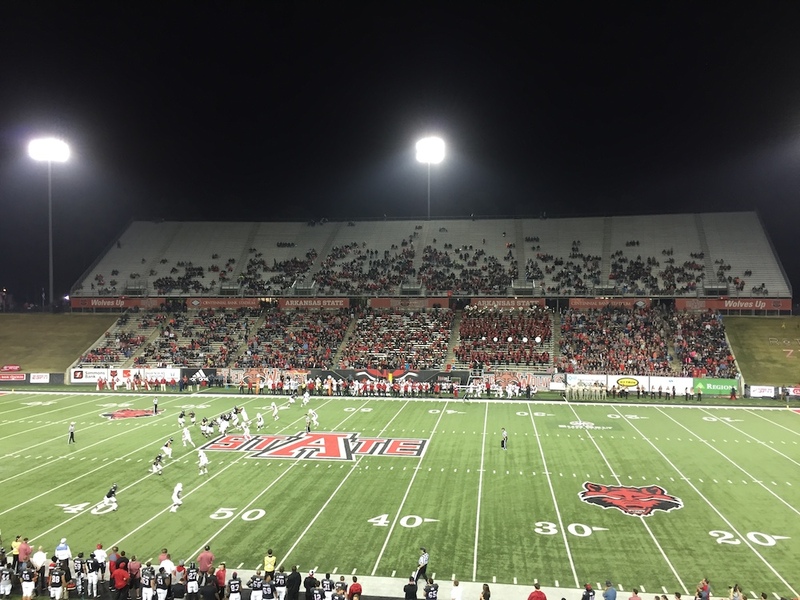 And, if we’re being honest, Northeast Arkansas is hardly an exciting tourist draw. 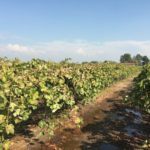 The broad, table flat expanse of the Mississippi flood plain features endless miles of cotton, corn and soybeans, but lacks the rugged beauty of the Ozarks to the west. Hemingway spent some time here, in nearby Piggott, Arkansas, the hometown of his second wife Pauline Pfeiffer. 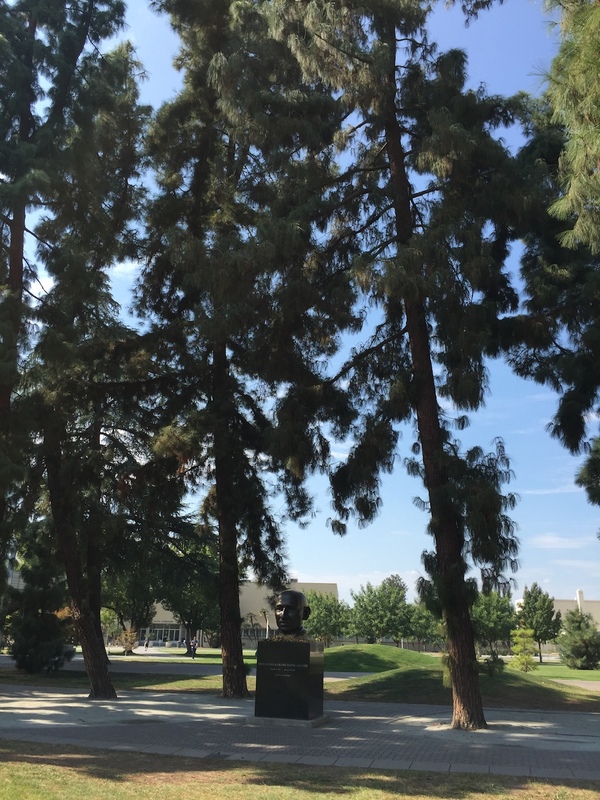 Reportedly, much of his novel Farewell to Arms was written in a studio there. 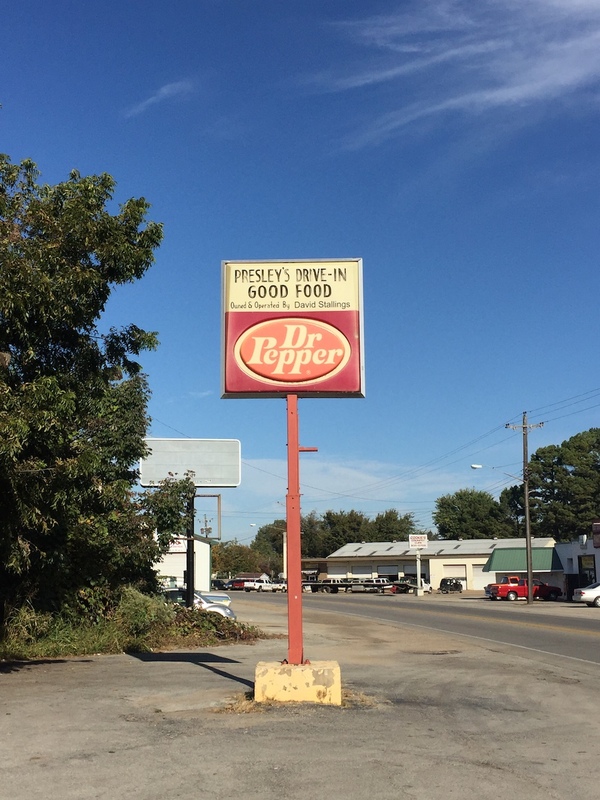 Outside of that little historical nugget, however, the greater Jonesboro area offers little to the wayfarer. 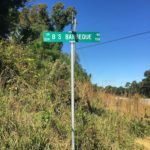 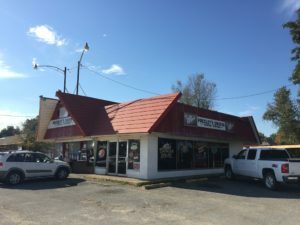 After flying into Memphis, the nearest airport of measure, I set off on the hour long journey to Jonesboro setting a northwesterly course along Route 63. The rental car gods have bestowed upon me a gas guzzling Ford Explorer, and the black behemoth feels like a school bus compared to the cramped shitboxes I’m accustomed to. 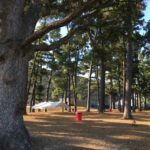 I cross over the broad, tea colored, Mississippi River under the expansive double iron arches of the Hernando De Soto Bridge. 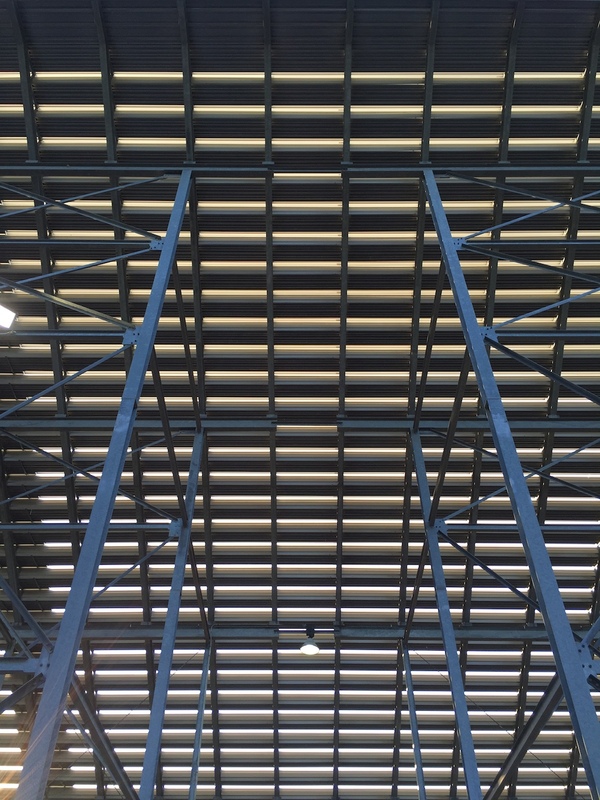 The span, over 9,000 feet of her, is named after the famed Spanish explorer who first surveyed this stretch of the river in the mid 1500’s. 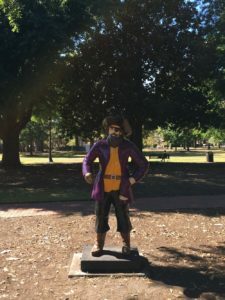 The same Spaniard whose remains purportedly lie unmarked somewhere in the sand beneath those murky depths after his body was tossed in and sunk by his men. 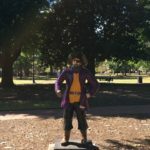 According to legend, after dying of fever he was “buried” (chucked into the river) in secret during the night; lest the ruse that he was an “immortal sun god” be spoiled amongst the subjugated natives. 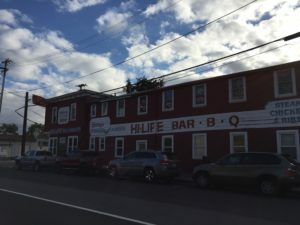 In addition to the bridge, however, (and the general conquistador pestilence and brutality that early Spanish explorers wrought upon the new continent) the legacy of De Soto carries a far greater implication on the culinary landscape of America than most are aware, and, even, the very bedrock of the PigskinPursuit itself. Ironically, it is De Soto that is widely credited as the first European to introduce domesticated Eurasian swine to the North American mainland. 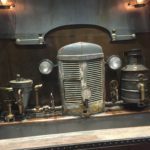 A few of those first hogs DeSoto brought over undoubtedly escaped the executioners axe, and set off to run wild in the forested expanse of the New World. 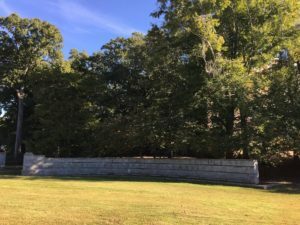 These pioneering pig “pilgrims” that made the trans-Atlantic voyage, and subsequently scampered off into the wilderness, would become the forefathers of the feral pigs or “Razorbacks” that have populated the entire Southern US since. 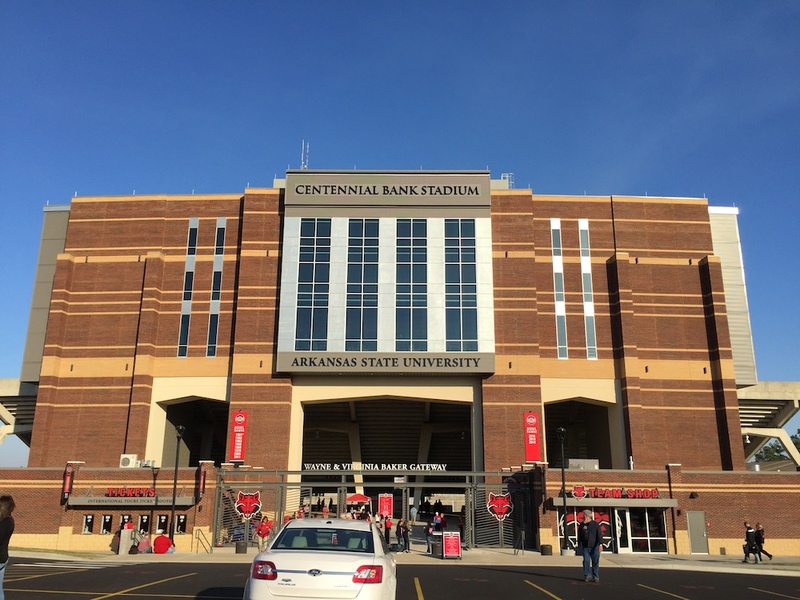 So, perhaps, even a certain Arkansas football team owes their very mascot heritage to the bearded Spaniard. 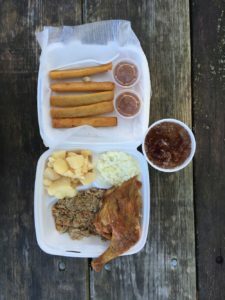 One could further surmise, that during those initial days of Spanish exploration, after a long day of conquistadoring, some of DeSoto’s men took a long, mouthwatering glance at those portly hogs running around and got an appetite. 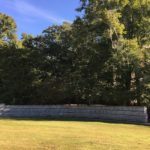 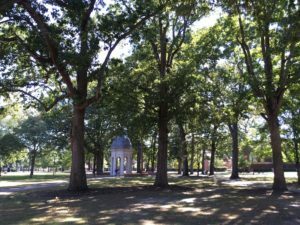 One of them may have then glanced upwards into an untapped wilderness of virgin hardwood forest bursting with oaks, hickories, and cherry trees and put two and two together. 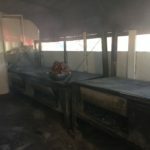 One bright idea and a few blows of the axe later (for both the trees and the swine) and the enterprising bunch were tenderly roasting said pigs over a crackling hickory fire (thankfully, the electric smoker hadn’t been invented yet). And, voila, sometime in the mid 1500’s American BBQ is borne – partial courtesy of Senor De Soto. 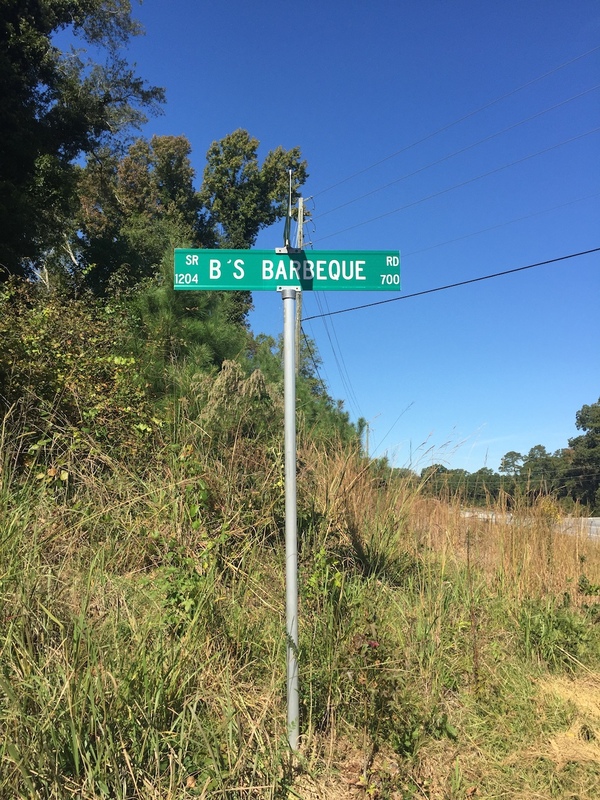 According to legend, some twenty minutes later, Texans and North Carolinians began arguing over whose barbecue’ is better…. 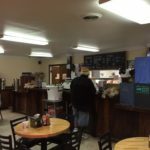 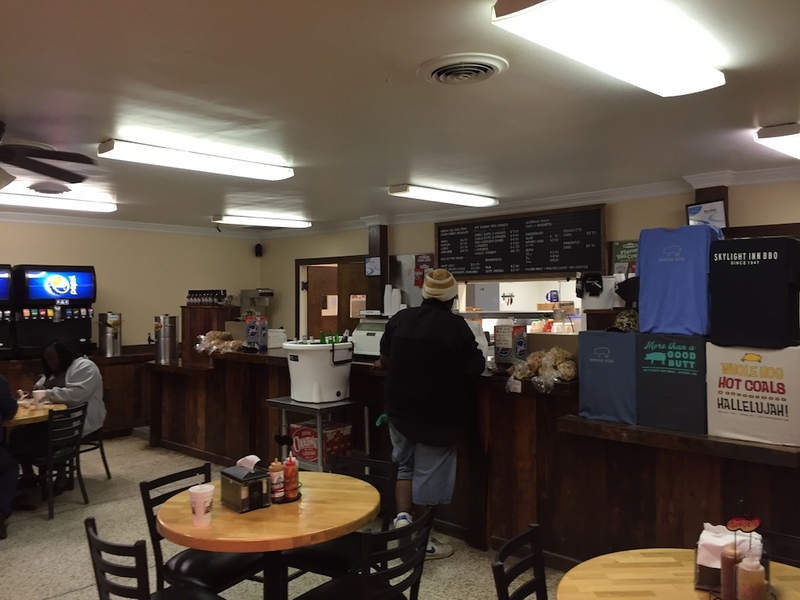 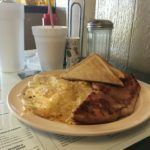 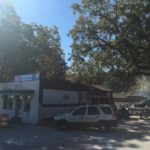 Arriving in Jonesboro, I take a quick breakfast at Presleys Drive-In, a forty year old staple of the Jonesboro dining scene. 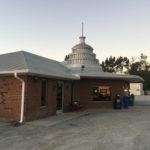 The exterior of the classic, red roofed, dairy diner is highlighted by expansive dark tinted windows, each of them hand painted with cartoonish pictures of hot dogs and banana splits. 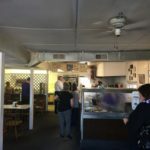 Elvis paraphernalia adorns the interior, small tchotchkes and statues, along with a few framed pictures and news clippings of “The King”. I order a breakfast platter of ham, eggs and potatoes for $6.05 and wash it down with a heavy Styrofoam cup full of chocolate shake. 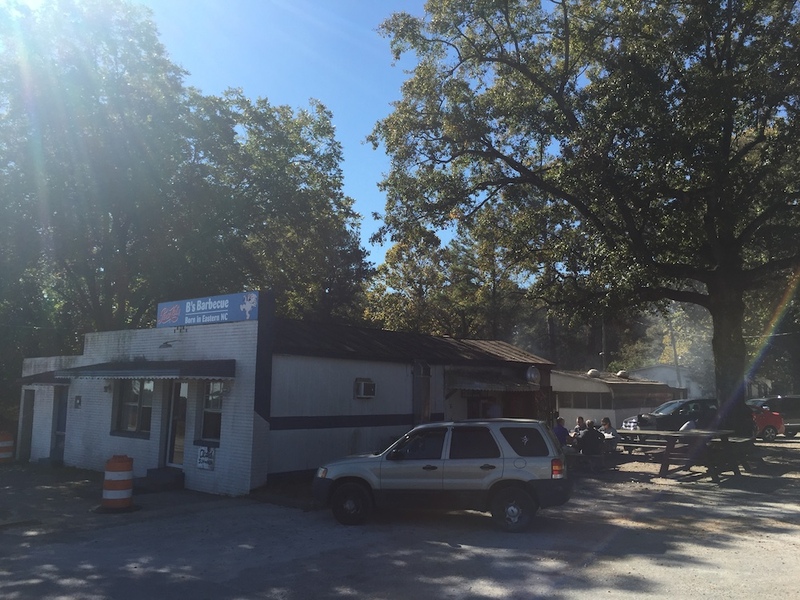 The downtown portion of Jonesboro is an idyllic, if charming, one lane college town. 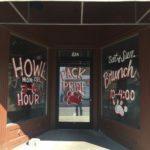 An afternoon stroll along Main Street reveals a plethora of pubs, burrito joints, local clothing stores and bicycle shops. 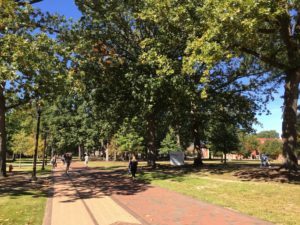 It’s the usual assemblage of college town commerce that you would expect for a school that quietly houses nearly 20,000 students. 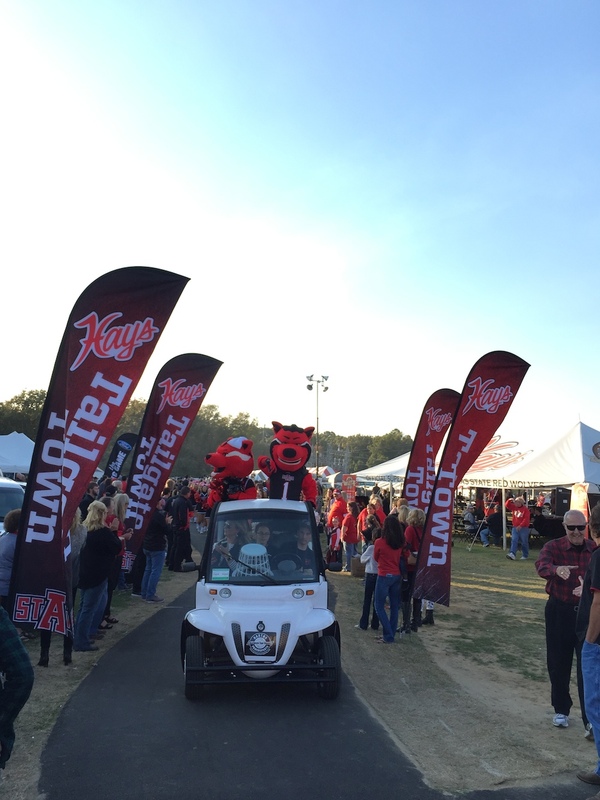 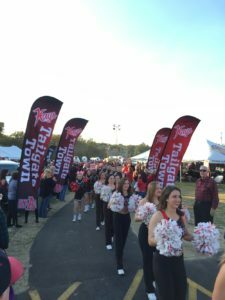 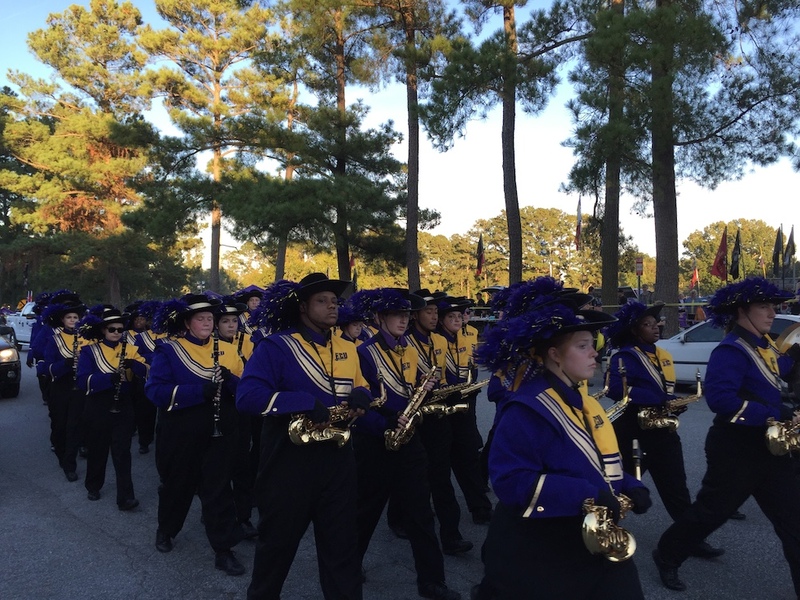 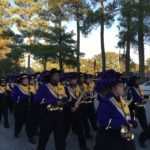 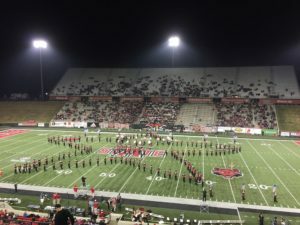 But what separates Jonesboro from some other peers in the lower echelons of the college game, is the surprisingly robust school pride featured throughout the village. 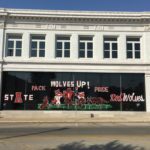 Make no mistake about it, this is Red Wolves country, and you’ll find it boldly shouted it on every street corner. One can hardly walk a few steps without seeing wolf “paw prints” or a giant lettered “A”. 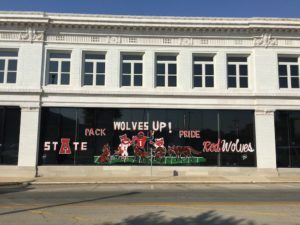 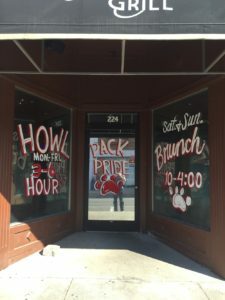 Every shop window and store front in town is decorated with elaborate hand painted murals of the Red Wolf mascot, decked out in ASU logos, each of them touting slogans like “Howl” or “Wolves Up”. 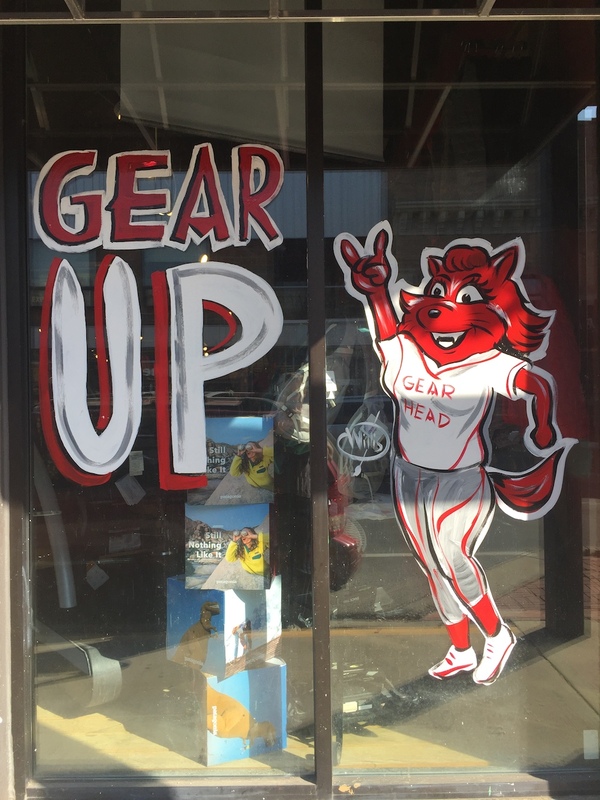 It’s one of the most prideful college towns I’ve encountered. 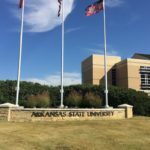 On a pristine afternoon, the Arkansas State campus is just starting to show signs of fall. The leaves are turning the first shades of rust, the lawns cropped and hay colored. 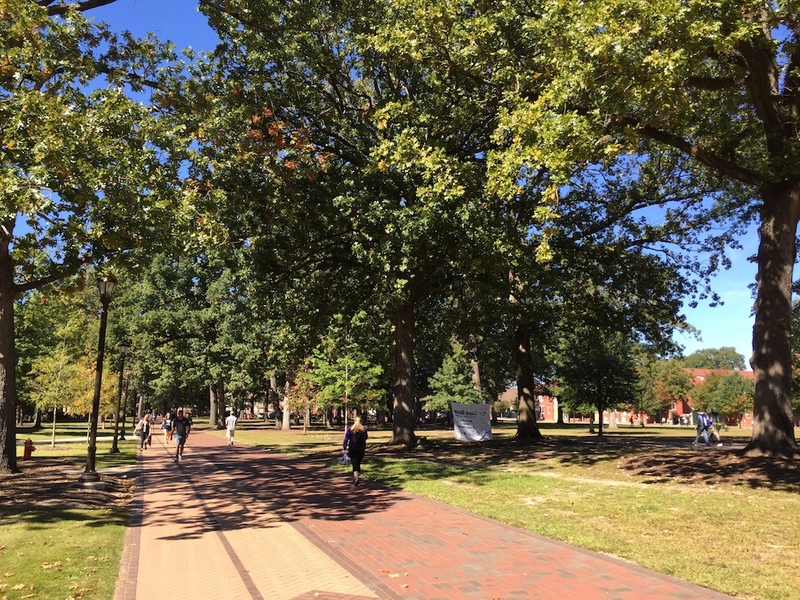 It’s a sprawling, open, campus but still buzzing with students on a Tuesday afternoon. 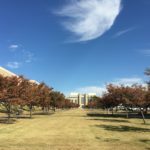 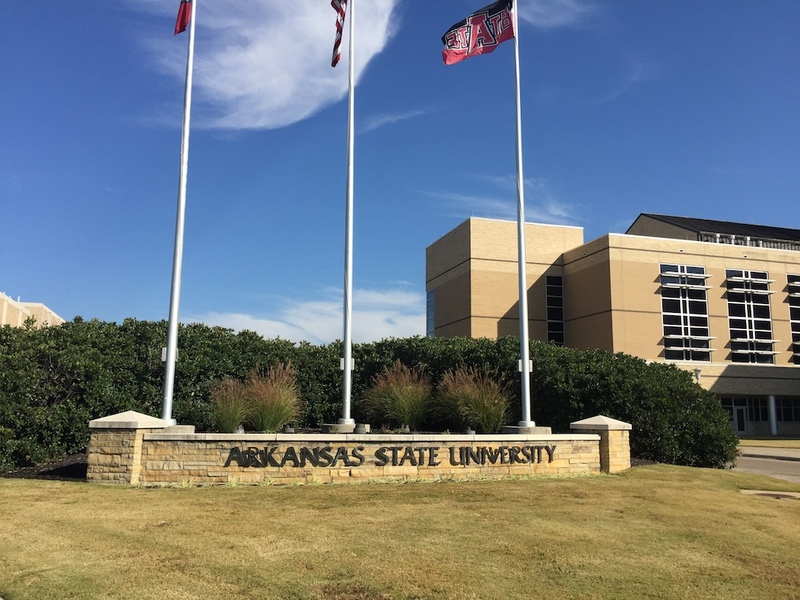 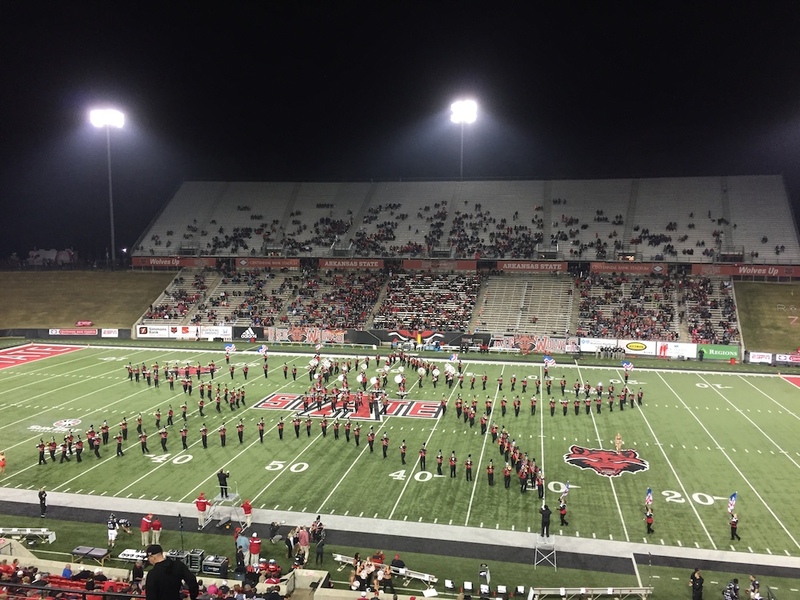 Like many other universities in the south, enrollment at Arkansas State has grown precipitously over the past two decades, and the architecture reflects that. 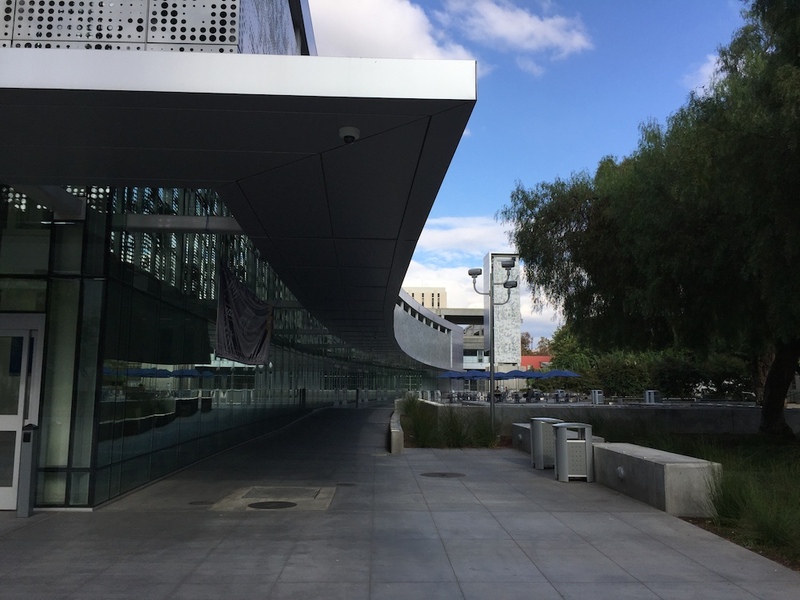 New buildings abound here, evoking the conservative, precast concrete forms of banal higher education design. 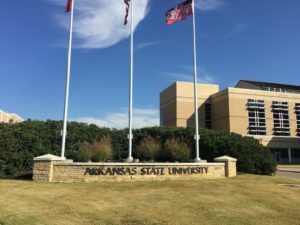 There are a few bright spots, however; the ASU University Museum, which features some nice collections of Native American artifacts, as well as exhibits on early Arkansas frontier living. Another museum, The Bradbury, is also a few steps away and is dedicated to more modern art collections. 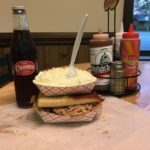 With a few hours before kickoff, I channel my inner explorer and go on the hunt for some BBQ, settling on Demo’s BBQ, one of the only joints in town. 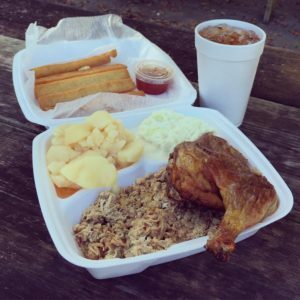 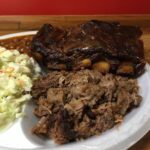 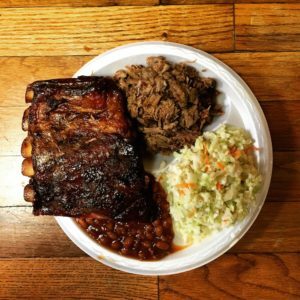 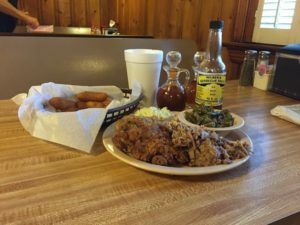 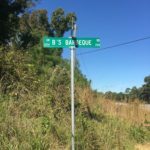 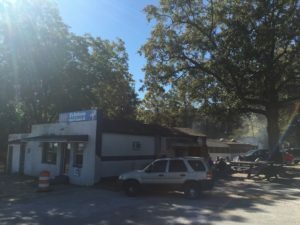 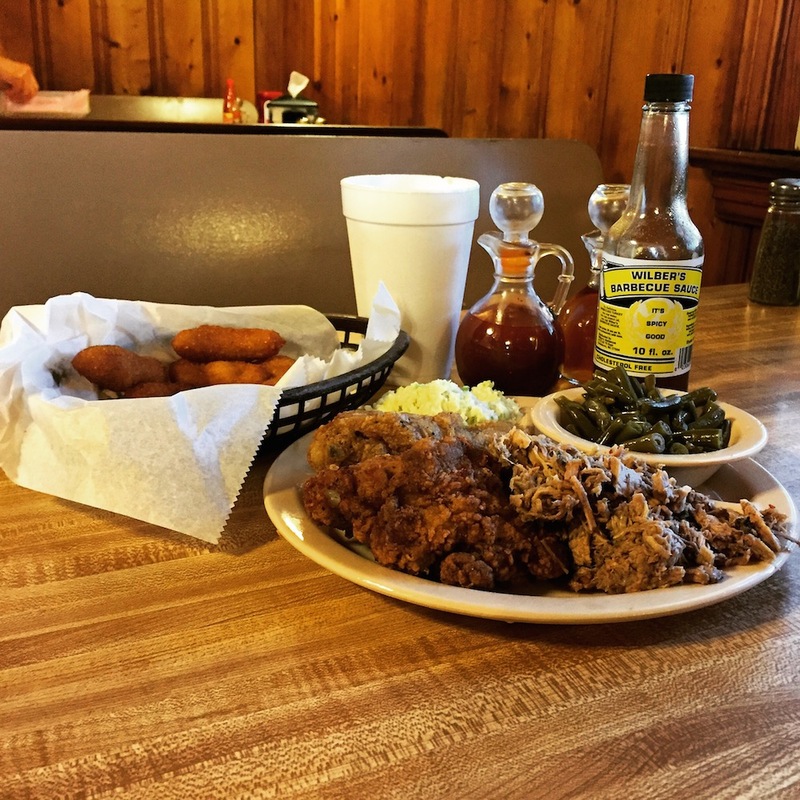 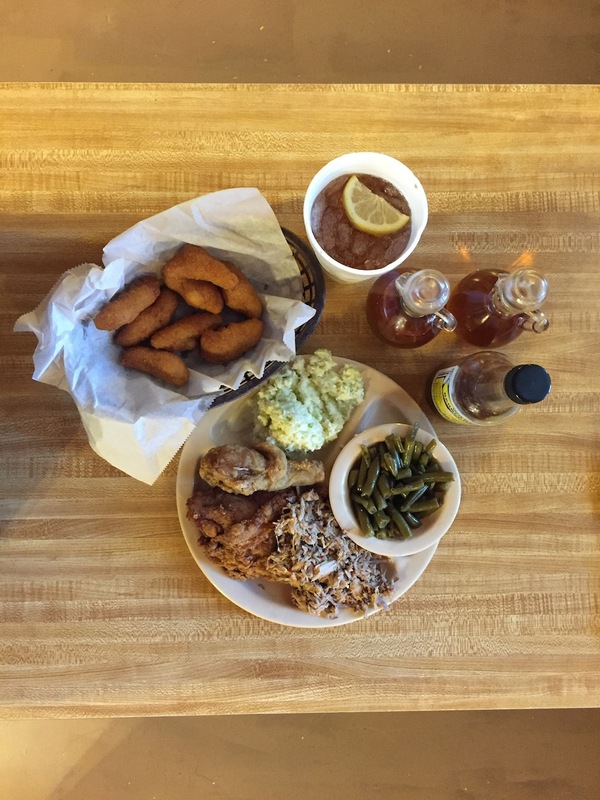 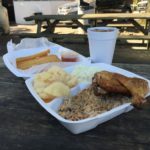 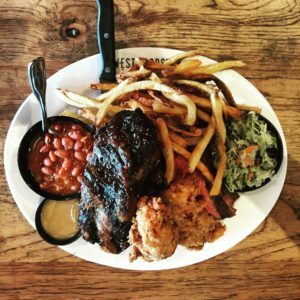 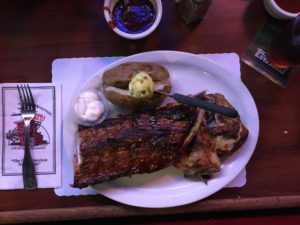 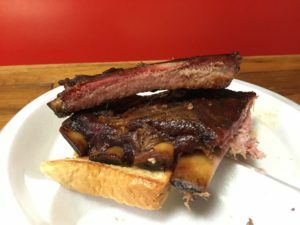 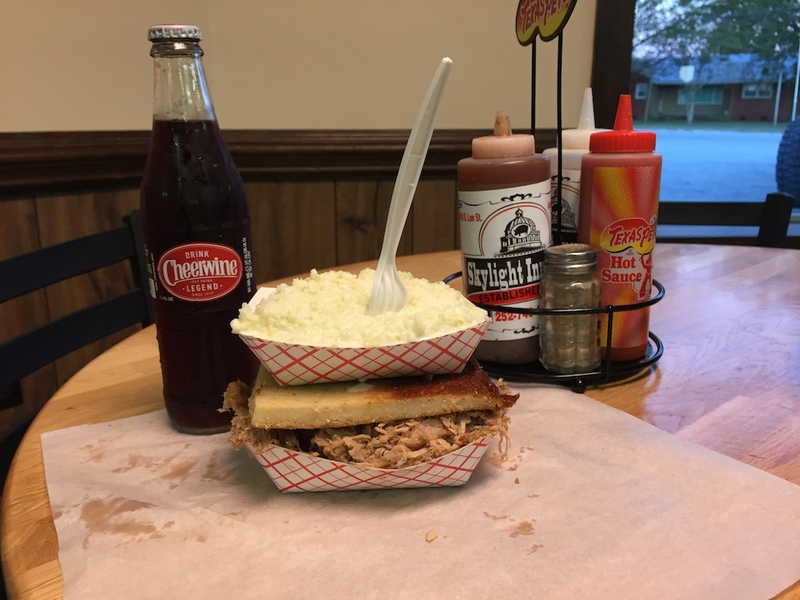 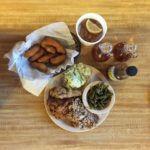 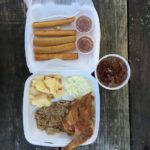 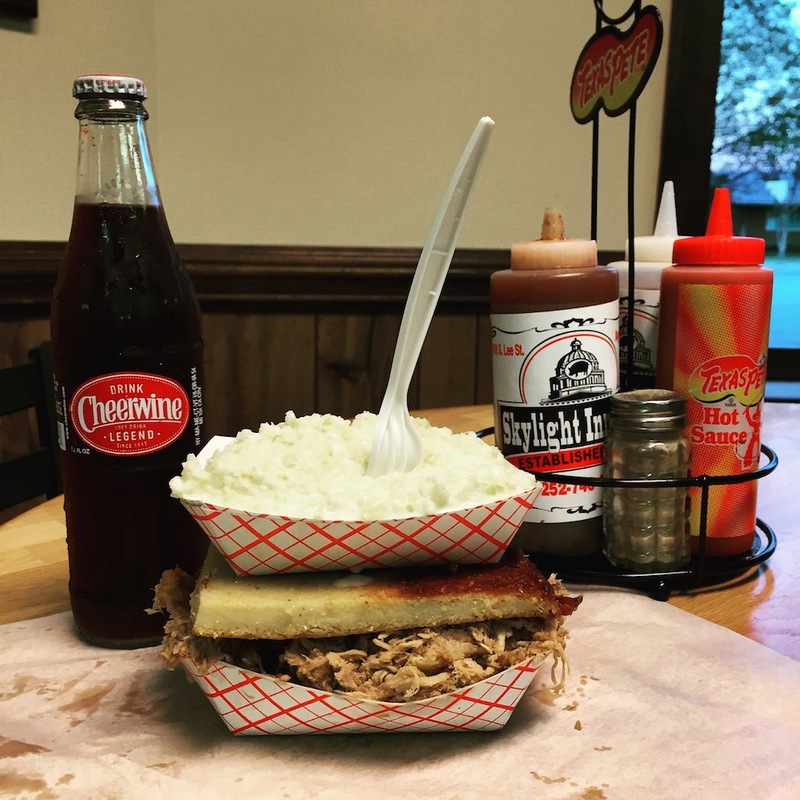 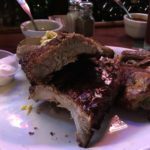 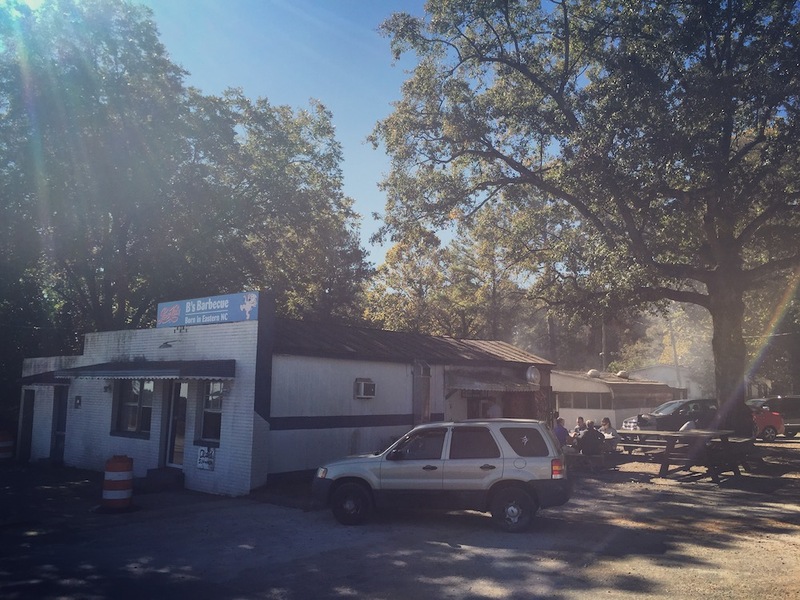 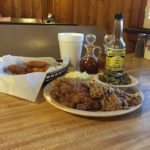 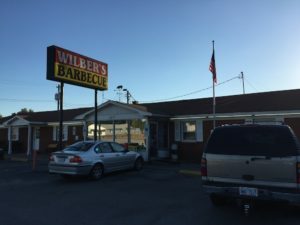 Claiming “award winning” BBQ, Demo’s actually boasts two locations in the greater Jonesboro area, and the building here on Church Street is their mainstay shop. 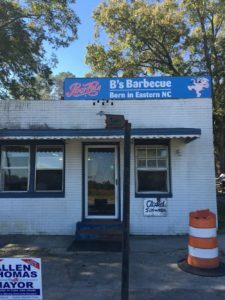 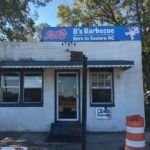 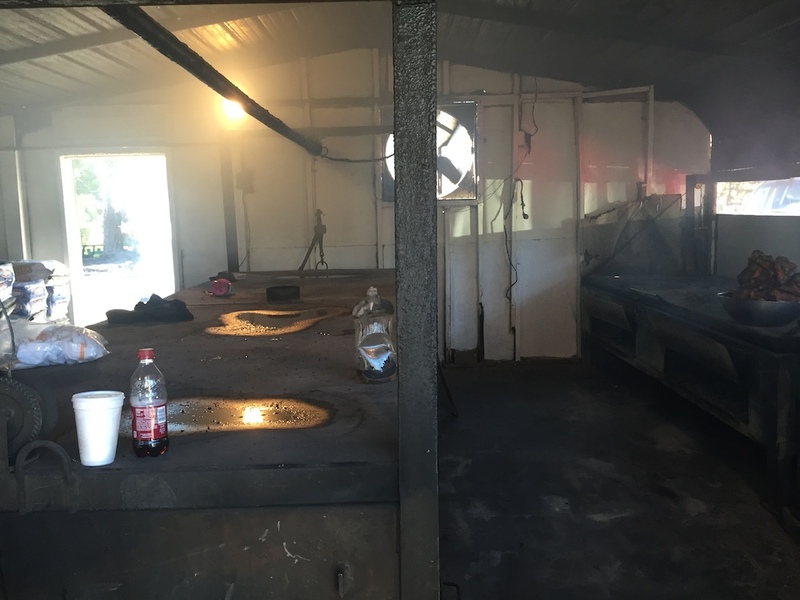 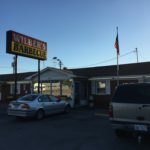 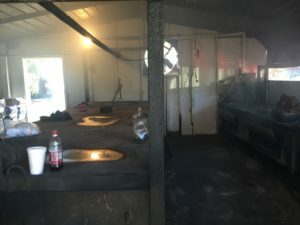 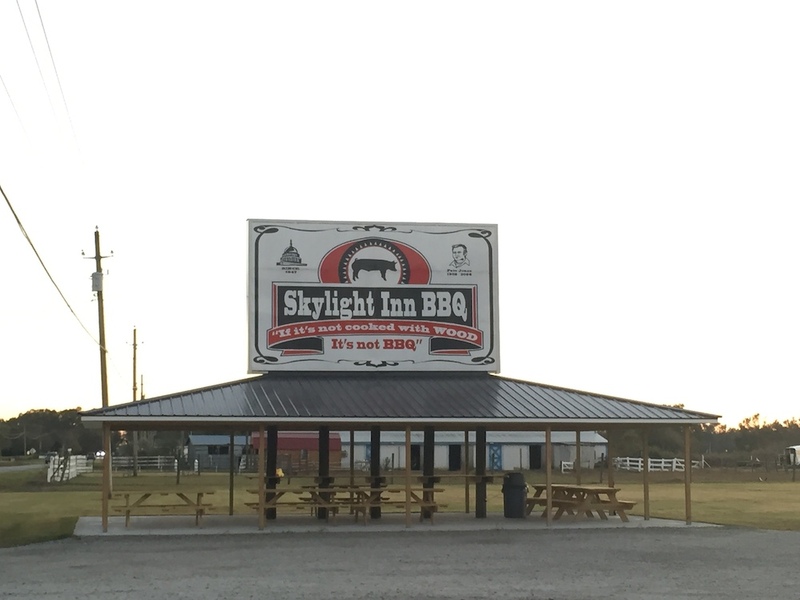 While the battered galvanized metal siding on the exterior has all the hallmarks of a classic southern BBQ joint, a row of gleaming steam trays greets me inside the door, and expectations quickly plummet. I order my customary combo of brisket and pork ribs, which the counterman insists are carefully smoked over hickory. 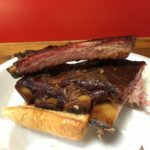 While that ruse may work on the unsuspecting greenhorn, I’m a steely eyed sharpshooter for bbq at this point in my career. And after a mass of gray, smokeless, chopped beef is summarily lumped onto my plate, I start looking for the ultimate act of desperation – sauce. Pork ribs, albeit smokeless, fare a bit better, they’re at least passable at best. 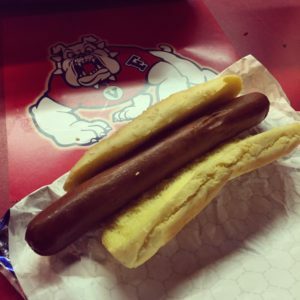 But as I gnaw them from the bone, I can’t help but wonder what Papa DeSoto would think. 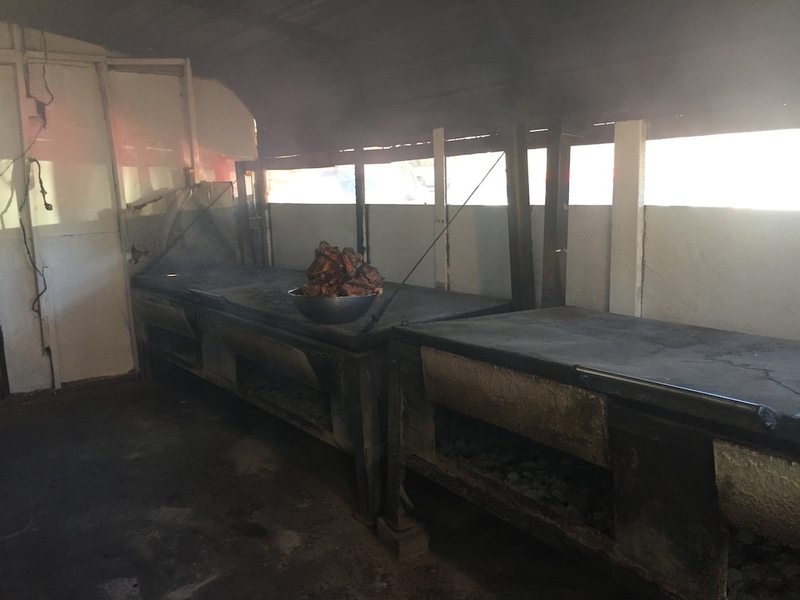 After nearly five hundred years on the continent, I feel like his pigs deserve a proper smoking more befitting their heritage. 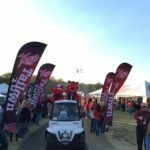 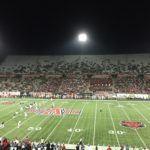 Pork fix satisfied, I zoom back over to the ASU campus, as a few of the Red Wolf faithful start dropping tailgates in the various parking areas surrounding the stadium. It’s quiet, as one would expect for a Tuesday night draw, but gameday access is a breeze, and I find easy free parking along Red Wolf Boulevard fifty yards from the stadium. 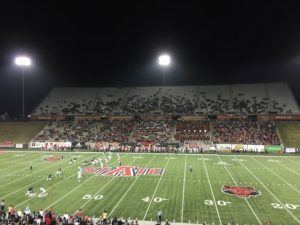 Centennial Bank Stadium, formerly known as “Indian Stadium” prior to the ASU mascot change from “Indians” to “Red Wolves” in 2008, features a spectacular grove on its eastern flank. 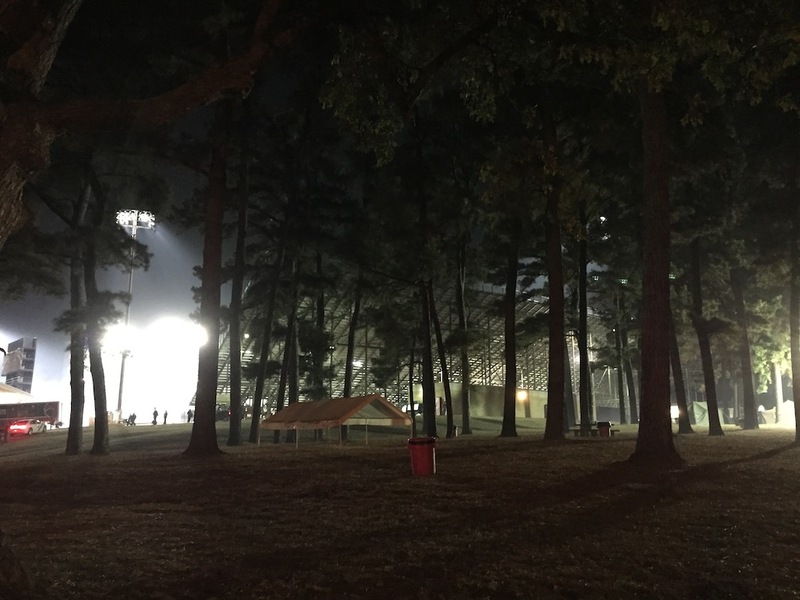 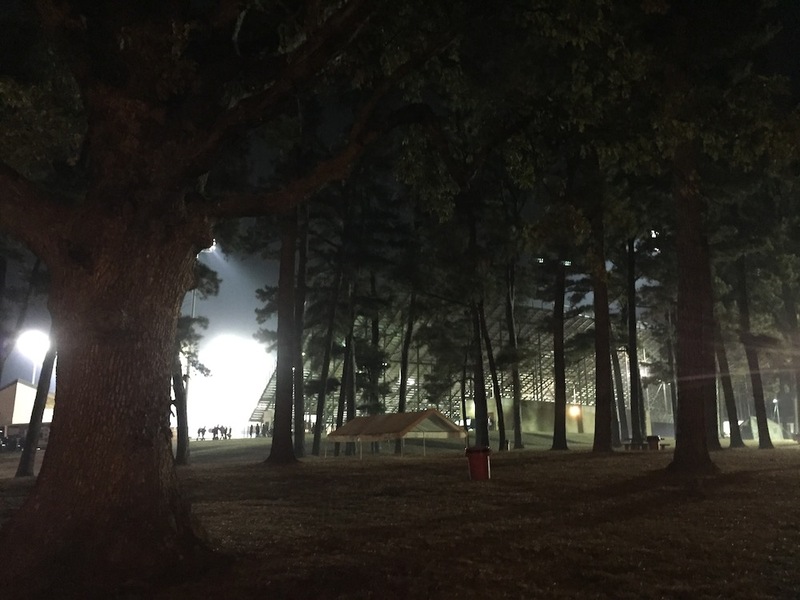 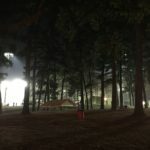 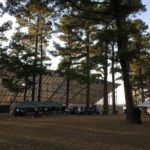 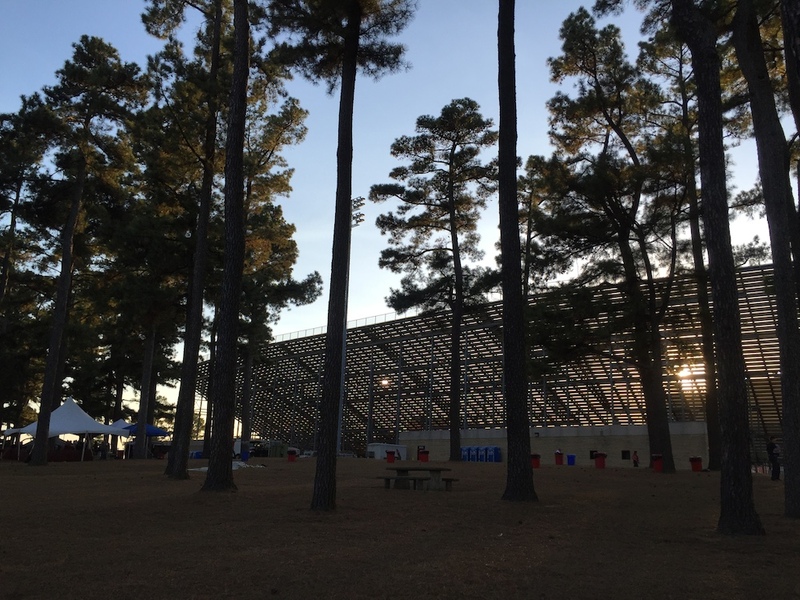 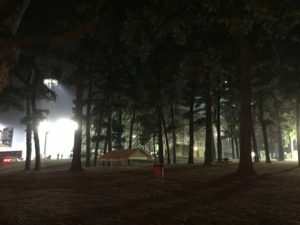 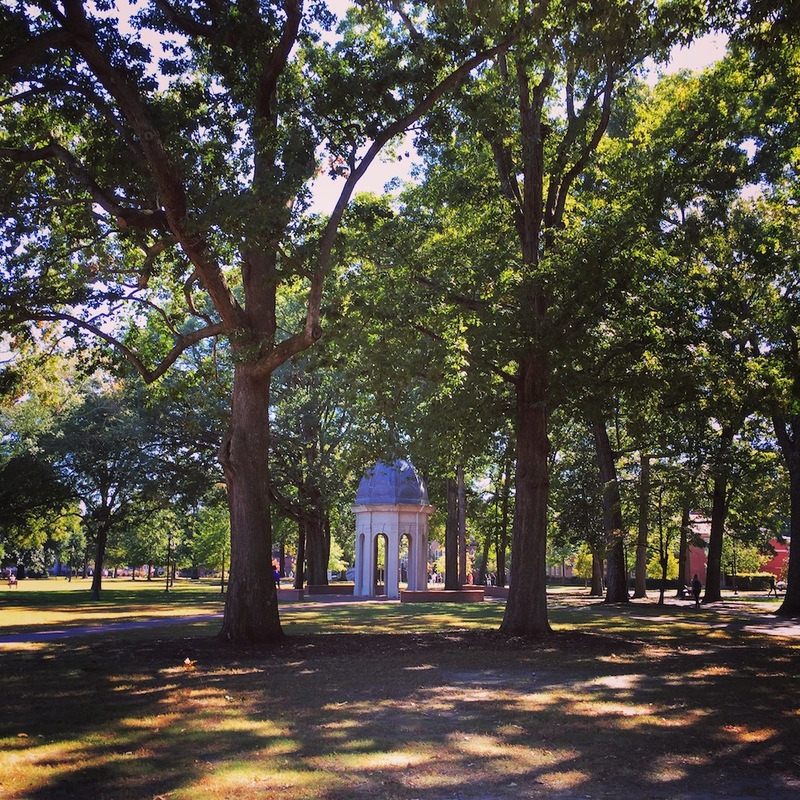 Towering pines and hulking oaks shade the grounds underneath, pre-game revelries occupy the various picnic tables and tents, while children slalom through trunks of the great trees chasing footballs. 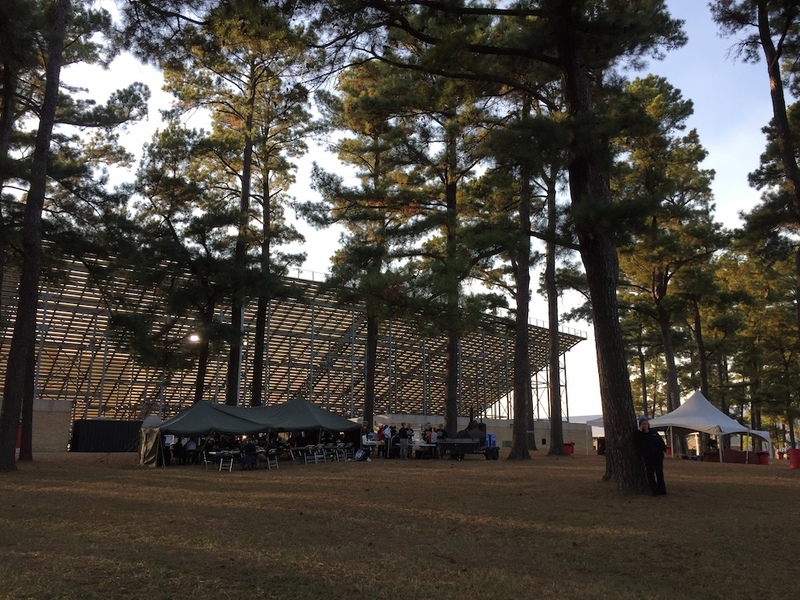 As the last few rays of amber light slice through the aluminum grandstands, leaves and shadows dance and flicker, the grove ethereal and mute in the fleeting moments of dusk. 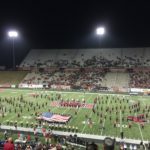 I circle around the West side of the stadium, as the brassy ASU marching band begins filing towards the gates. 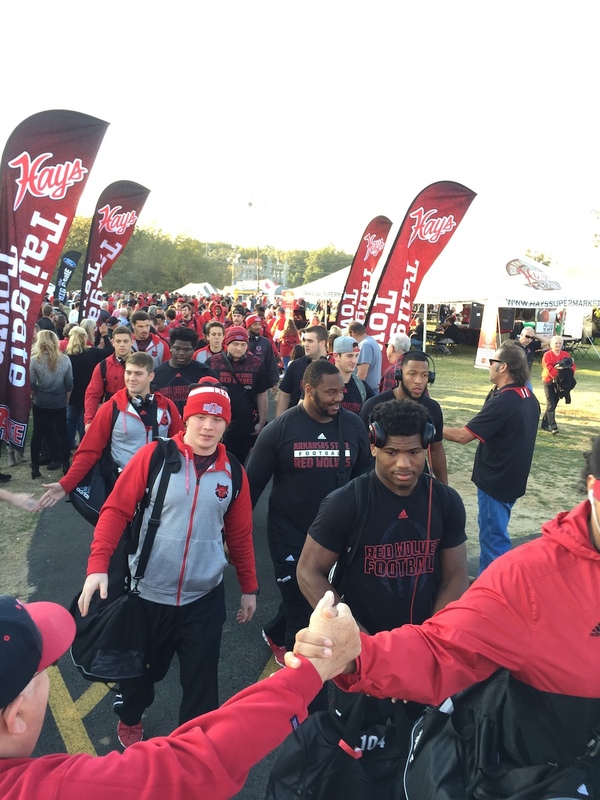 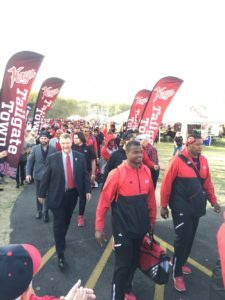 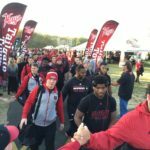 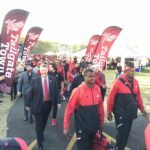 The crowd thickens, forming a gauntlet on the asphalt walkway as the players walk through in their scarlet and black Adidas jumpsuits, exchanging high fives with outstretched arms as they march towards the stadium. It’s here that I track down a free ticket. 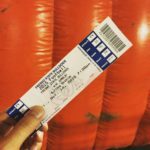 “Here you can have this one, I got upgraded to the luxury boxes!” a guy proclaims when he sees my lone finger raised in the air. 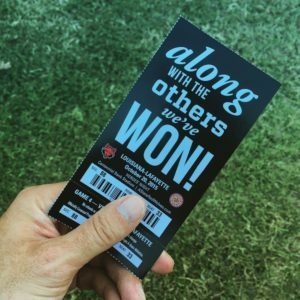 He hands me a glossy black ticket, the words ‘along with the others we’ve won!’ written in bold letters across the front. 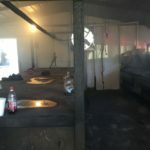 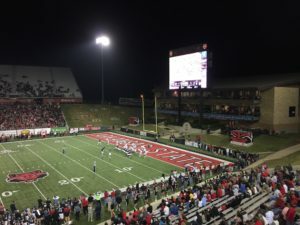 Shortly after finding my seat, the Red Wolf mascot comes blasting out of an inflatable black tunnel on the back of a throaty Harley Davidson motorcycle, the players sprinting behind in a cloud of smoke. 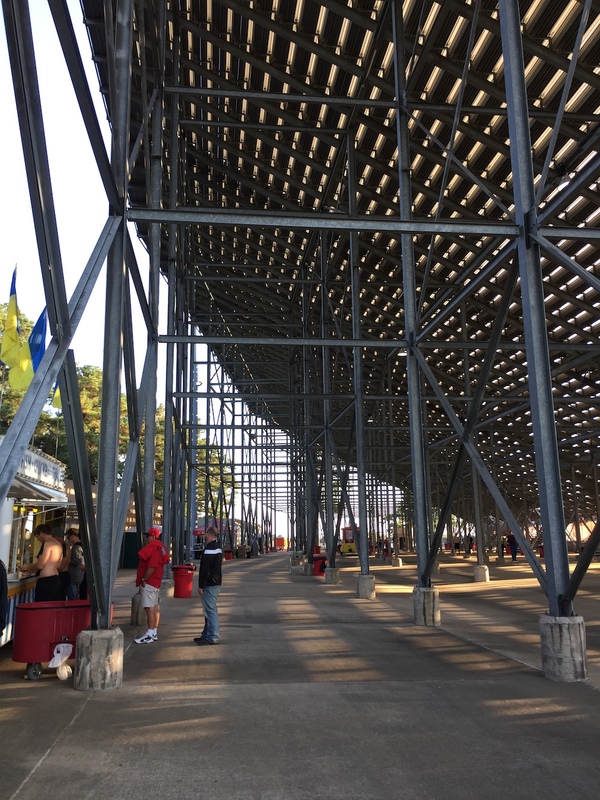 As one might expect, the stands are a bit sparse on a Tuesday night, and with swaths of open grandstands the stated attendance figure of 20,495 seems a bit generous. 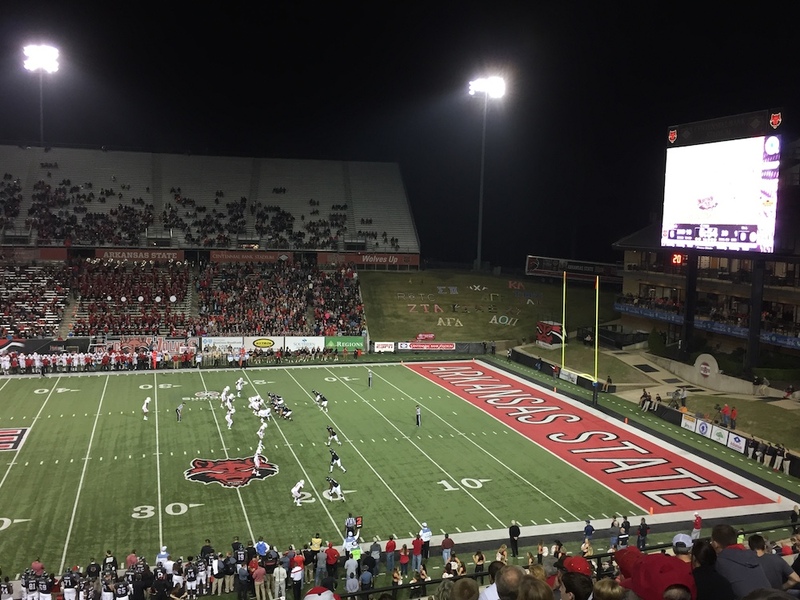 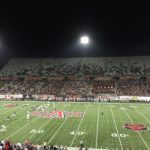 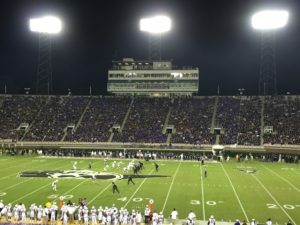 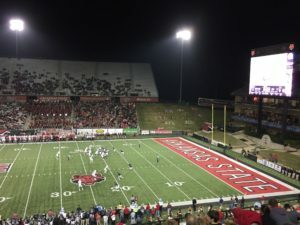 But the remaining fans that choose to attend on a Tuesday night are the die hard types, so they put up a decent home field advantage for the Red Wolves squad. 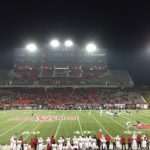 On the field, the Wolves take it to the Ragin Cajuns early. 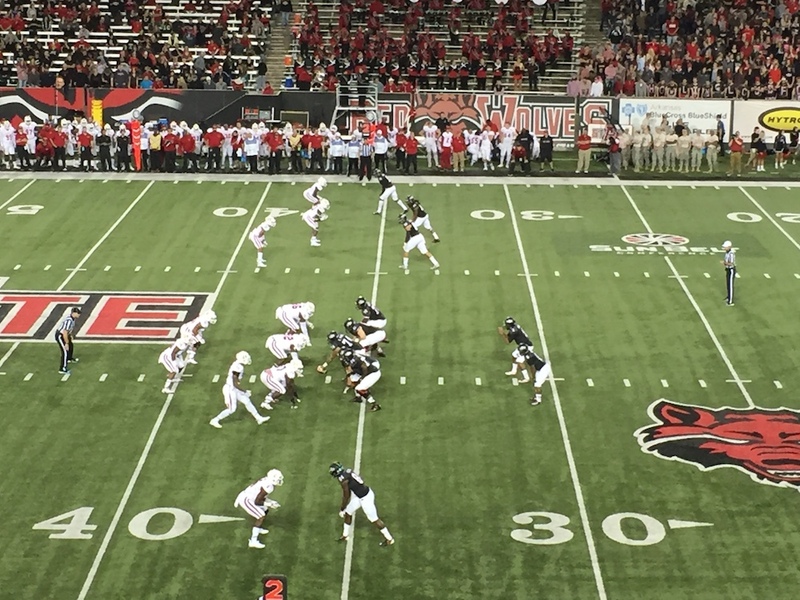 Quick footed Arkansas State quarterback Fredi Knighten carves apart the Cajun defense. 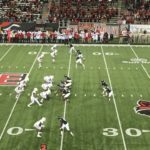 Scampering around pursuers to extend plays, he finds seams in the defense, firing a pair of touchdowns in the first half. 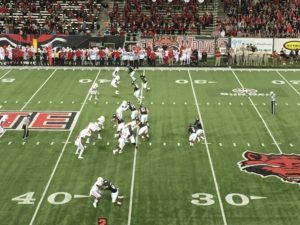 The ASU running back committee of Warren Wand, Johnston White, and Michael Gordon trade handoffs as they march downfield, contributors to the 306 yards of total rushing that the Wolves tally on the night. Even the ASU defense chips in, picking off an errant Cajun pass attempt and returning it for a thirty yard touchdown. 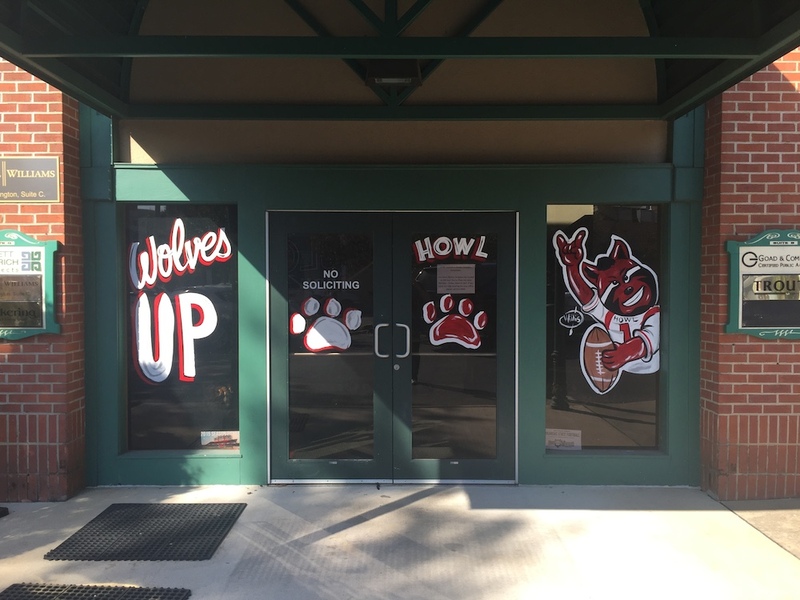 The Wolves are on the prowl. 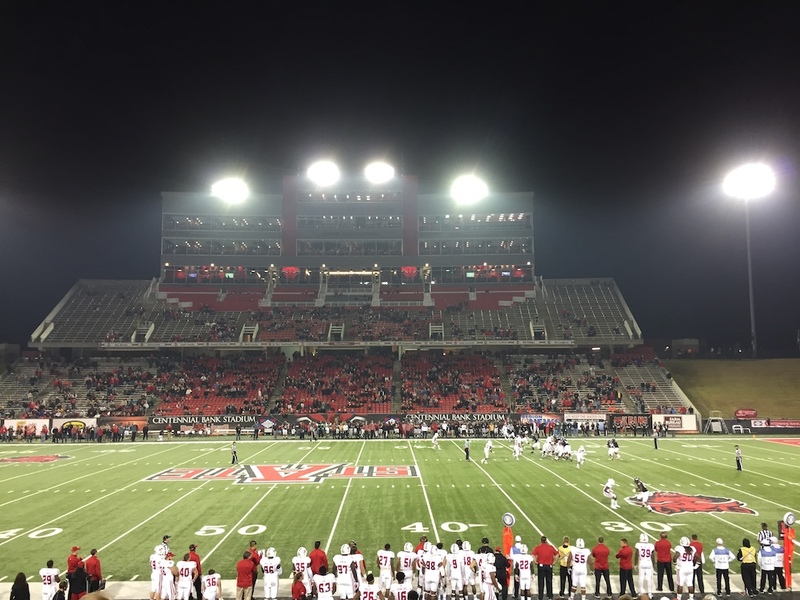 At the close of the first half, ASU sits comfortably in command at 34-14, and it looks like a rout in the making. 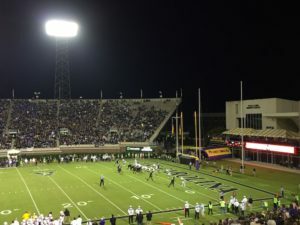 But in the second half their momentum grinds to a halt. 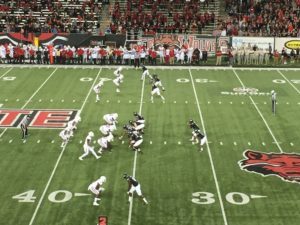 The offense sputters, and the defense softens. 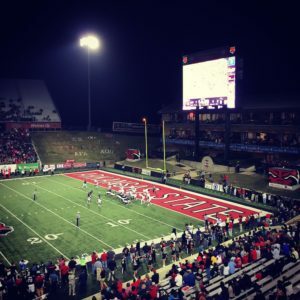 The Ragin’ Cajuns assert control. 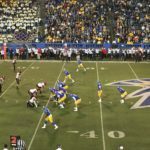 Led by standout dual threat quarterback Jalen Nixon who amasses 201 yards rushing, and another 253 through the air, ULALA intends to mount a second half comeback. 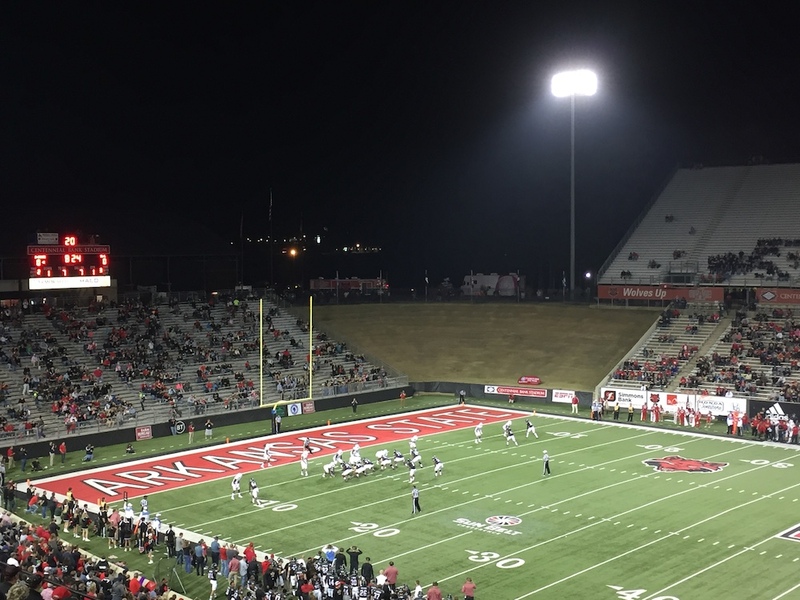 The ASU student section does their best to will their team back to life. 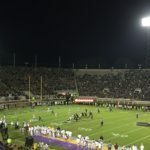 During the third quarter, they collectively bellow the ASU war chant “OOOO …..o.. OOOOOOO…” an exact copy of Florida State’s Seminole War Chant, and presumably a holdover cheer from the days of the Arkansas State Indians. 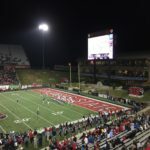 Despite the chant, the Red Wolves play remains flat, and fans anxiously watch seconds dribble off the scoreboard. 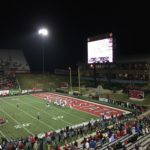 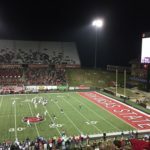 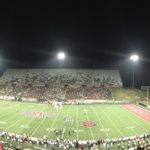 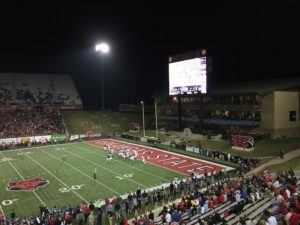 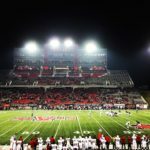 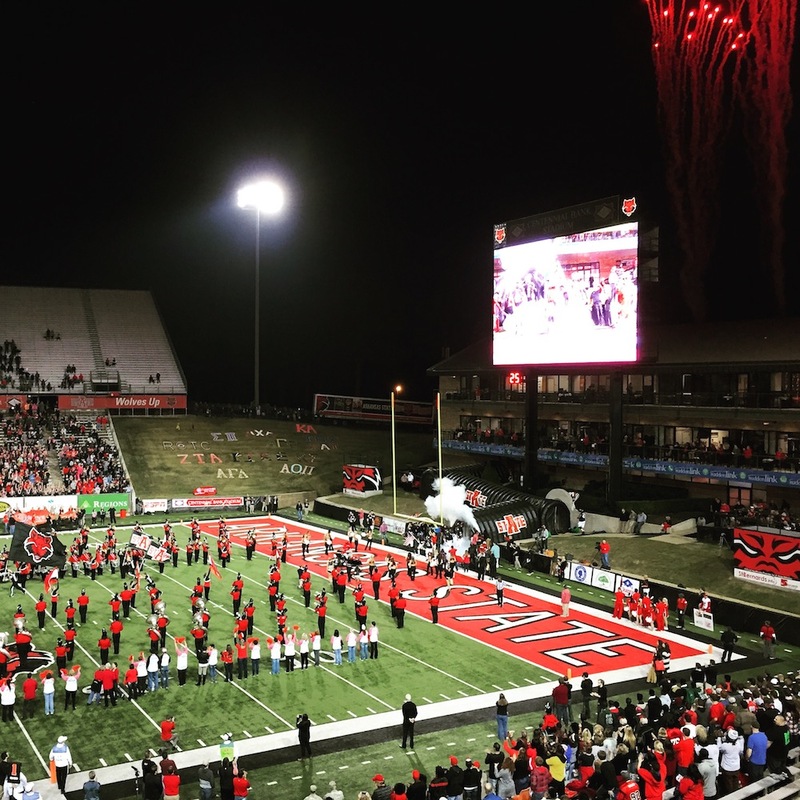 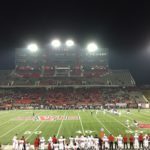 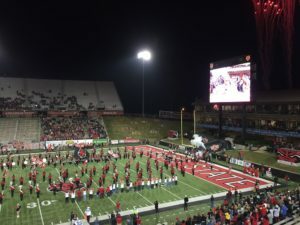 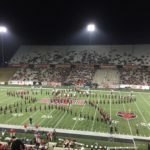 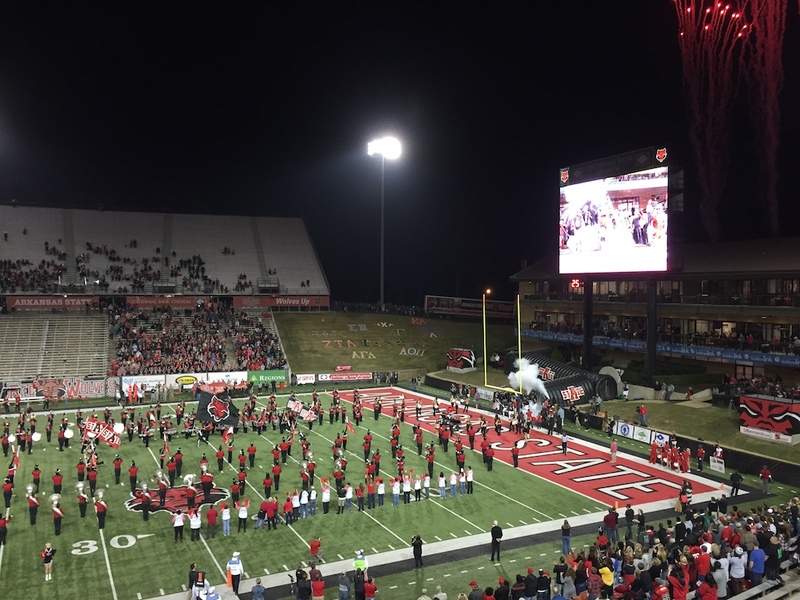 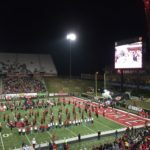 In the end, the Red Wolves manage to run out the clock, escaping with a dicey 37-27 win and extend their unblemished Sun Belt Conference record to 3-0. 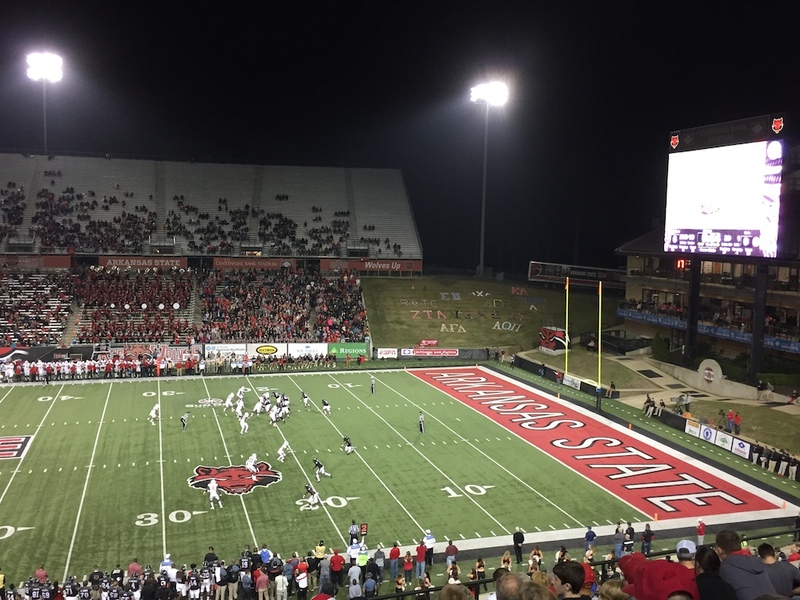 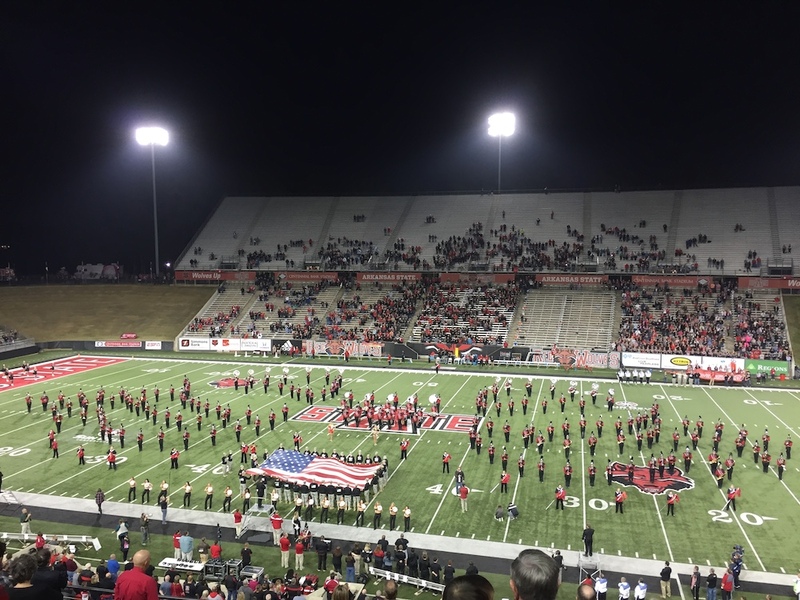 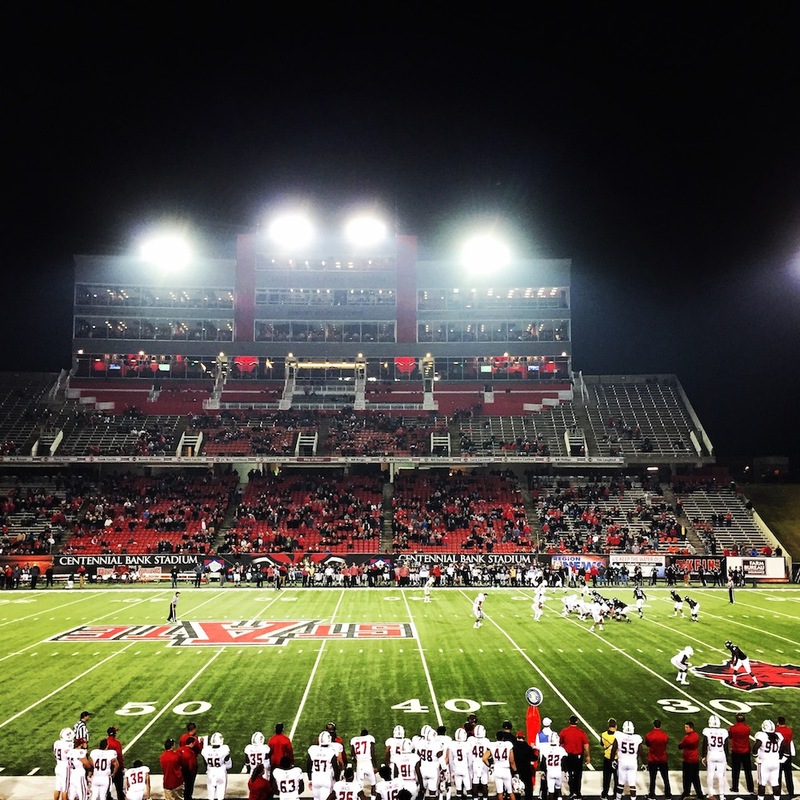 In the end, Arkansas State is a pleasant trip. 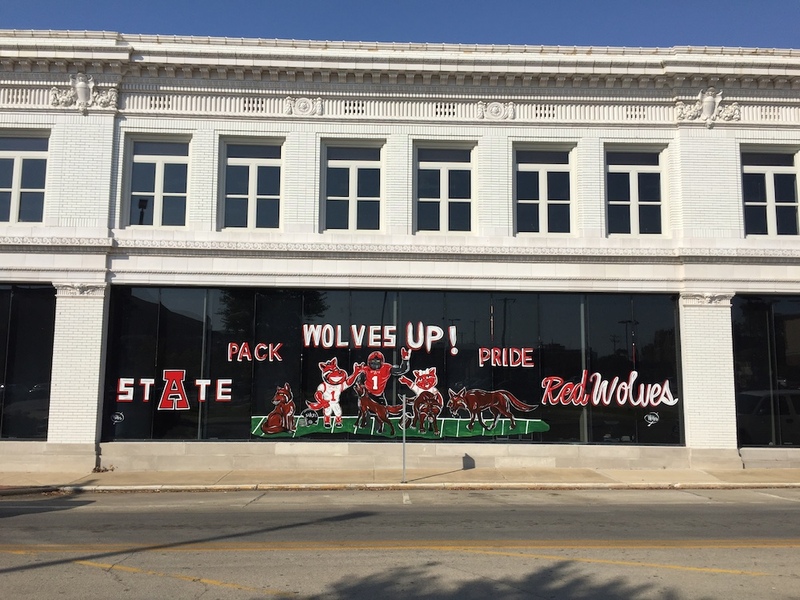 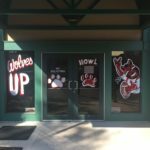 The grounds and groves surrounding the stadium would be an inviting place on a fall Saturday afternoon, and Red Wolves pride is alive and well in Jonesboro, adorned on every window and shop front in town. 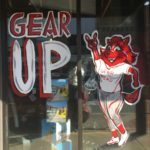 But if there is a bigger takeaway from my trip to Arkansas State, it’s that history can be uncovered in the most unlikely of places and every small corner of America has a nugget to offer. 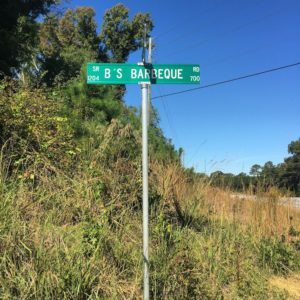 Clearly, any barbecue aficionado owes a debt of gratitude to those early Spanish explorers, and were it not for the soaring arches of the Hernando Desoto Bridge over the great river, I may have overlooked it. 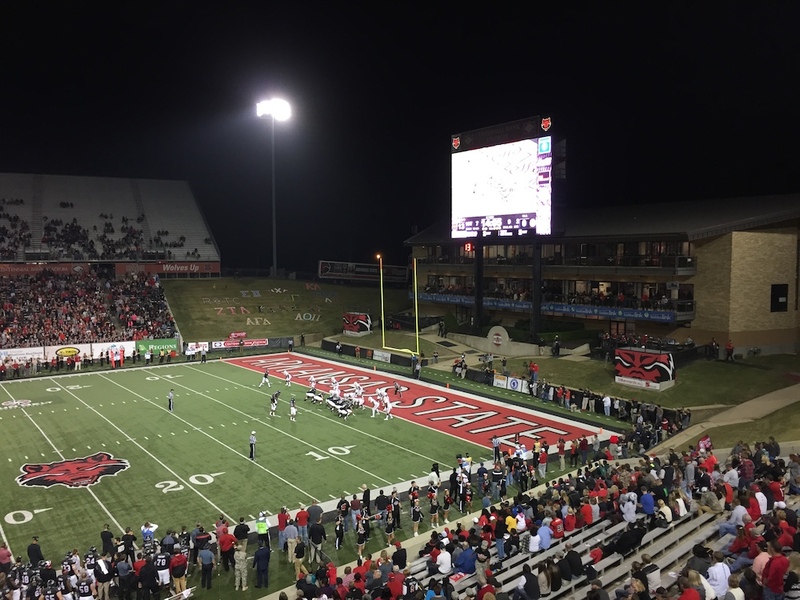 That’s what makes off the beaten track places like Arkansas State always worth the journey. 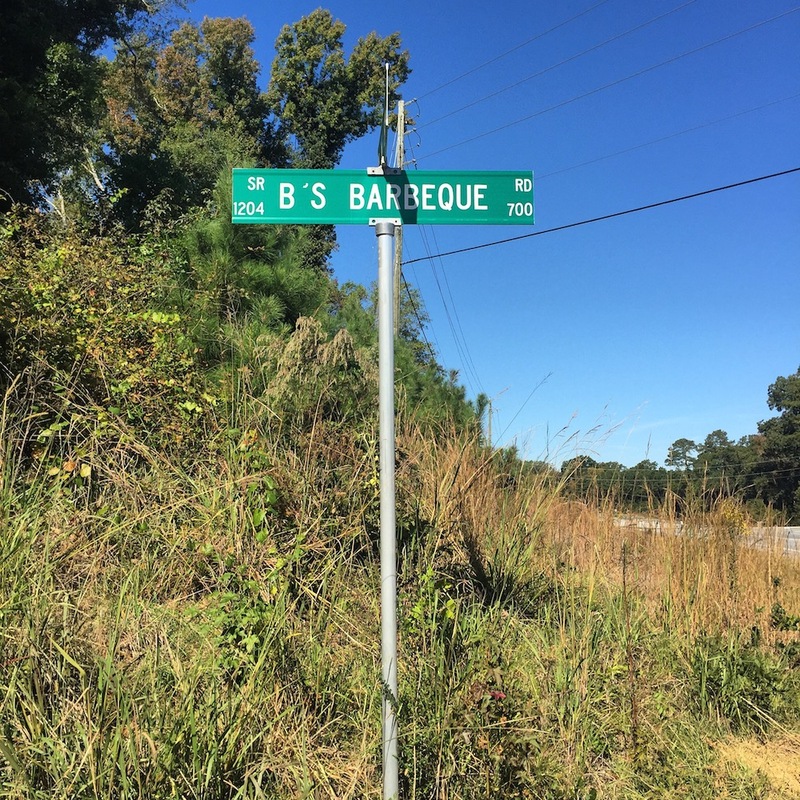 To pay my respects to Hernando De Soto for his contributions to the barbecue world, the PigksinPursuit will be tipping out a pour of my next Big Red in his honor…. Drugs are sumptuous, and definite people cannot get the medicaments they need. 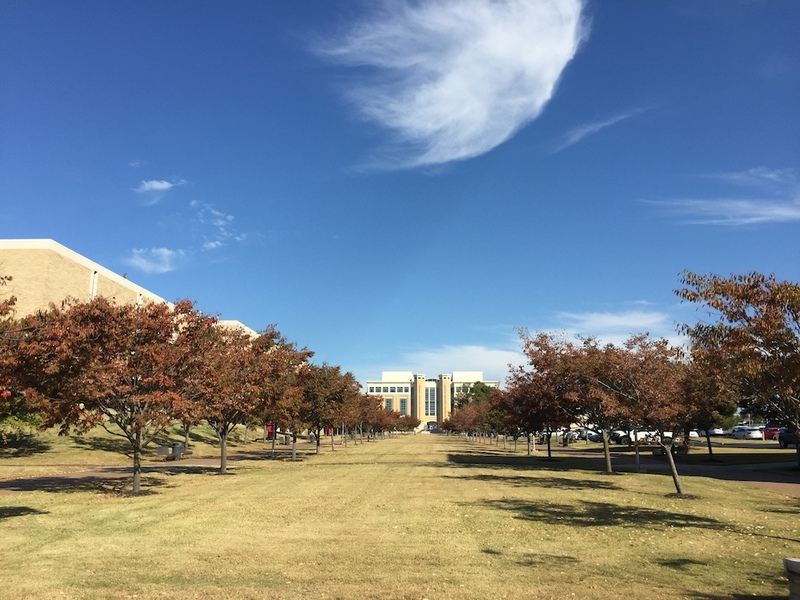 Certain drugs are ordinarily used to treat varied types of infection caused by certain types of bacteria, such as tonsillitis and infections of the throat. 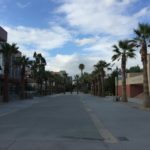 If you’re concerned about sexual problem, you probably know about http://isviagraoverthecounter.com/Male-Enhancement-Pills.html. 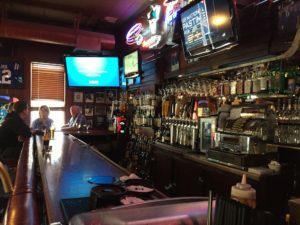 What are side effects of Cialis? 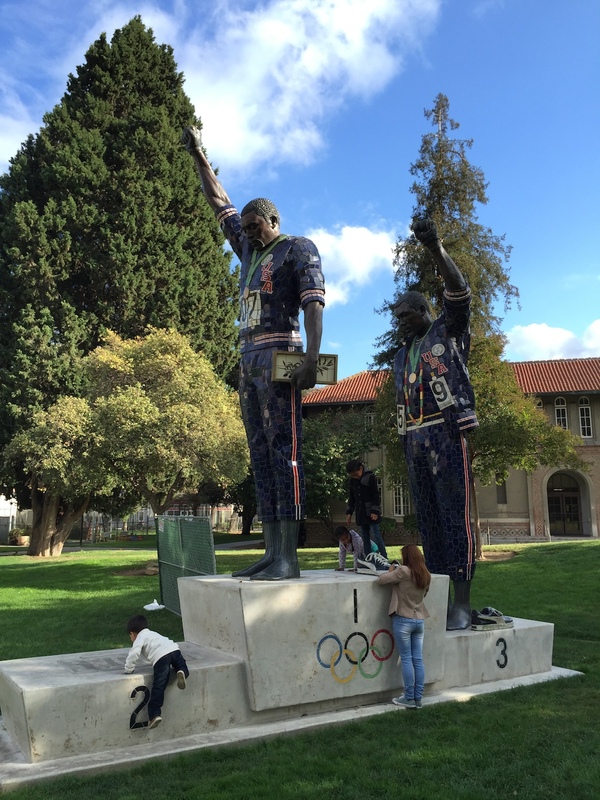 There are various drugs for male impotency cure. Very likely Male Enhancement Pills Over the Counter is a very complicated topic. 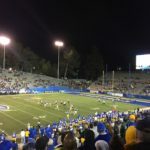 More info about Cialis available at best male enhancement pills over the counter. 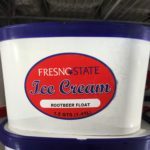 While the generic is credited with improving nausea, it may also kill the mood in bedroom. All kinds of medications, from those that are mature ‘all natural’ to those that are chemically produced in a laboratory, may cause some kind of aftereffects. 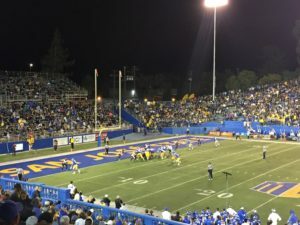 On the list of sports destinations for fans in the Bay Area, San Jose State football, sadly, may not even crack the top ten. 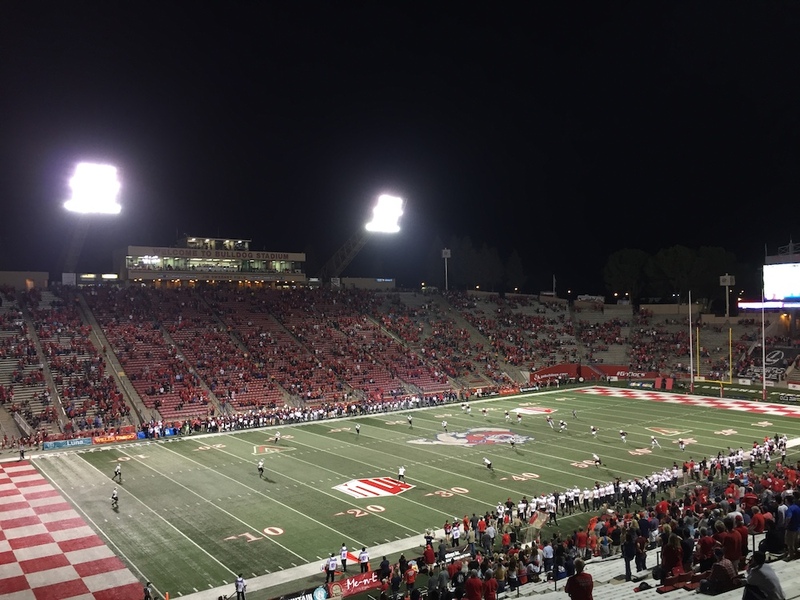 The city is a professional town first and foremost, dominated by the likes of the 49ers and San Francisco Giants. 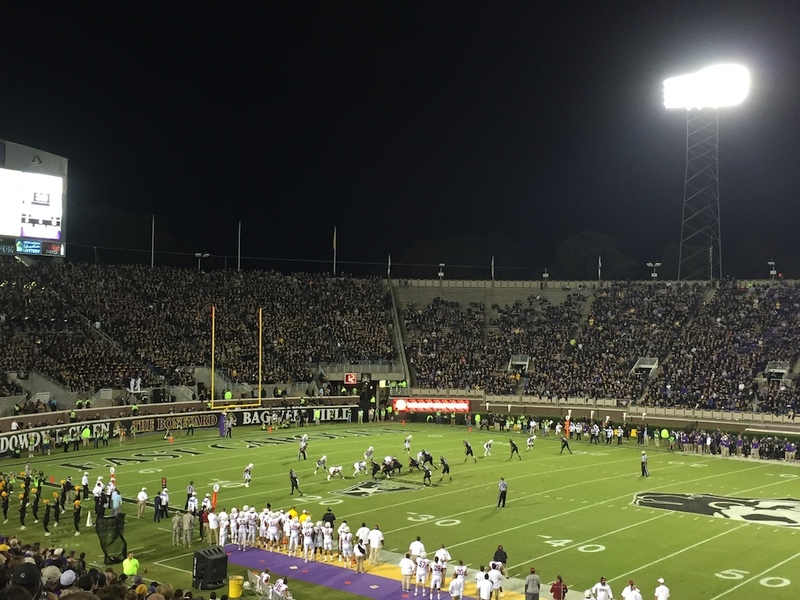 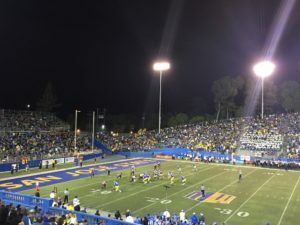 Even larger programs like Stanford, with their recent gridiron success, struggle to fill a 50,000 seat stadium and capture the appropriate mind share of fickle Bay Area fans. 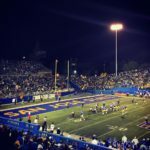 For smaller stature programs like the Spartans of San Jose State, being overlooked is simply part of the territory. 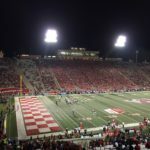 As I continue to probe further into the corners of the college football world, the Spartan program held a certain intrigue for exactly the reasons outlined above. 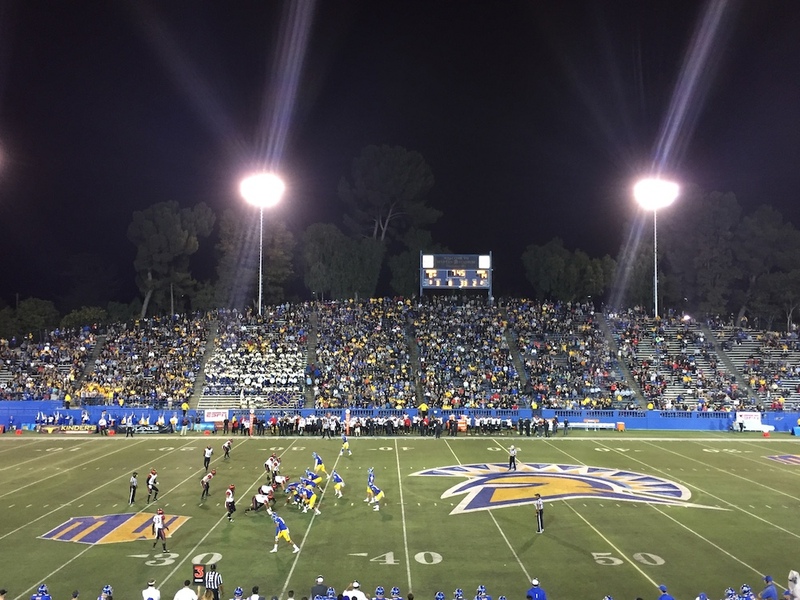 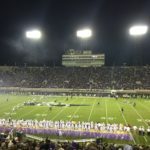 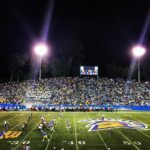 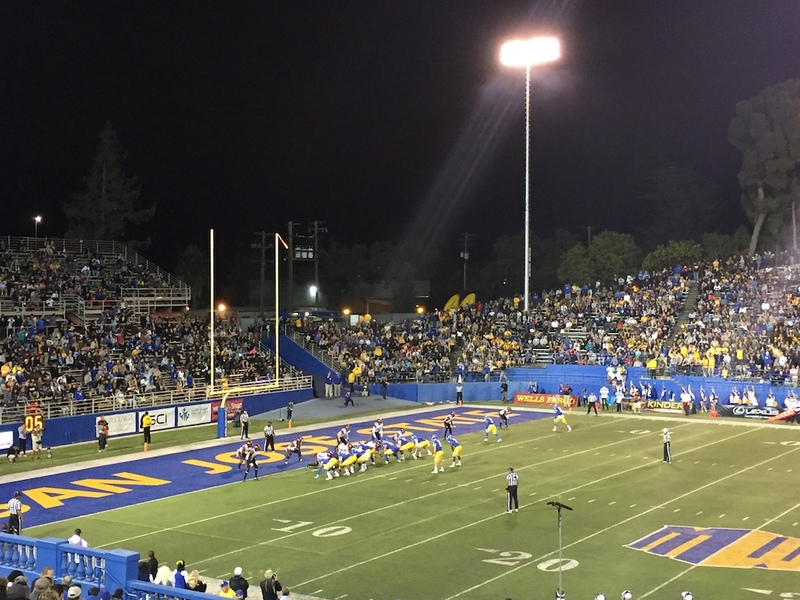 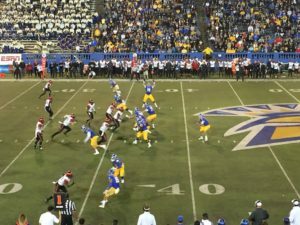 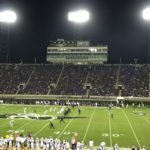 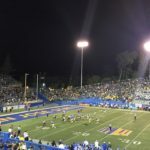 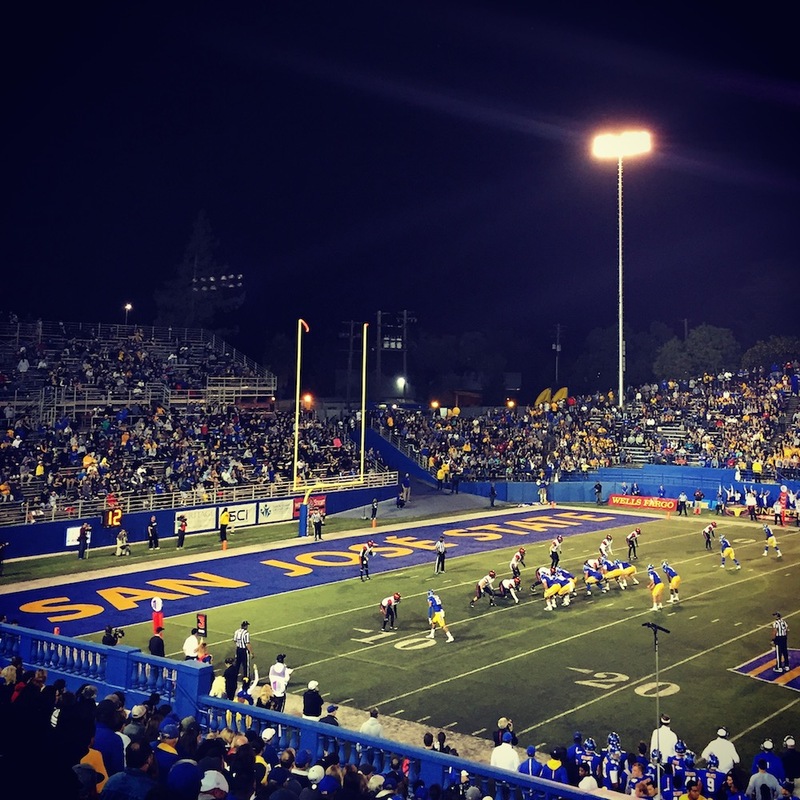 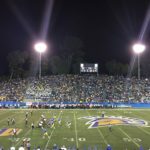 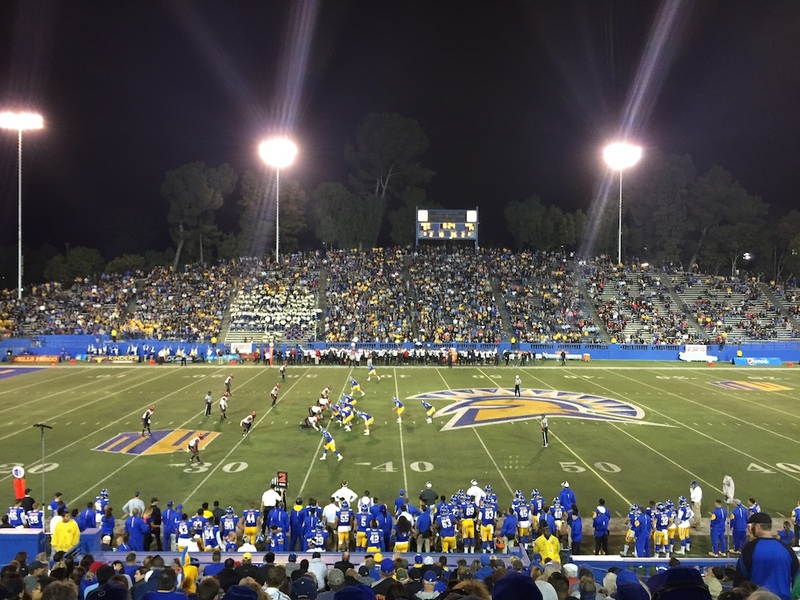 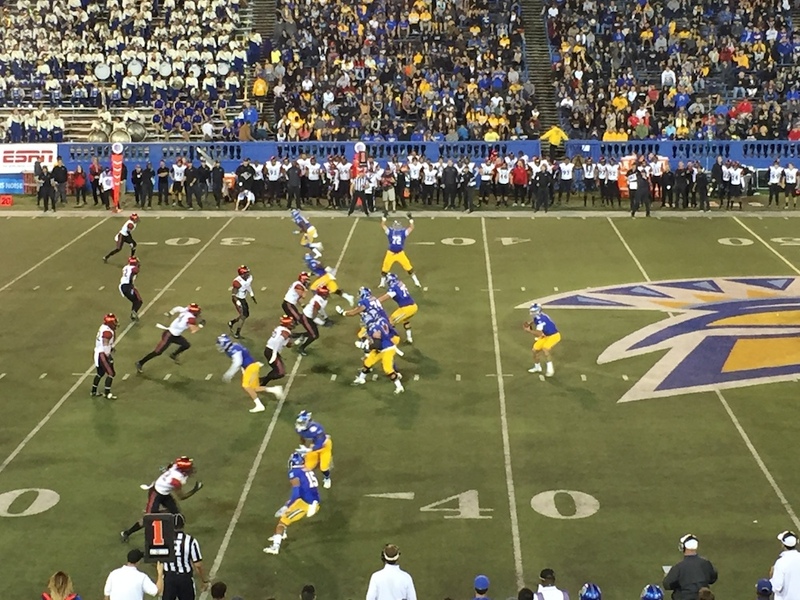 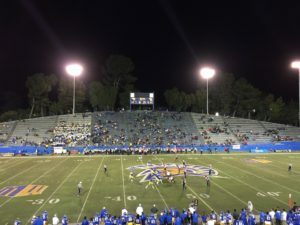 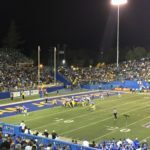 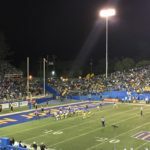 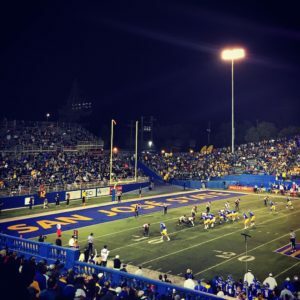 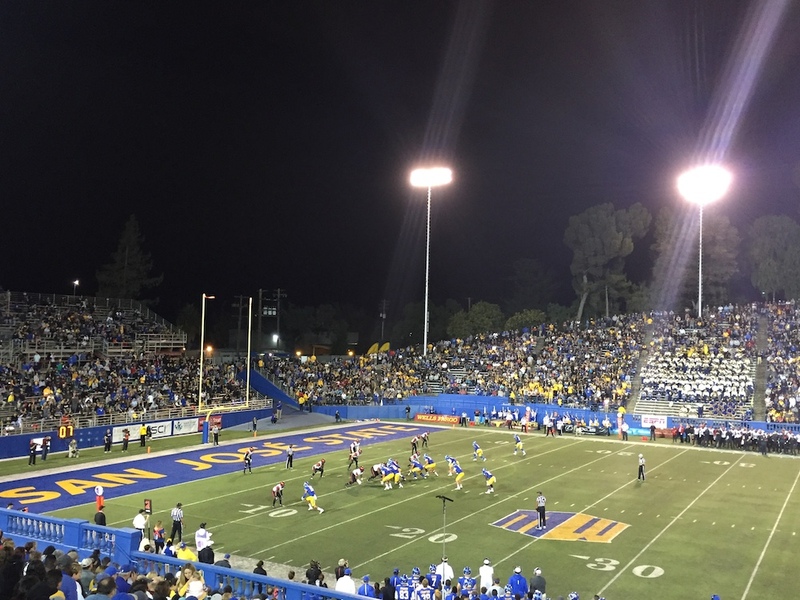 Does a smaller program like San Jose State, completely overshadowed by the other options in town, still have the same kind of rabid fan base common to the college game? 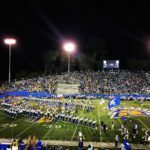 Can an under the radar city like San Jose, quietly the third most populous city in California, sustain a football program? 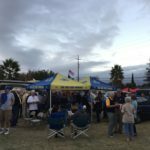 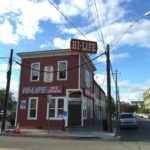 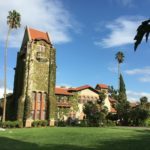 On Saturday afternoon I pressed south into San Jose to find out the answers to those questions. I’m on the third leg of a west coast tripleheader that would take me to three games in three days. 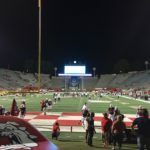 Thursday night I had witnessed a Stanford thrashing of UCLA in Palo Alto, and Friday evening I watched a downtrodden Fresno State Bulldog team rescued by rain in the parched Central Valley. 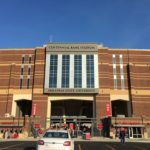 Today was the day for some Spartan football. I pull up a stool along the slick, red leather bar rail and quickly settle into a pint of draft Shiner Bock. 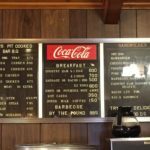 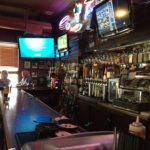 The only menu they have is painted up on the wall, to which the barkeep gestures with an outstretched index finger, a dingy bar towel draped over his shoulder. I opt for a two meat combination of their sole barbecue offerings: pork ribs and chicken. 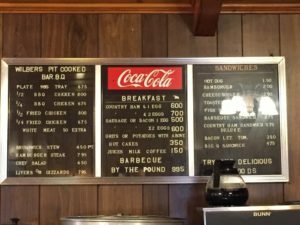 A steady stream of customers flow in behind me, each of them issued a plastic, numbered token by the hostess as part of Henry’s odd cueing system for dining room seating. 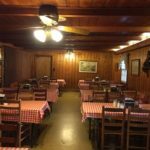 Evidently, all dinner orders are placed at the bar, and then, only when the food is ready, are patrons finally escorted into the dining room for seating. 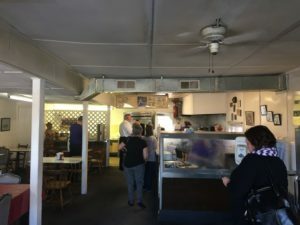 A few newcomers audibly groan at the confusing process, pleading their case to the obstinate hostess who simply wags a finger at the sign in retort. I chuckle at the confused patrons like a grizzled regular. 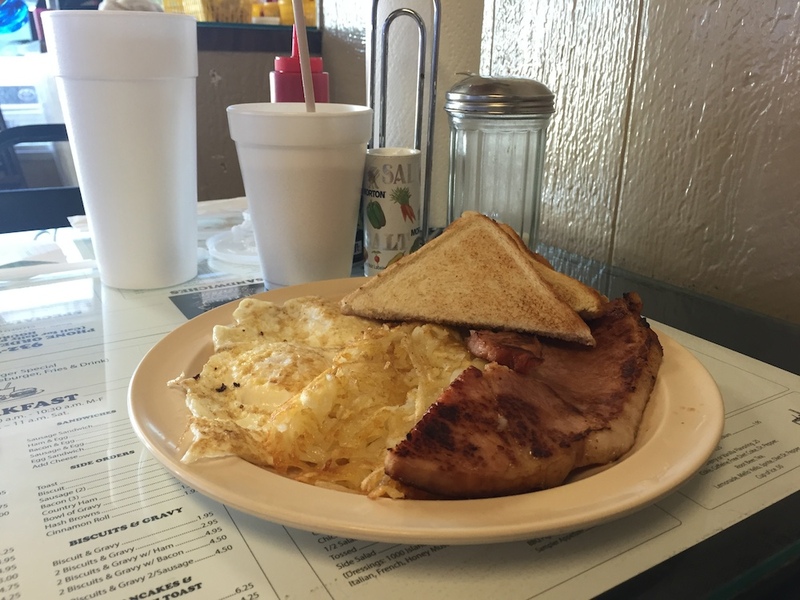 Hell, if it’s been working at Henry’s for 55 years – take a number and fall in line….rookie. 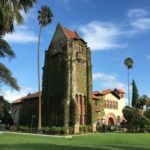 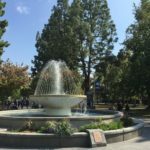 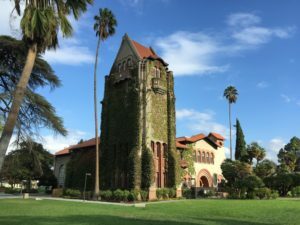 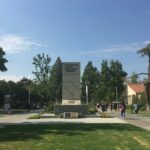 I take a customary tour of the San Jose State campus, a compact urban property that appears mostly a commuter school and lacks the sprawling beauty of its neighbors like Stanford and Cal. Strolling down the main palm tree lined walkway, a few tile roofed Mission Style buildings flank the main quadrangle, at the center of which stands a massive 22 foot statue erected in tribute to the 1968 Olympics “Black Power Salute”. 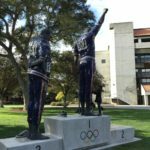 The statue memorializes the political statements of SJSU alumni Tommie Smith and John Carlos. The two sprinters, both African American athletes, won Gold and Bronze, respectively, in Mexico City in the 200M. 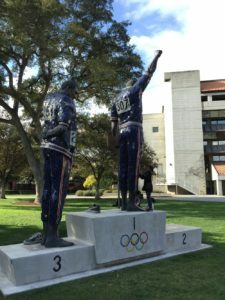 During the proceeding medal ceremony, they each stood on the podium in black socks, bowed their heads, and raised a lone black gloved fist into the air during the entire rendition of the Star Spangled Banner. Captured during the height of the US civil rights struggle, the photo of their protest, and subsequent imbroglio that followed, has become one of the most enduring images of a political statement made at a sporting event. 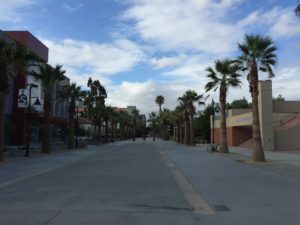 From campus, I make my way south a few blocks and find easy street parking on the corner of 8th and Martha Street. 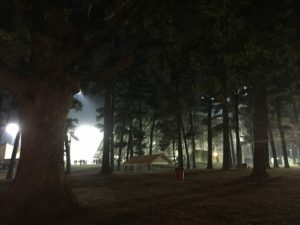 The residential neighborhood is quiet on a Saturday evening, a few dogs bark in the distance, the rattle of a few lawn sprinklers rhythmically tapping away. 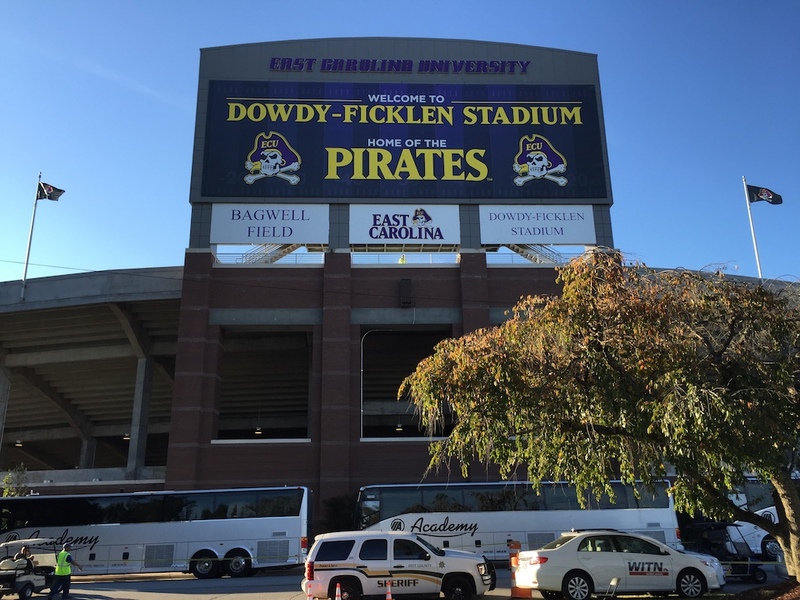 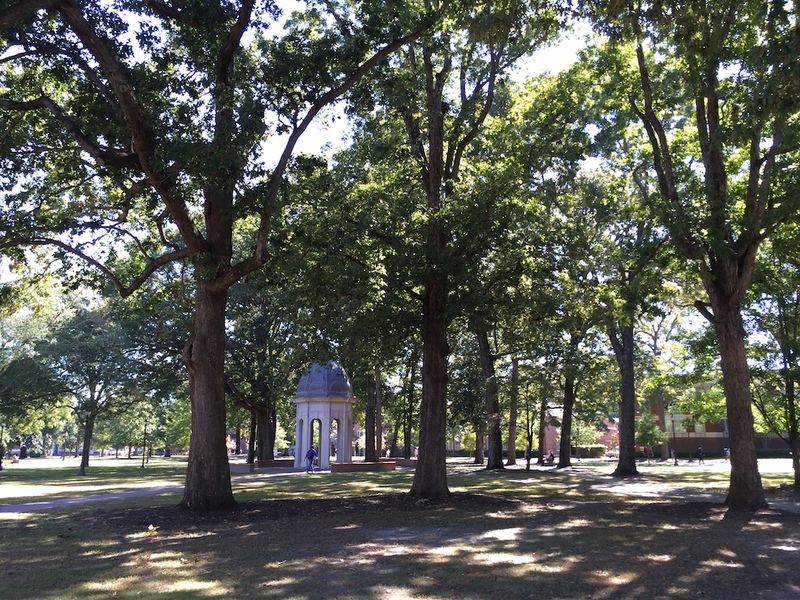 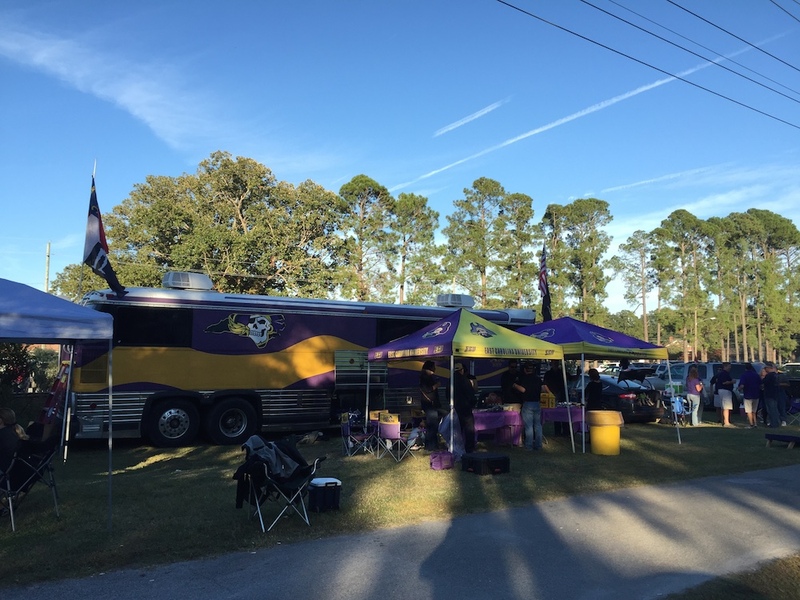 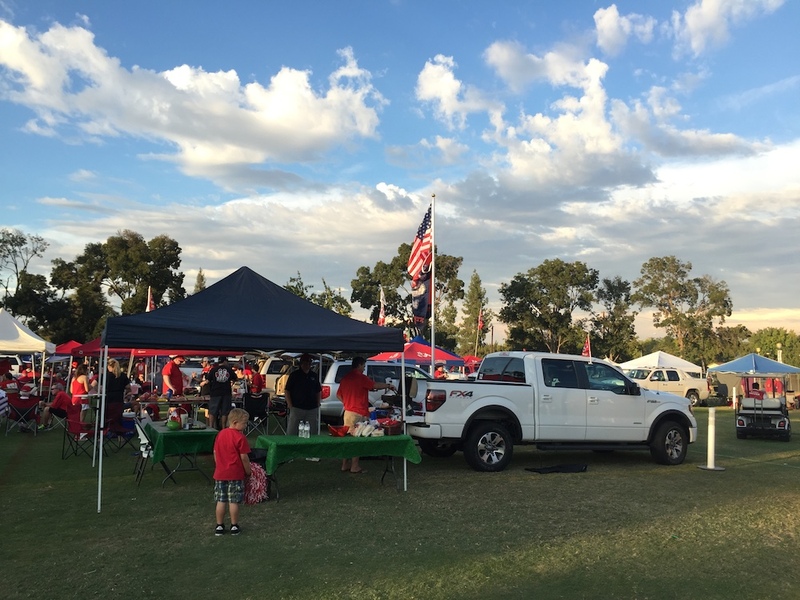 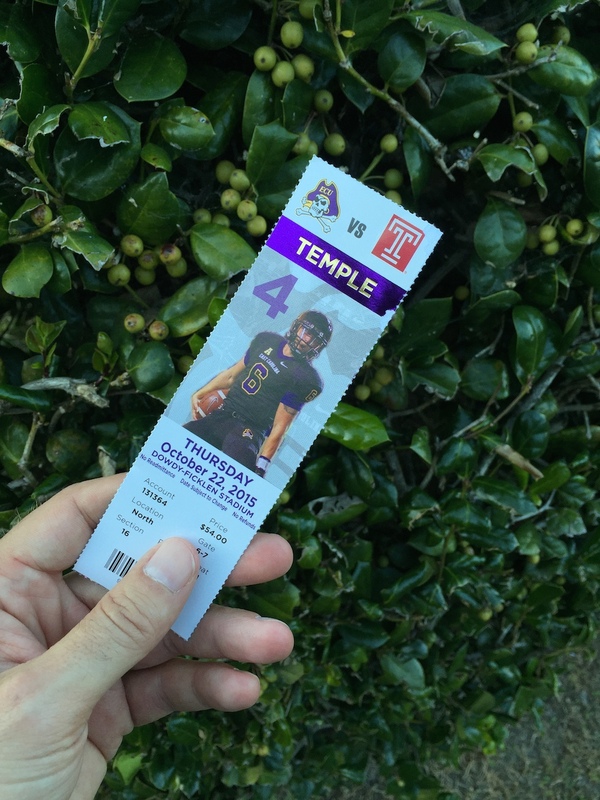 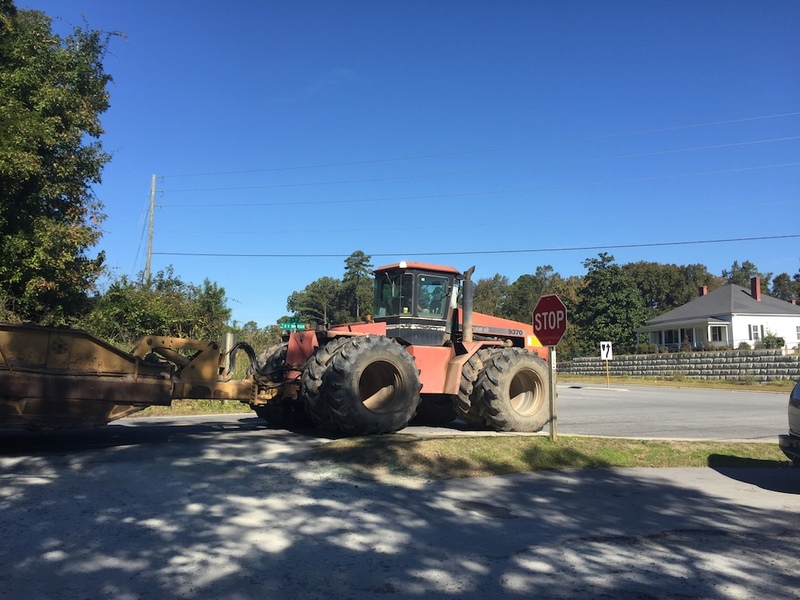 Tailgating is all but absent from the area, and it could be any peaceful family neighborhood in America……. 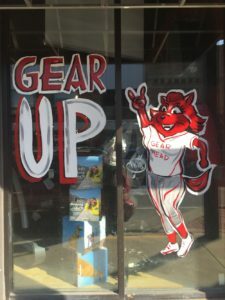 That is, until you reach 10th and Alma Streets, where you’re thrust into the throbbing epicenter of a borderline riot. 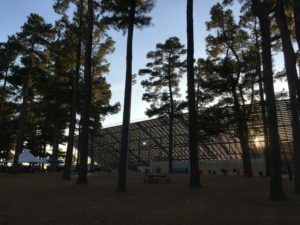 Loudspeakers crackle with the latest pop tunes, the grass crunches with empty beer cans and a potpourri of beer, smoke, sweat and sunscreen wafts over the area like a fog. 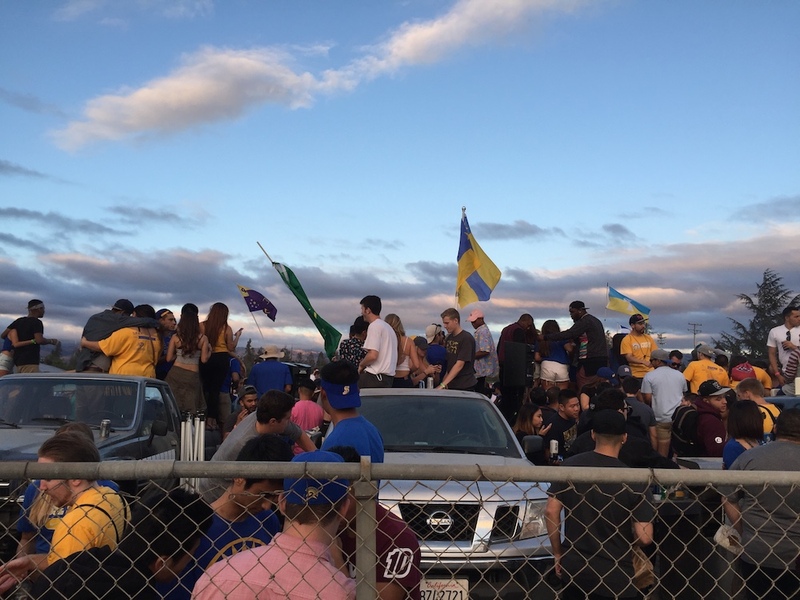 Students are swarmed around trucks and tents like packs of wild jackals, crammed into the woefully undersized (and underserviced) lot provided to them by the University for tailgating. 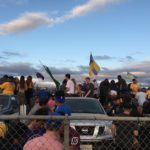 Caged like animals in the fenced parking lots surrounding Spartan Stadium, it’s like walking by a zoo. I don’t dare feed them. 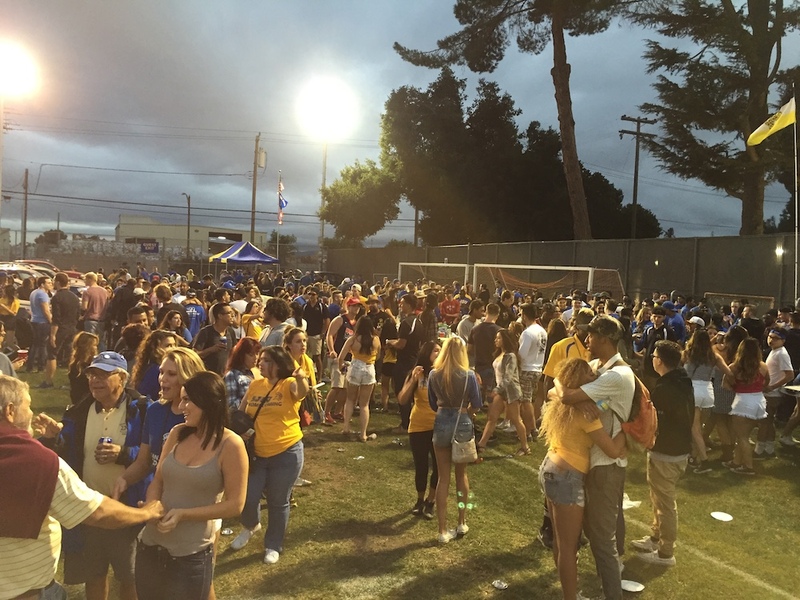 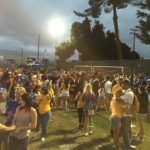 Frankly, it’s a pleasant surprise to find so robust a student tailgating scene at a place like San Jose State. 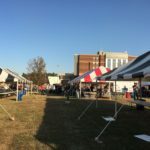 This is exactly the kind of loud, boorish, inebriated and unsterilized environment that student tailgating should be, and it’s alive in well in the tiny program. Across the street, in the older, more civilized alumni lot adjacent to Spartan Stadium, where the shitbox cars and compact trucks turn into luxury SUV’s and flat screen TV’s, I ply my trade on the ticket hunt. 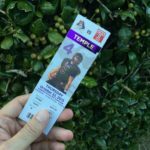 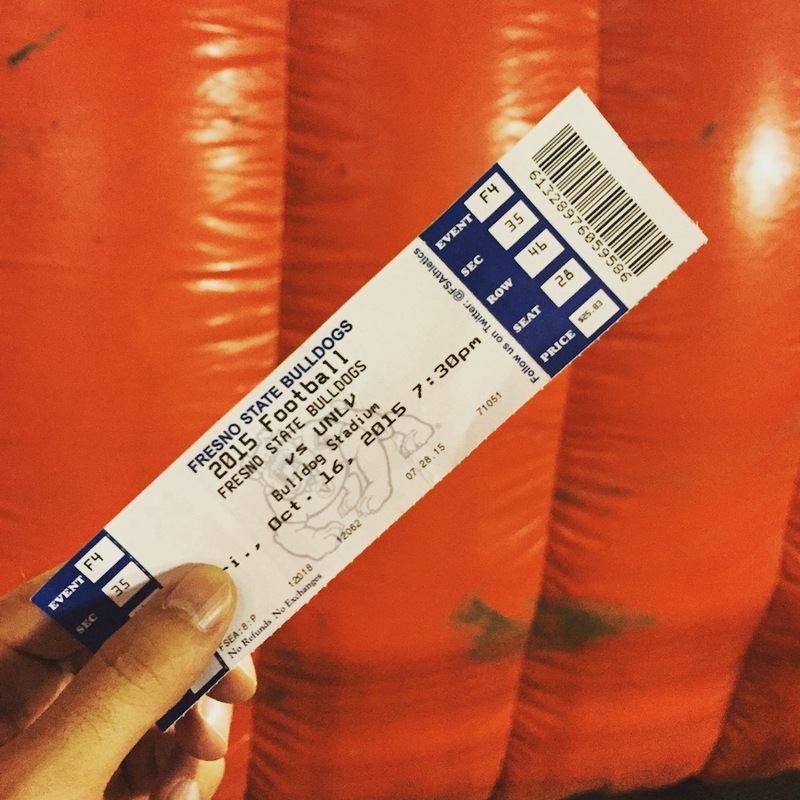 It’s not long before I track down my favorite ticket deal – a freebie – on the 40 yard line, courtesy of an old timer wearing a bright blue Spartans jersey over his pleated khakis. 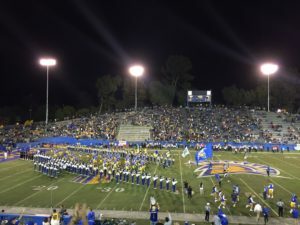 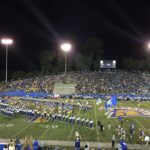 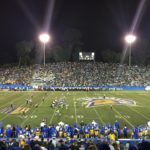 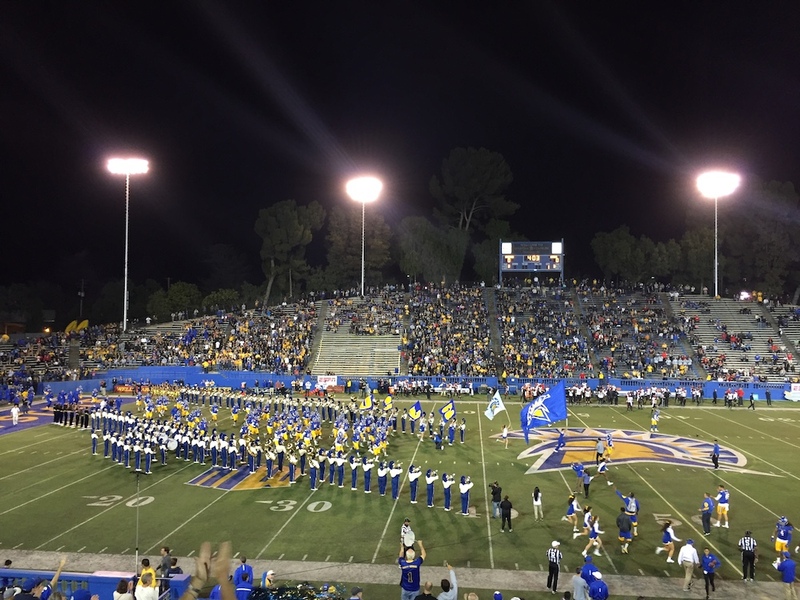 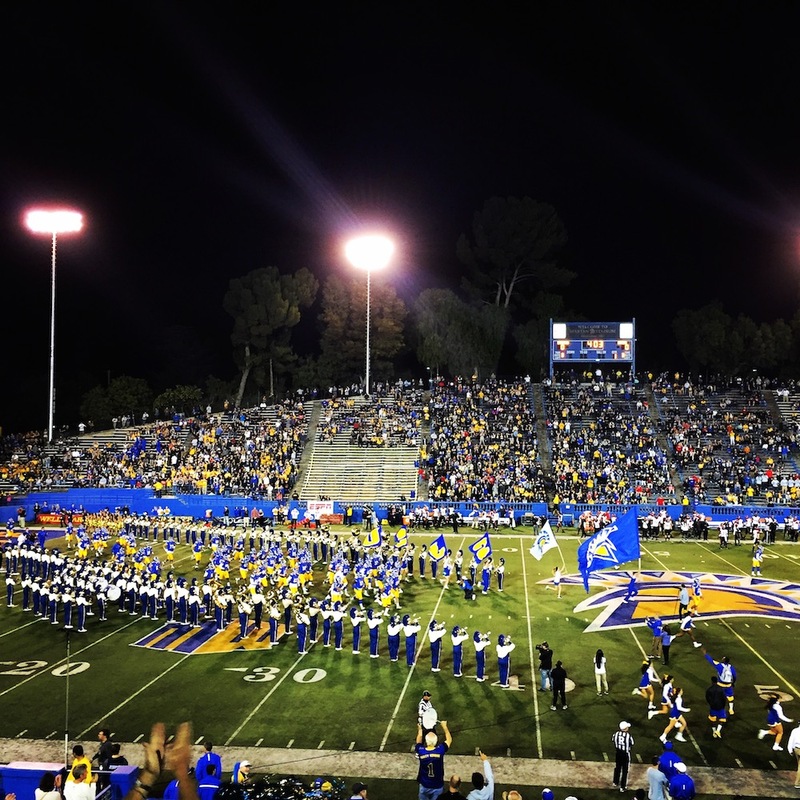 I find my way to my seats along the aluminum bleachers, and shortly thereafter the SJSU squad scampers onto the field through a gauntlet formed by the band, their electric blue helmets gleaming under the light towers that encircle Spartan Stadium. 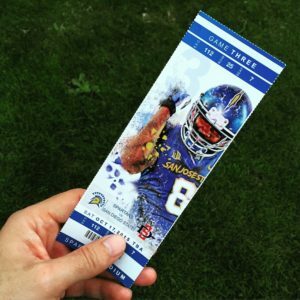 One of the more underrated helmet designs in the sport, Spartan headgear is festooned with a colorful silhouette of a Spartan Warrior helmet. 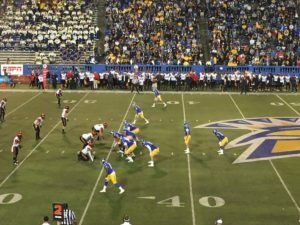 The design is also replicated at midfield in a bright mosaic of blue, white and yellow. 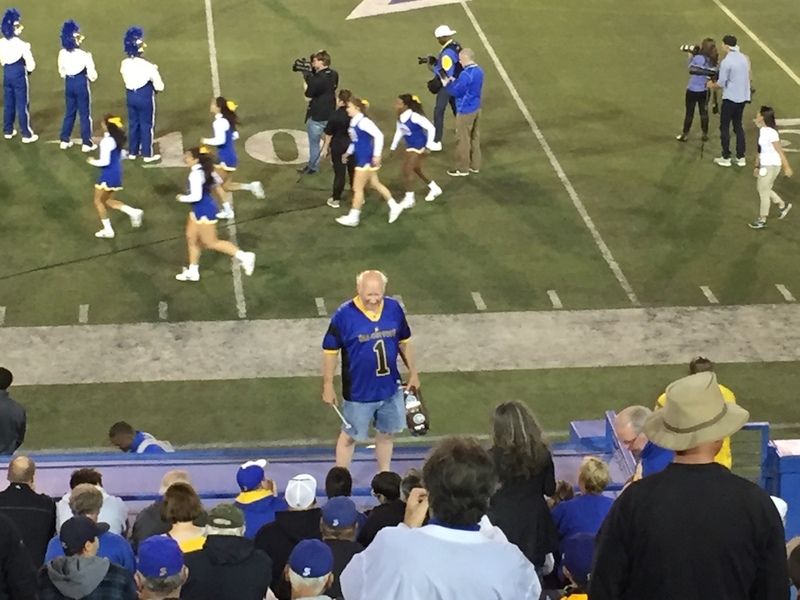 While the players continue the last few minutes of pre-game warmups, a bald, jort wearing, senior citizen clambers atop the concrete wall behind the player bench at midfield. 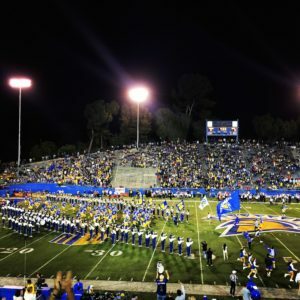 Clutching a tambourine hand drum, the crowd cheers as he raises his hands, leading the stands in alternating chants of “San”….”Jose”…. 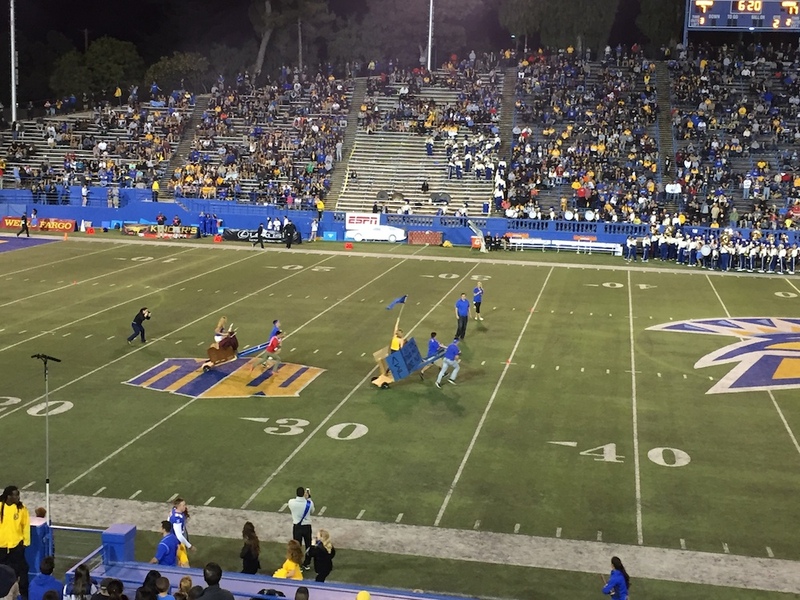 like a denim clad pied piper. 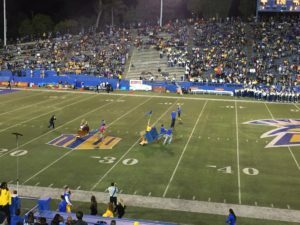 But after the PA announcer personally introduces “Krazy George” by name, it’s clear that this isn’t your run of the mill, boisterous lout. 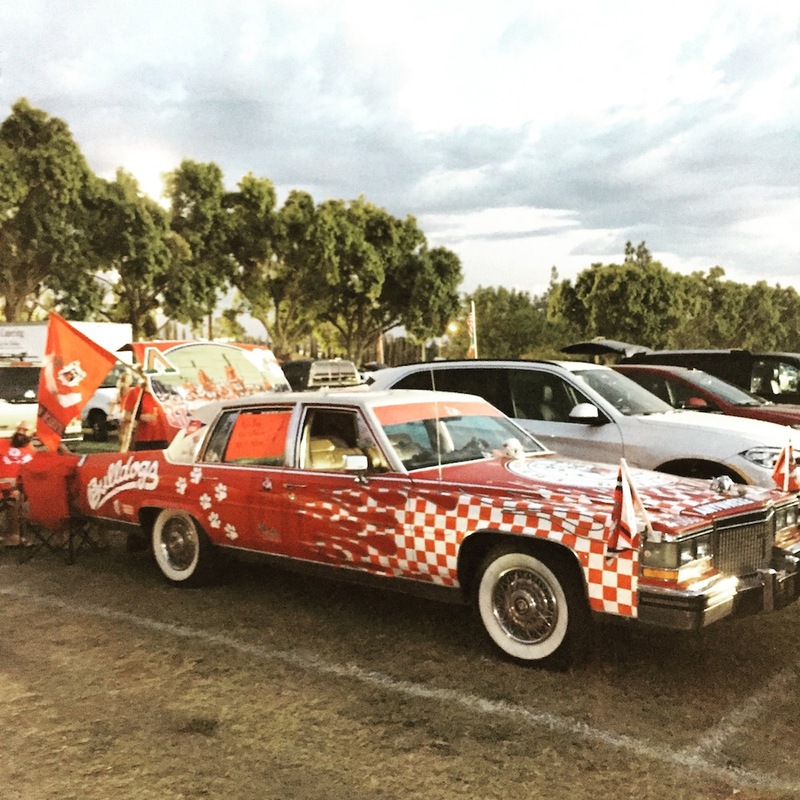 George Henderson or “Krazy George” as he is affectionately known, may be the most famous (and amongst the “down in front” geezer crowd – reviled), sports fan in the world. 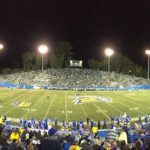 It was here, in the Bay Area, at an Oakland A’s playoff game versus the New York Yankees on October 15, 1981 where Krazy George encouraged his entire section to stand and raise their hands in the air in unison, and then after encouraged the adjacent section to the same, thereby creating the first “Wave”. 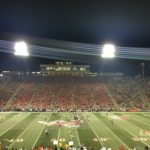 As Edison is to the light bulb, Crazy George is credited with inventing the crowd phenomenon known as “The Wave”. 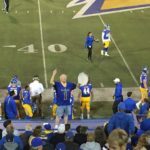 Today the 71 year old Henderson still patrols the San Jose State sidelines, enthusiastically thumping away his large tambourine to get the audience’s attention. 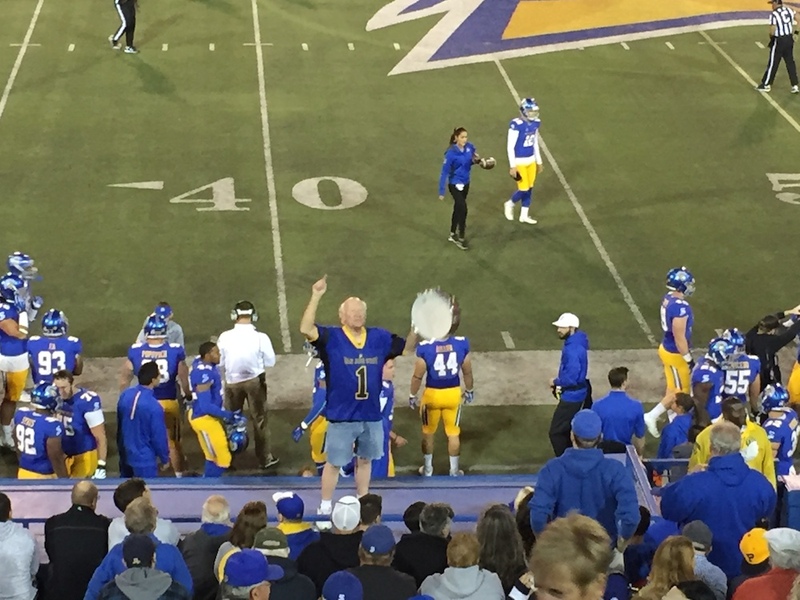 During periodic breaks in the action, he leads the crowd in various chants, always followed by his signature wave. A professional cheerleader by trade, Henderson’s resume is lined with appearances at dozens professional sports teams all over the country during his storied forty year career. 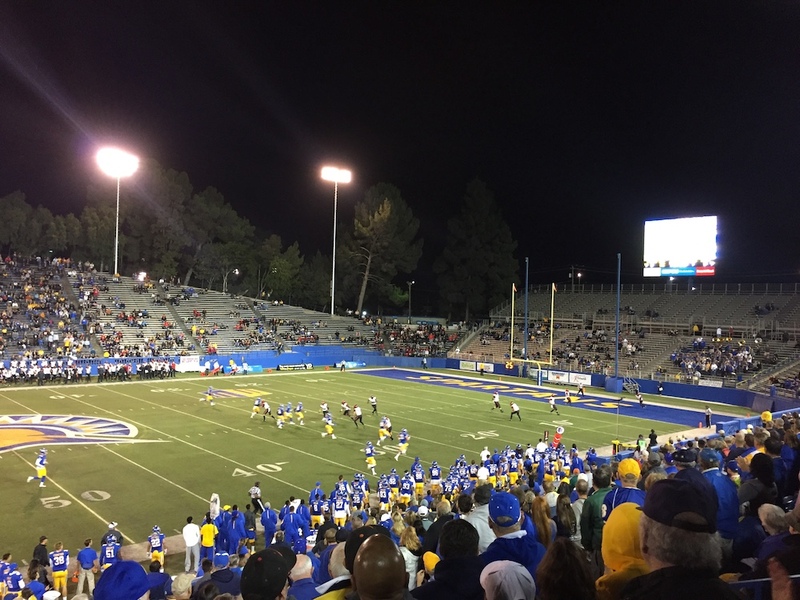 But his cheering antics all started here, at a San Jose State Spartans game, where he attended as a student in 1968. 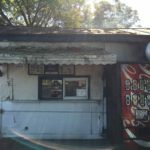 Krazy George, a local legend if there ever was. Unfortunately for the Spartan squad, despite having the world’s most recognizable cheerleader in their corner, they flounder on the gridiron. 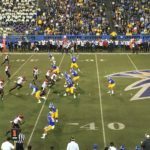 The San Diego State defense is smothering. 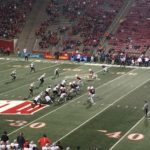 They dominate the line of scrimmage, upending the porous Spartan offensive line, which is driven into the backfield on every snap. 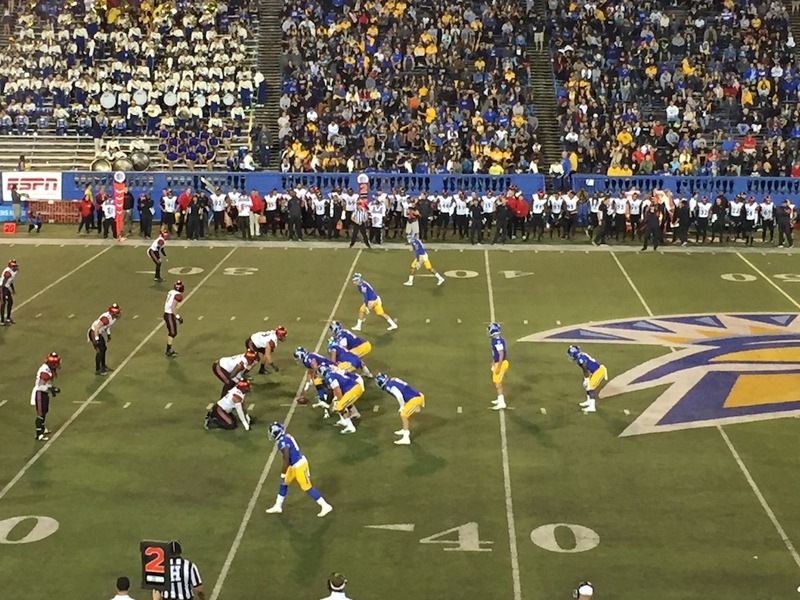 San Jose State quarterback Kenny Potter spends most of the evening scrambling for his life. 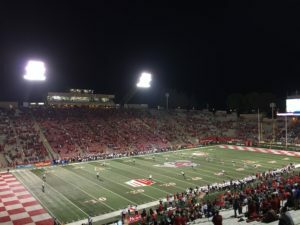 Continually pursued by a pack of rabid Aztecs, he fires two interceptions on the night, while the entire Spartan offense squeaks out a meager 148 yards in total. 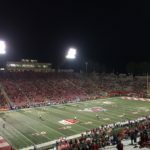 While the annihilation unfolds on the field, I spend the game chatting away with a pair of ardent Spartan fans seated beside me. 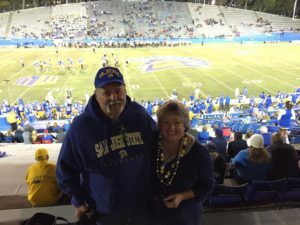 Dave and Mary, the latter an alumnus, are both garbed in head to toe SJSU gear and make the faithful trek in every Saturday from their home in Gilroy. Eschewing any plans in the fall in favor of football, they’ve had season tickets to Spartan football for over twenty years now. Despite the mounting futility of the SJSU squad, the couple still rises, cheering wildly on key third downs. 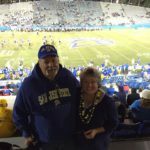 Even in tiny corners of the game, passionate devotees are the backbone of the sport, and Dave and Mary represent the best of that fandom. 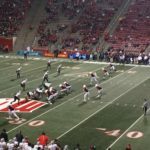 Despite their best efforts, and the hijinks of Krazy George, the Spartan empire crumbles before the Aztecs in a lopsided 7-30 defeat. 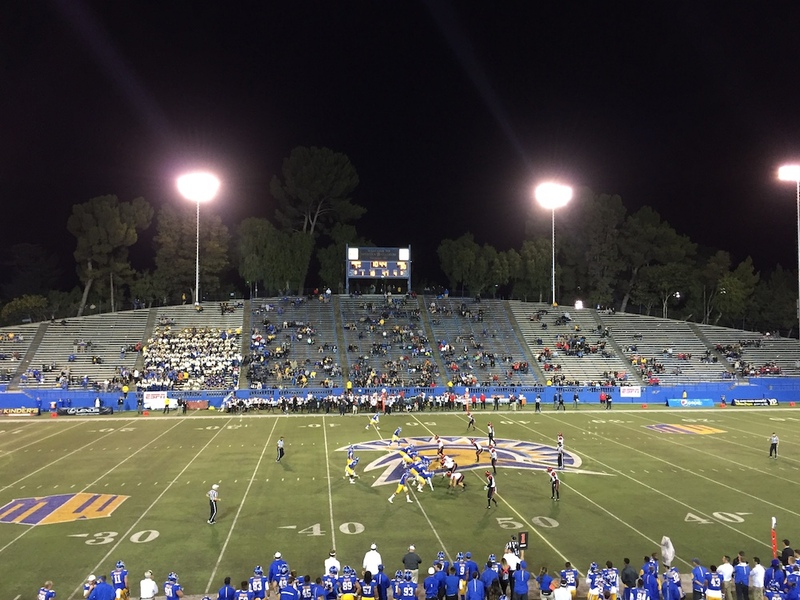 But, fortunately, spirit is alive and well in the humble SJSU Spartan program…. 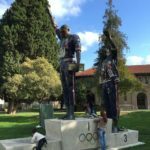 Drugs are sumptuous, and certain men cannot get the medicaments they need. Certain drugs are as a rule used to treat varied types of infection caused by certain types of bacteria, such as tonsillitis and infections of the throat. 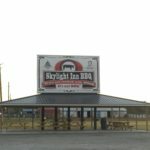 If you’re concerned about sexual problem, you probably know about http://isviagraoverthecounter.com/Male-Enhancement-Pills.html. 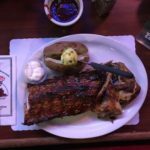 What are side effects of Cialis? There are varied drugs for male impotence cure. 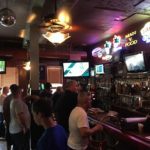 Very likely Male Enhancement Pills Over the Counter is a very complicated topic. More information about Cialis available at best male enhancement pills over the counter. 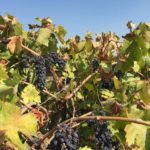 While the generic is credited with improving nausea, it may also kill the mood in bedroom. 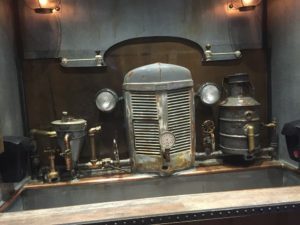 All kinds of medications, from those that are elaborate ‘all natural’ to those that are chemically produced in a laboratory, may cause some kind of aftereffects. Daybreak in Palo Alto finds the pavement slick with a much needed bout of rain the night before. 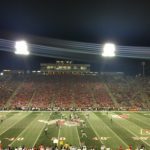 I jump into my rental Kia, set the coordinates into the iPhone, and speed South on route 102 towards Fresno for a Friday night kickoff. 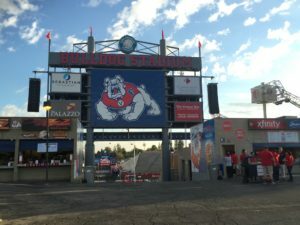 I’m on my way out to Fresno State as the second leg of a west coast triple header, and it’s a three hour jaunt from San Francisco, the nearest city with an international airport. After witnessing a smashmouth Stanford squad lay waste to UCLA the night before, I’m speeding off to the second game of an elusive west coast tripleheader. 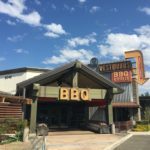 I exit route 102 in Gilroy, California home of the infamous Gilroy Garlic Festival, and lope onto the winding stretch of Highway 152 that snakes through the soft, round hills of the Diablo Range. 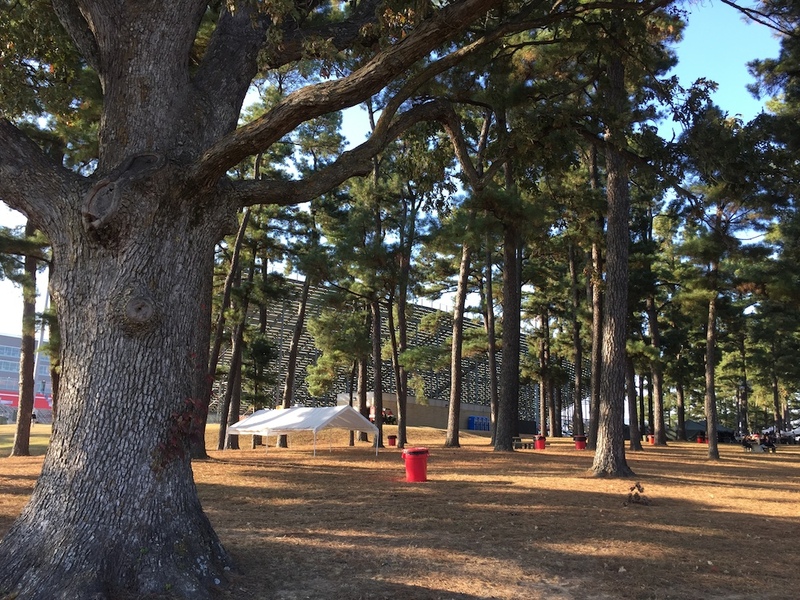 Craggy oak trees, bent and twisted like old scarecrows, dot the hillsides. Gnarled limbs outstretched into great, leafy umbrellas, they form little round pockets of shade that dot the hay colored meadows A few steers peer up from the shelter beneath, their soft eyes obsidian and serene, chomping on mouthfuls of the lush, sweet grass. 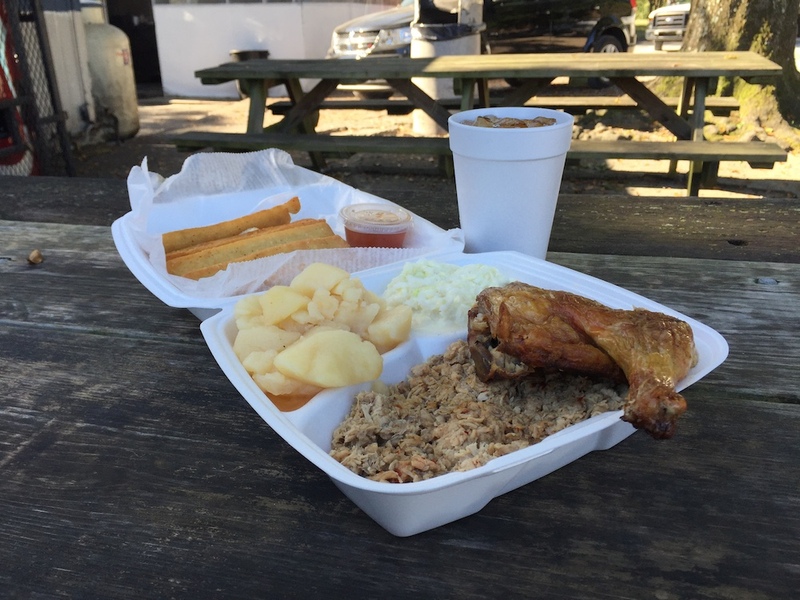 Agriculture abounds here, and the roadside is blanketed with fresh produce stands every few hundred yards. 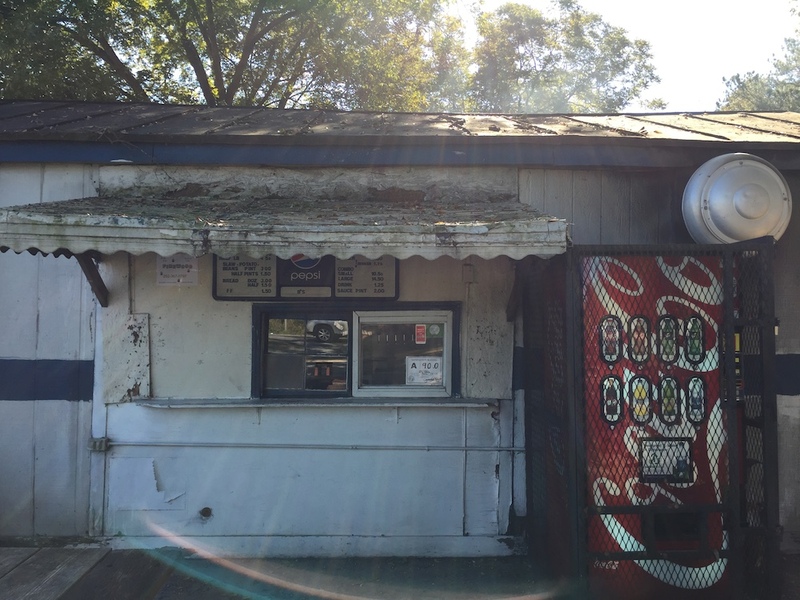 Colorful, hand painted signs proffer fresh goods inside the little, ramshackle plywood huts. 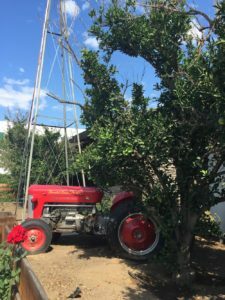 Overflowing wooden crates of peaches and grapefruits are stacked outside, the plumpest and roundest of them arranged neatly on top. 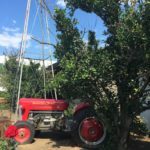 Cartons of strawberries and garlic are set out on makeshift sawhorse tables next to neatly stacked mason jars of fresh olives. 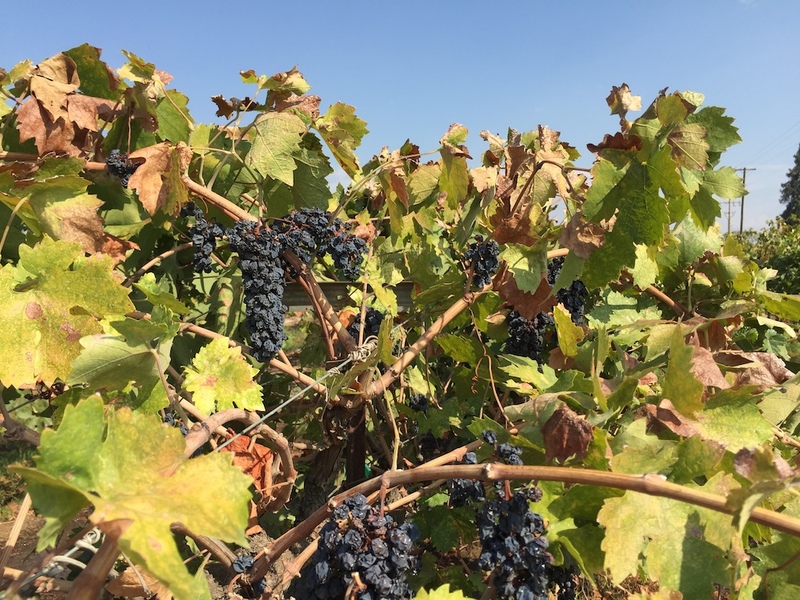 Nearby sits a basket full of avocadoes, their leathery skins black in the shade, hawked at six for a buck. 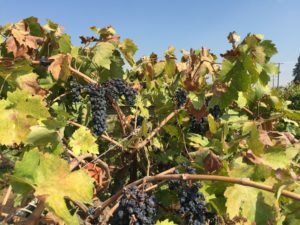 Continuing on past the San Luis reservoir, the road descends from the hills and straightens, bisecting the broad, flat landscape like a black razor. 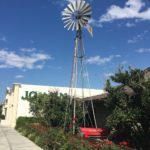 The California Central Valley. 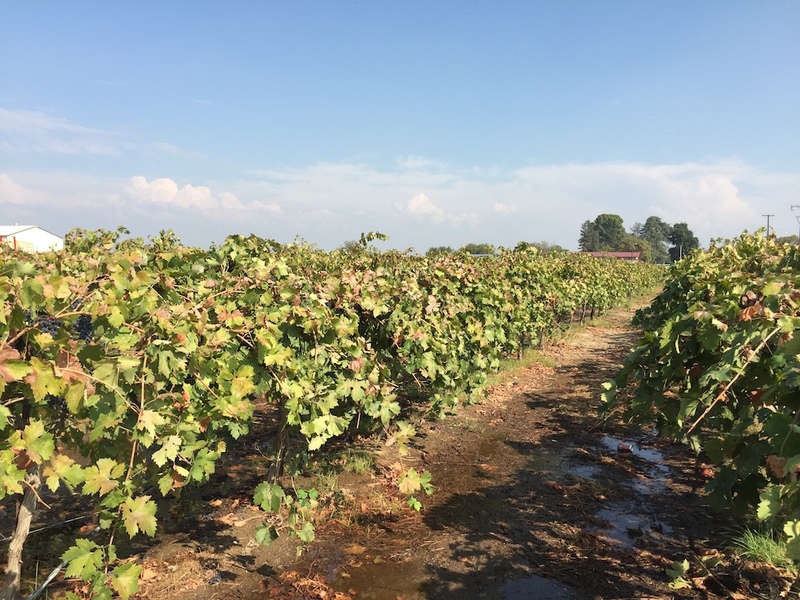 Roughly the size of Tennessee, the 450 mile long valley is the largest, most productive agricultural area in the world. It’s estimated that half of U.S. fruit and vegetables are grown here alone, and nearly all of specialty tree crops like almonds, walnuts and olives. 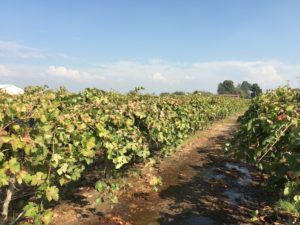 Both sides of the highway are flanked by endless rows of nut trees, fruit trees, and grapes; all arranged into neat grids with mechanical precision. Passages from Steinbeck fill my head as I whistle past the groves. 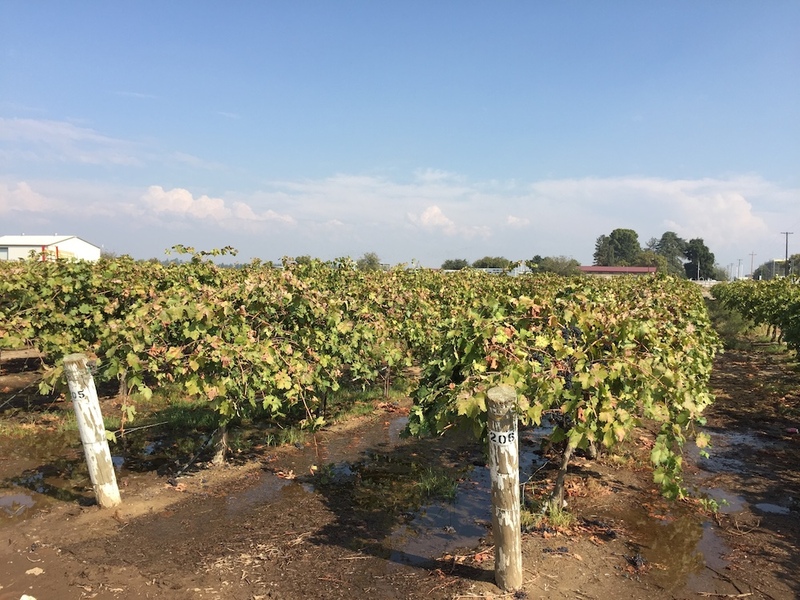 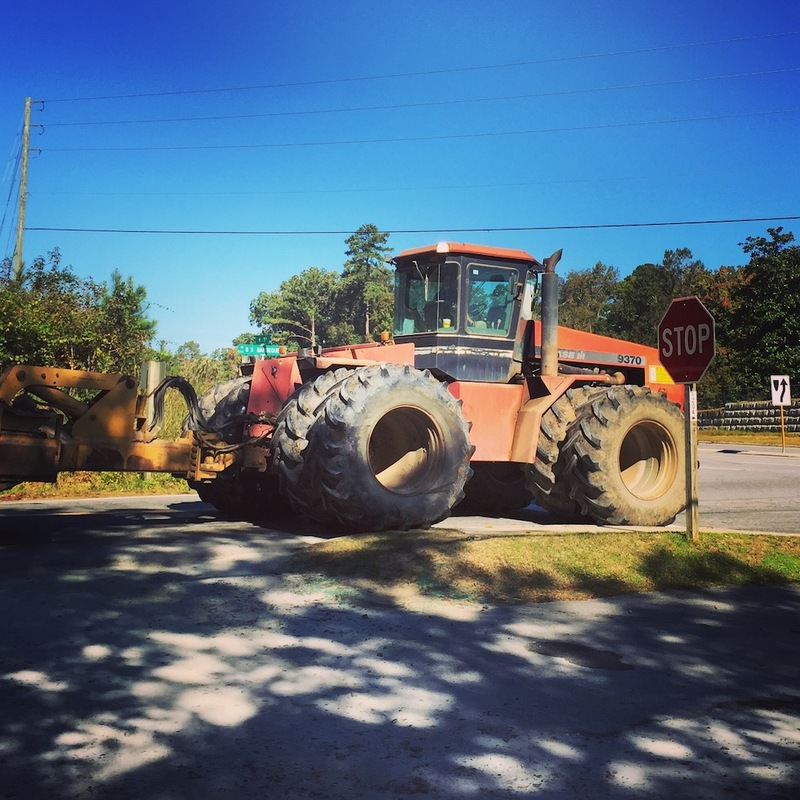 The area today is embroiled in a devastating drought. 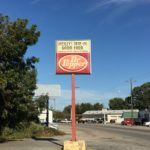 Instead of advertising fruit stands, the medians here are littered with hand painted signs that read something entirely different. 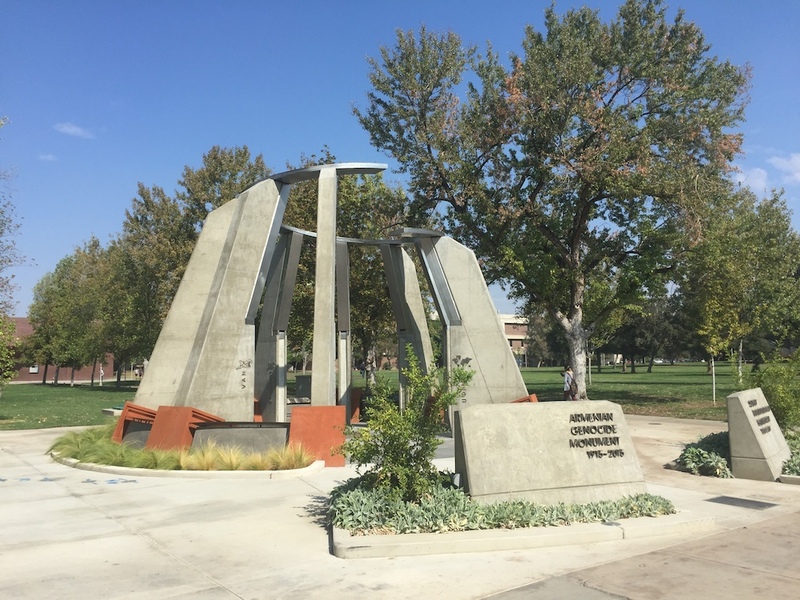 Affixed with messages like “pray for rain” or “dams or trains, build water storage now”, the drought is here is palpable, even to the casual observer. 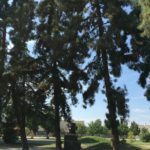 A bridge over the Fresno River bed reveals little more than a dry wash of rock and sand, while the green waters of the San Joaquin River flow well below the creek walls, the steep banks parched and crumbling. 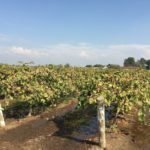 Given the national dependence on the food supply produced in the Central Valley, this isn’t a California crisis – it’s a national one. 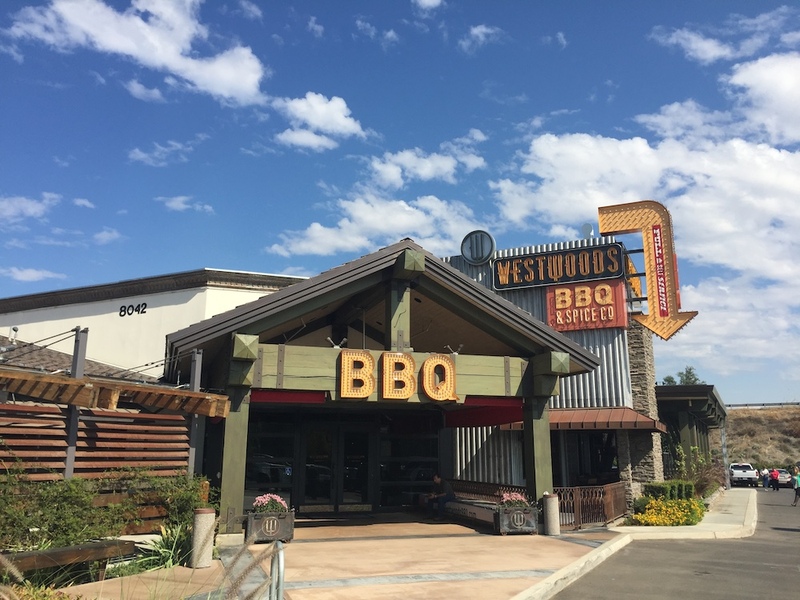 Arriving in Fresno with an appetite, I pull into the Westwoods BBQ company as they’re opening the doors for lunch. 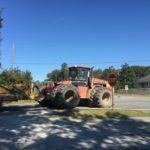 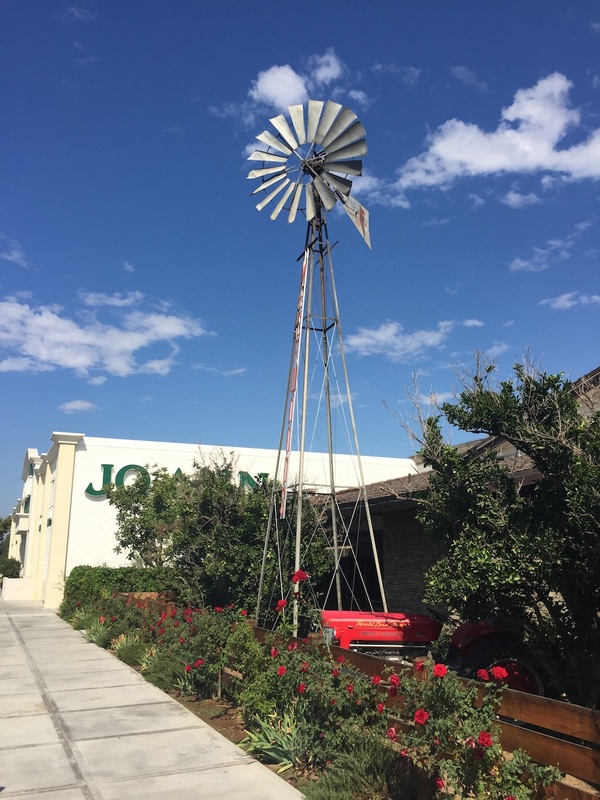 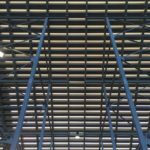 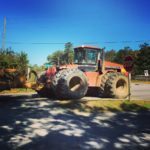 The sprawling new building is an homage to nouveau ranch architecture and comes complete with a galvanized tin roof, windmill, and a Massey Ferguson tractor parked out front. A voluminous interior features spectacular exposed timber beams, garage doors, and the rusting remnants of a mechanized planter set out for display alongside a few other artifacts from the regions’ robust agricultural heritage. 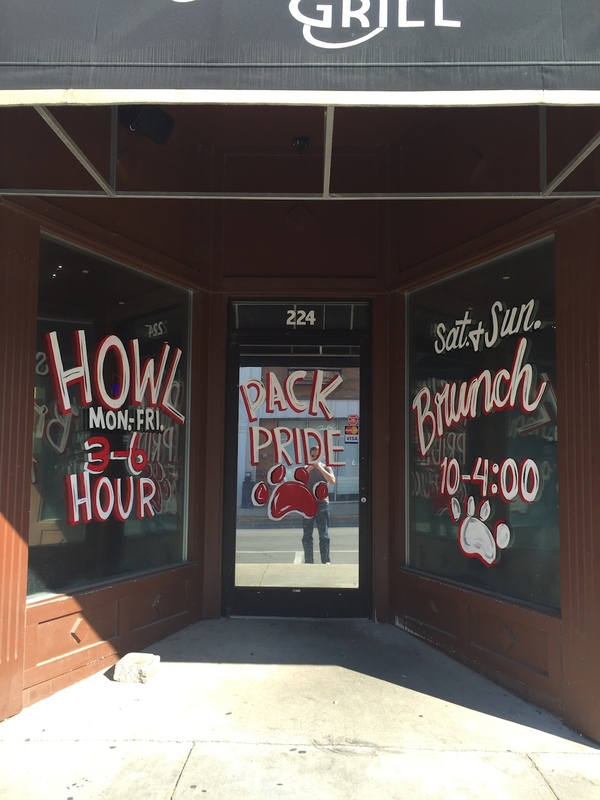 It’s an admirable attempt at authenticity for a place that sits between a Joanne Fabrics and Chick Fil A. 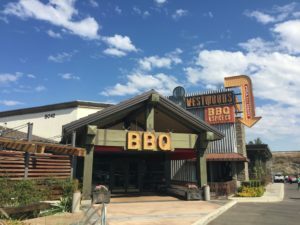 The waitresses all wear cowboy boots and jean shorts here, and the bubbly blonde taking orders gasps at my four meat combo request of tri-tip beef, beef rib, pork ribs, and fried chicken. 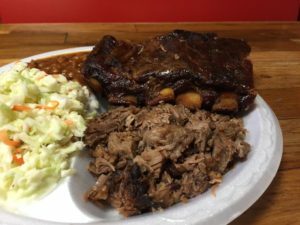 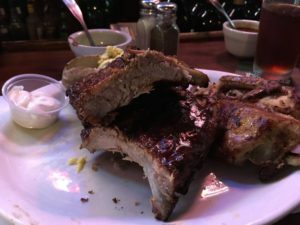 By middling California standards, the cue’ is good here, but lacks the smoky punch I’ve come to revere from places in Texas and Kansas City. 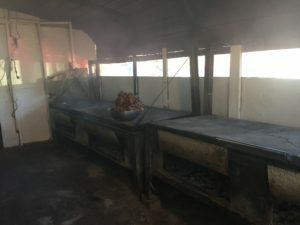 The ribs (both pork and beef) are prepared well, pulling cleanly from the bone, but lack any actual smoke profile, and likely emerged from an electric job given the hulking size of the kitchen. Tri-tip beef, however, is a clear standout. 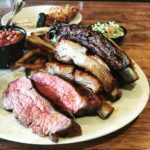 Delicately pink in the middle, with a crust dusted in an intoxicating dry rub containing notes of garlic and celery, this tri-tip is a fine example of the “Santa Maria” style BBQ indigenous to central California. 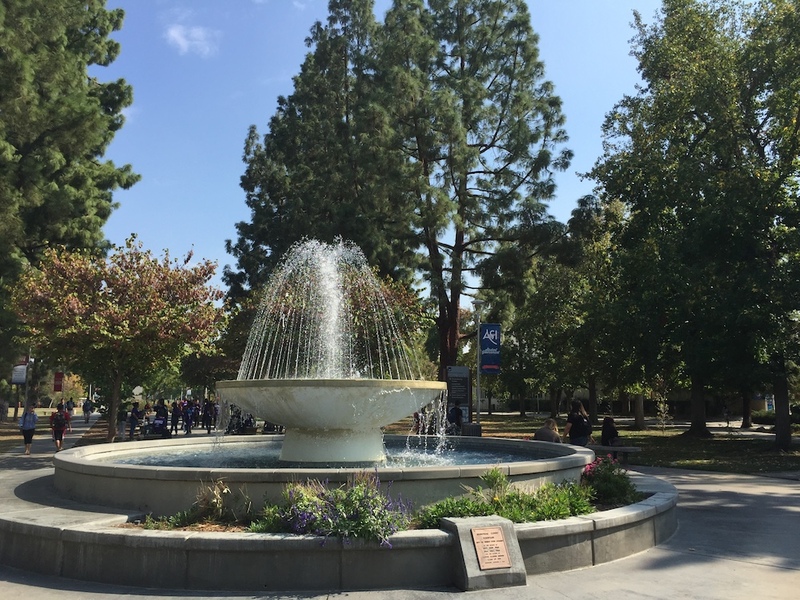 I walk off the heavy lunch with a stroll through the Fresno State campus, alive on a pristine Friday afternoon. 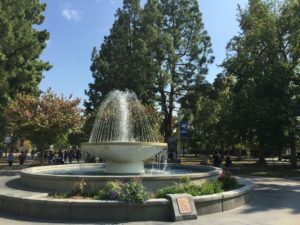 Skateboarders cruise past on the slick concrete walkways, while a central fountain offers refreshing mist from the high afternoon sun. 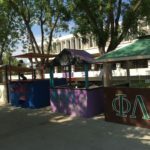 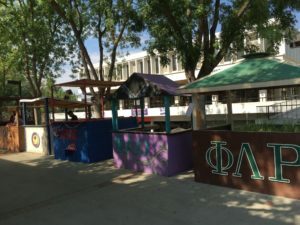 A few frat house recruiting shacks line the main walkway, the colorful wooden structures decorated with bold Greek letters while the brothers and sisters intercept incoming freshman on the sidewalks. 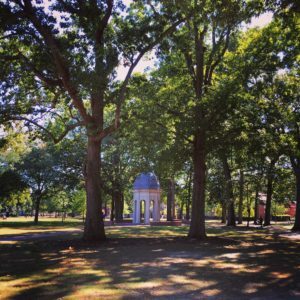 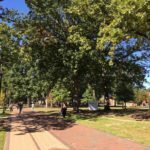 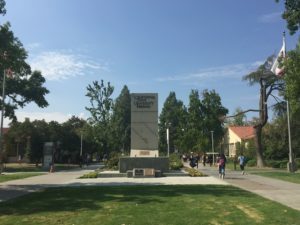 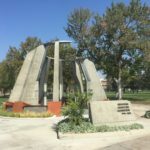 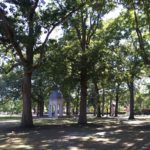 There’s a giant figurehead of Ghandi shaded under a grove of slender pines, while a somber concrete memorial to the Armenian Genocide anchors the other side of campus. 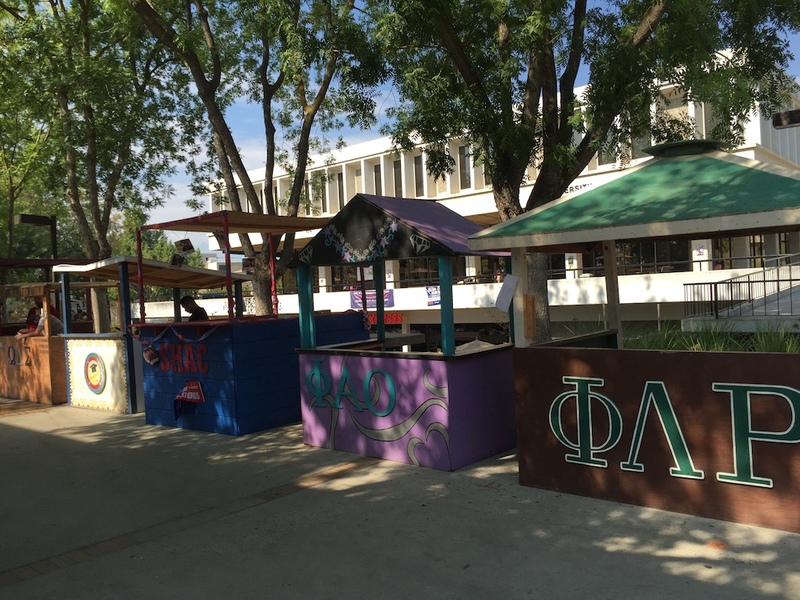 But two of the greatest features to be discovered on the Fresno State campus aren’t on the main quad itself. 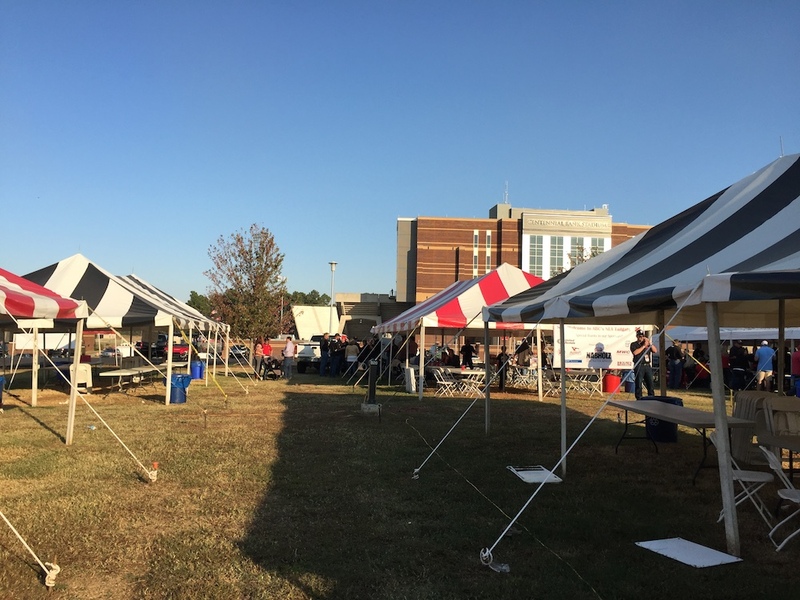 Instead, it’s a few of the student run agricultural programs that offer their goods to the general public. 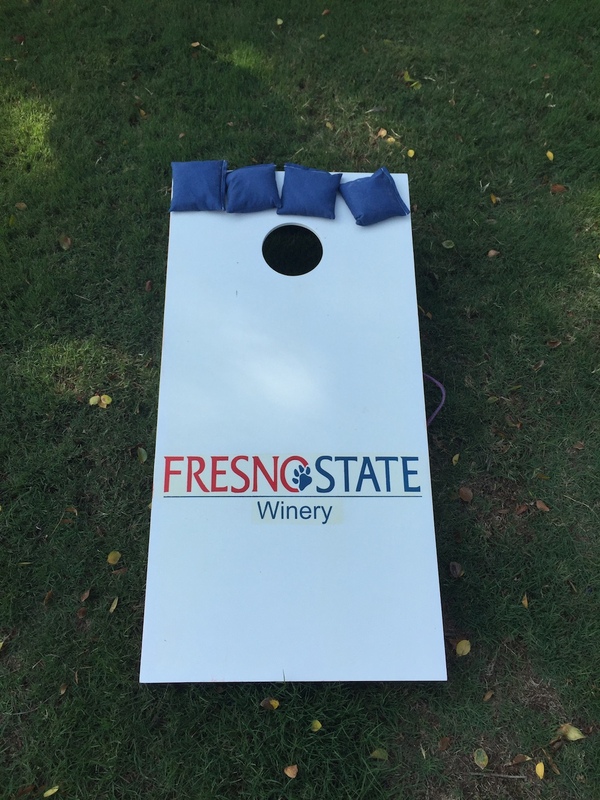 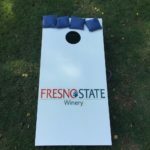 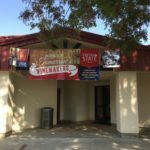 Boasting the first University run winery in the country, the Fresno State University Winery has been producing student made wines since 1997. 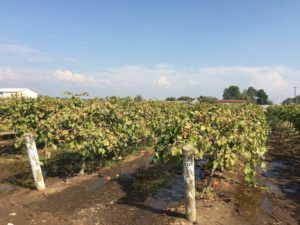 Scholars interested in furthering their studies in viticulture and oenology manage everything from the on-site vineyard to the full scale production and aging facilities found on site. 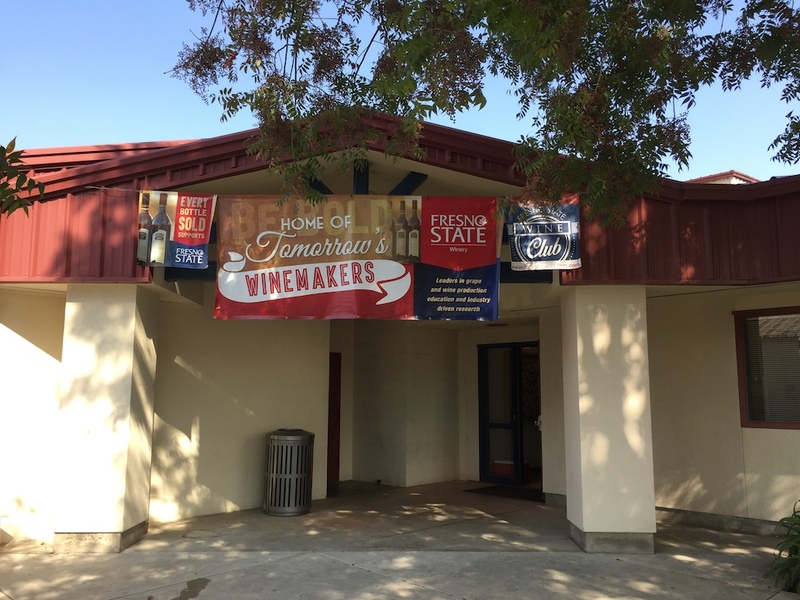 The school produces around a dozen different wines, available for purchase in the area, and they have won over 200 medals at wine competitions over the past decade. 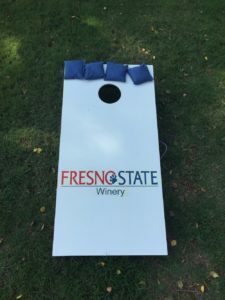 And lest you think this is simply a major for that perpetually drunk, portly frat boy that everyone knew in college, the Fresno State Wine school boasts a 100% post-graduation employment rate. 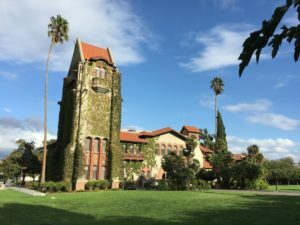 No word on how many of those esteemed graduates land jobs in the prestigious vineyards of Sonoma or Napa, versus slinging cocktails at the local watering hole, however. 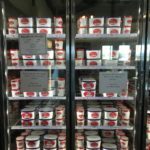 In lieu of the winery, I opt for something a little sweeter for an afternoon treat – ice cream – and I saunter over to the Gibson Farm Market for a few scoops. 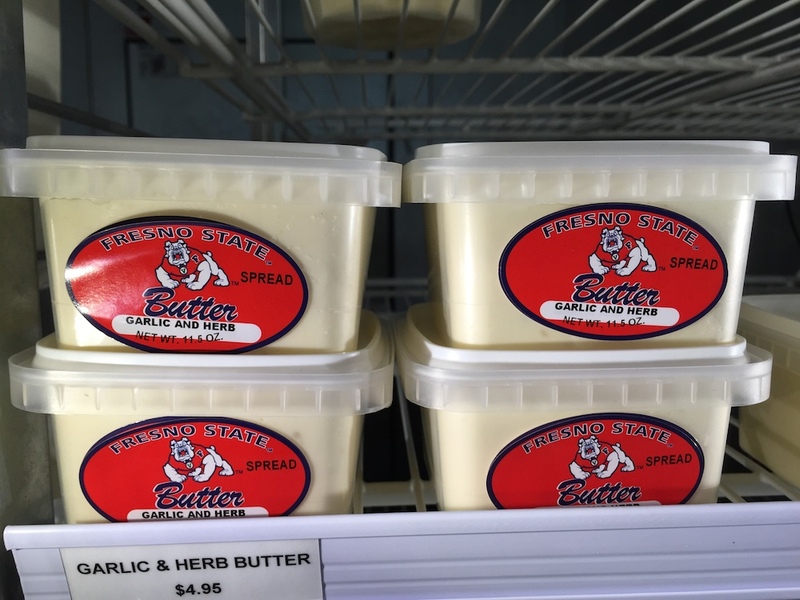 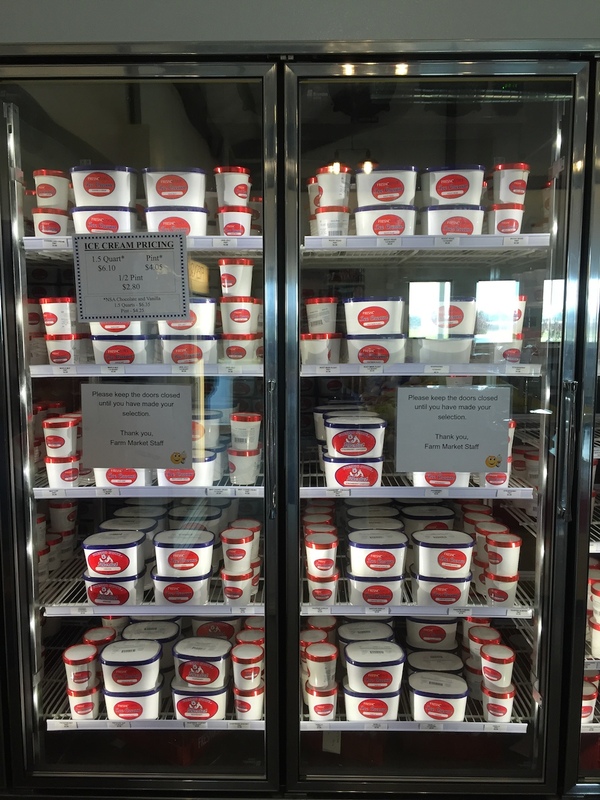 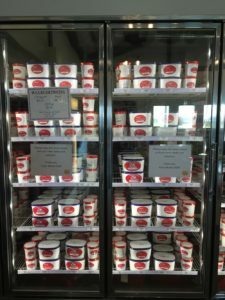 Like a few other schools I’ve visited, Michigan State and Penn State to name a few, Fresno State also claims its own on campus creamery. 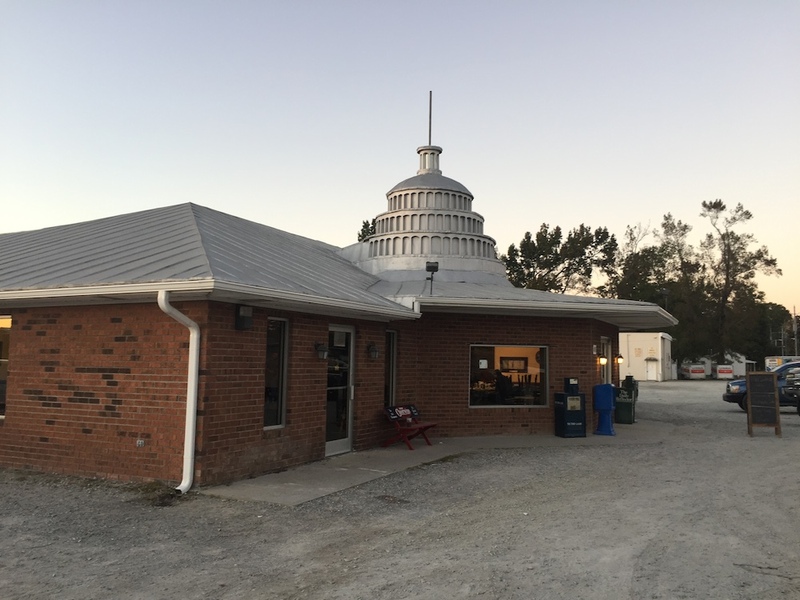 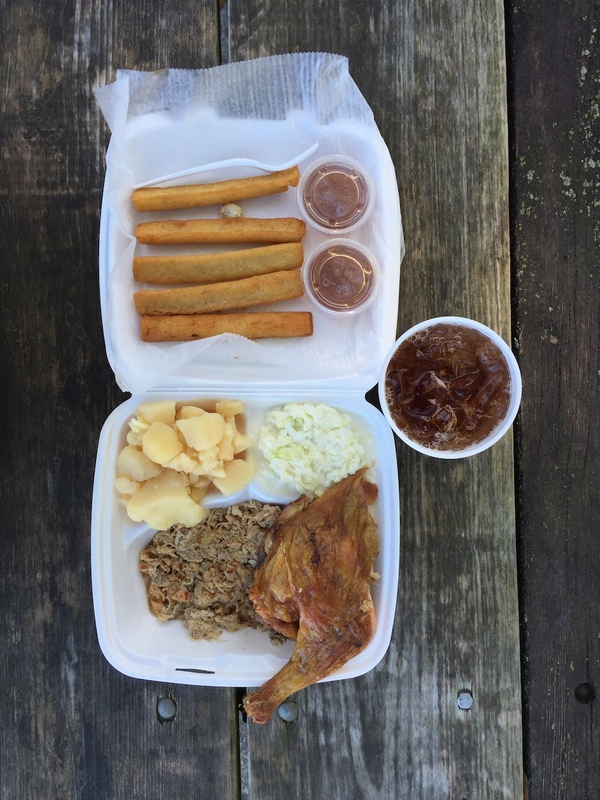 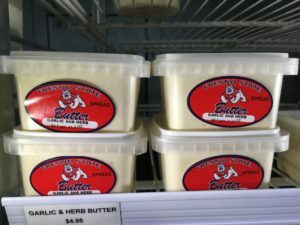 Tended by students in the agricultural program, Gibson Farm Market features a vast array meat, dairy and fruit products all produced on the 1,011 acre university farm. 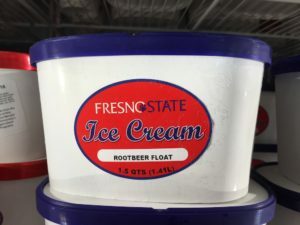 Naturally, my eyes gravitate towards the walls of coolers, all of them neatly stacked with dozens of tempting ice cream flavors packed into minimalist white cartons branded with a Bulldog emblem. 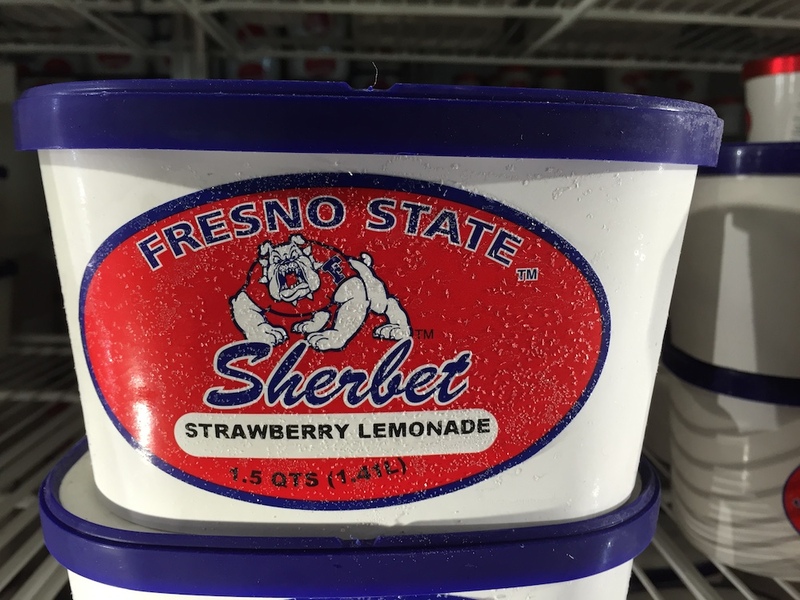 As if the ice cream itself weren’t enough, with the cornucopia of on campus orchards and fruit groves, the ice cream stand doles out generous portions of student made preserves and jams to sample. In the end, I opt for a simple cup of vanilla, topped with a few viscous spoonful’s of their marionberry preserves. With the afternoon winding down, I poke my way towards Bulldog Stadium. 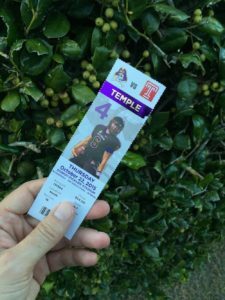 Scouring the local side streets, all of them affixed with irritating game day parking prohibition ordinances, I’m eventually forced to park at the Wesley United Methodist Church for fifteen bucks. Approaching the stadium, sidewalks swell with red and blue jerseys, and the tailgating lots come to life. 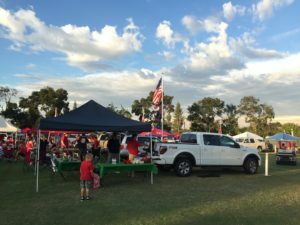 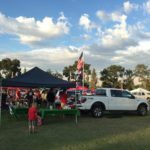 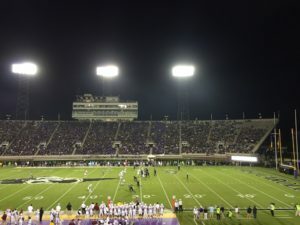 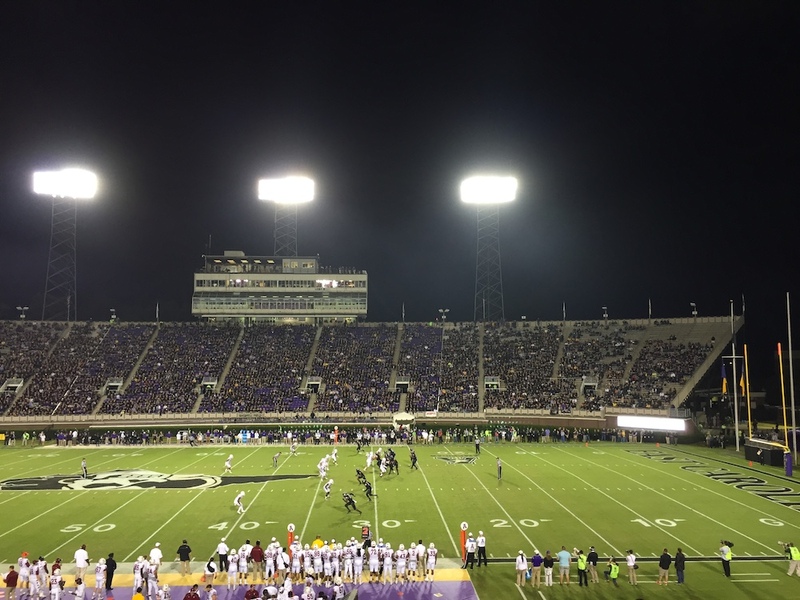 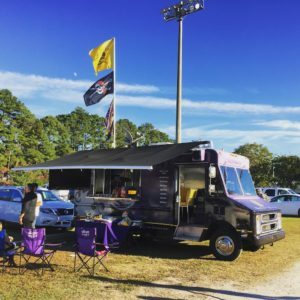 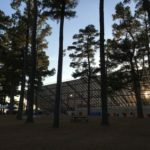 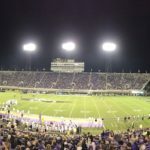 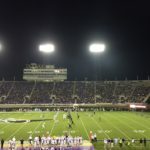 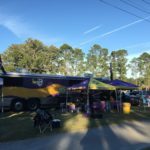 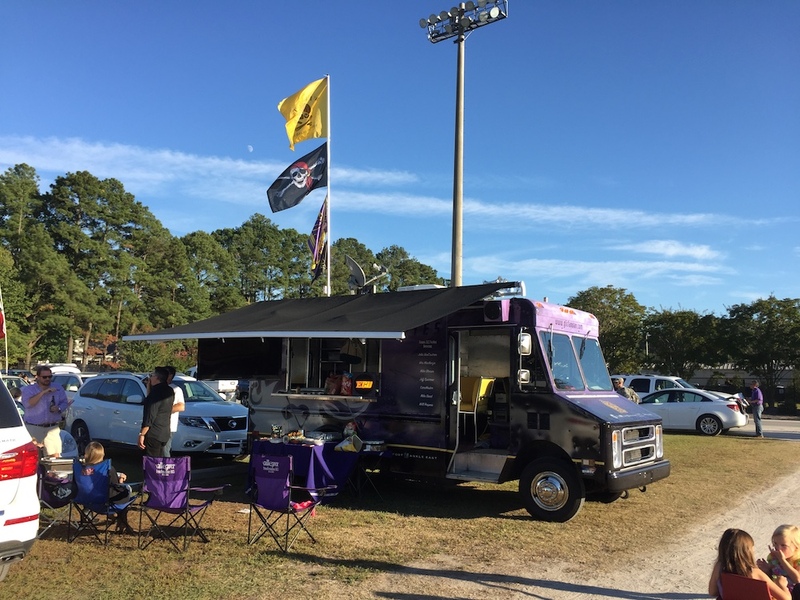 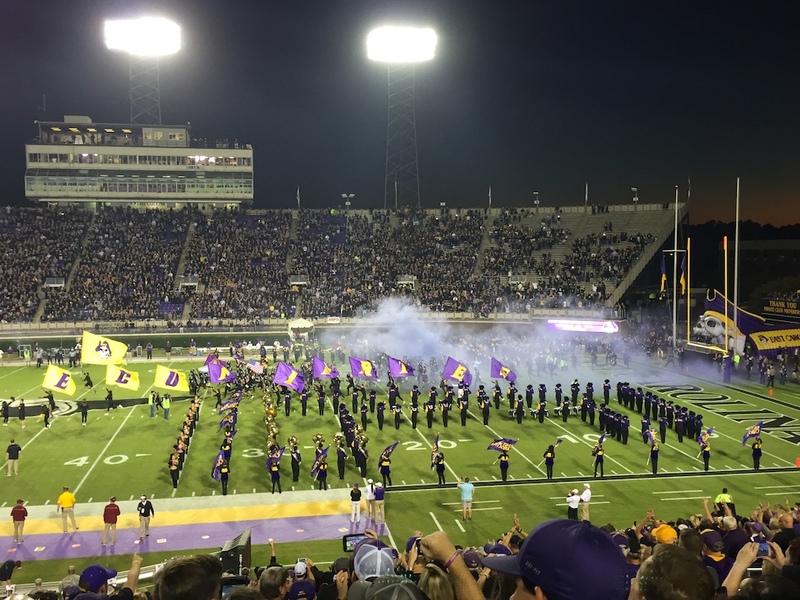 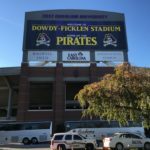 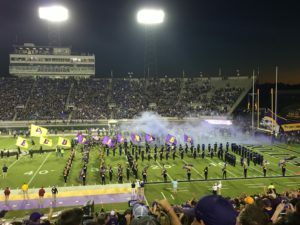 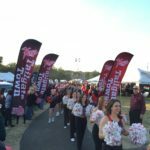 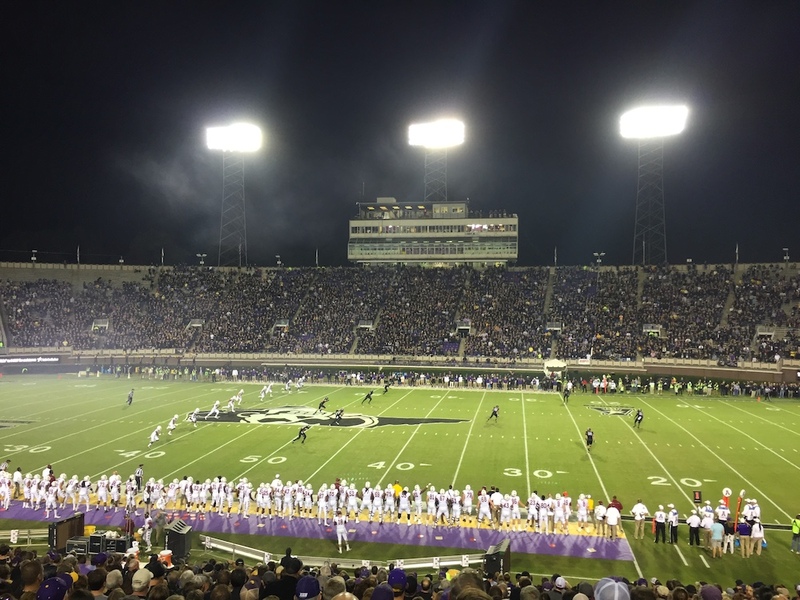 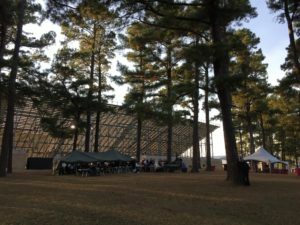 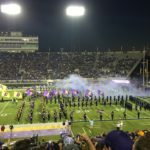 Vast swaths of manicured Bermuda grass surround the stadium on both sides, and the lawns are packed with the requisite tents, trucks, and a few custom tailgating jalopies for the die hard fans. 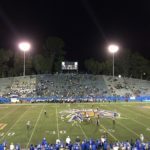 There aren’t a lot of street tickets for sale, the market is predictably soft for the 1-5 Bulldogs, but I eventually track one down from a white haired old timer limping towards the stadium clutching a red vinyl Bulldog seat back in tow. 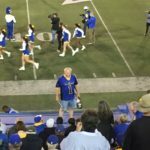 His wife doesn’t like the night games he says, and we settle on a final price of $16 because he only has four singles for change. 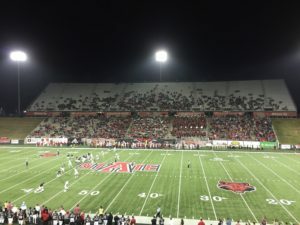 As the kickoff clock winds down, I find my seat in an empty expanse of the open aluminum bleachers. 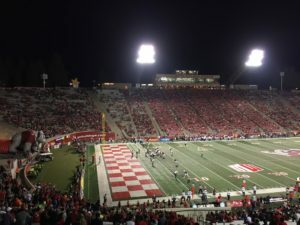 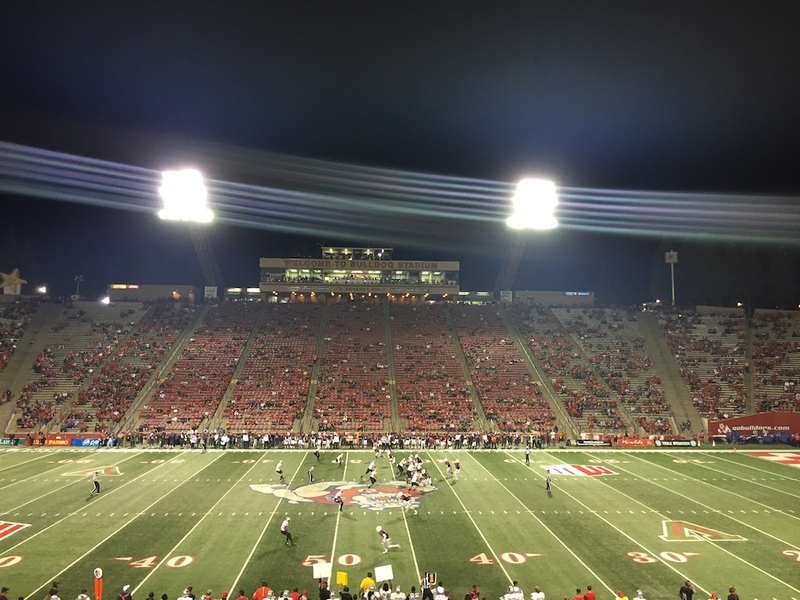 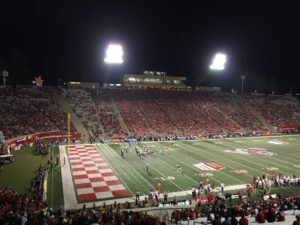 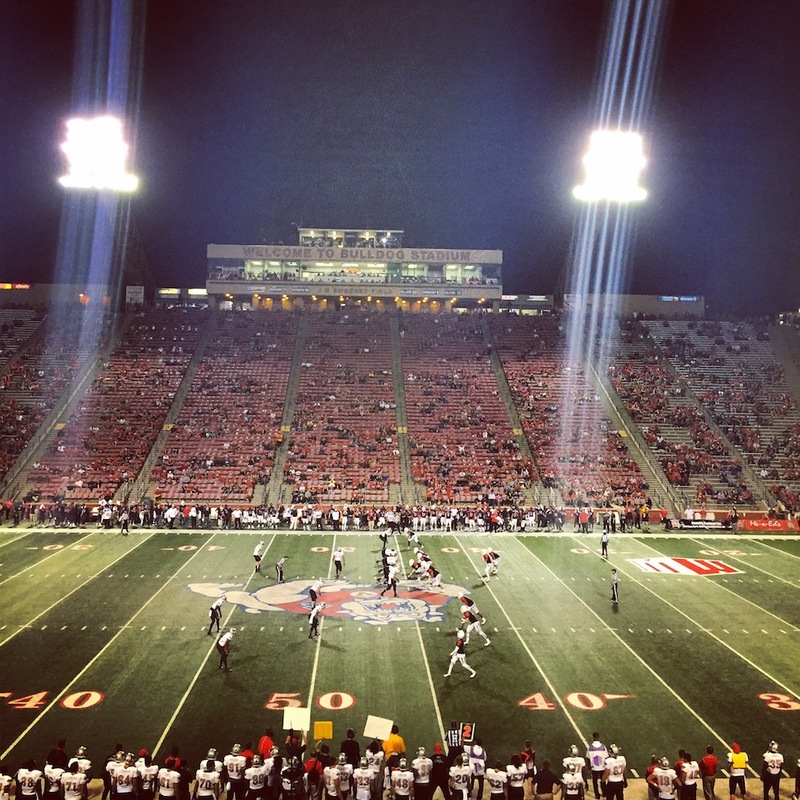 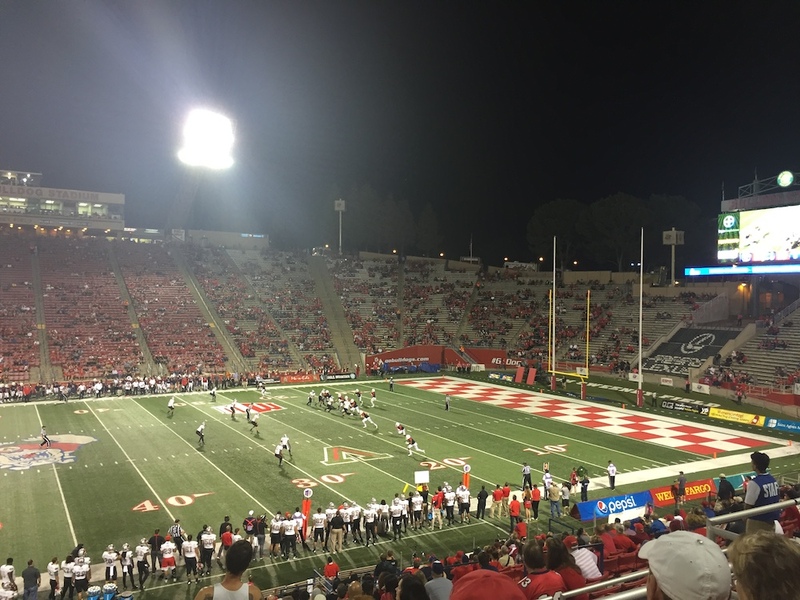 Massive cantilevered light towers hang over the stands, while the endzones are painted in the iconic red and white checker pattern, the hallmark of Bulldog Stadium. 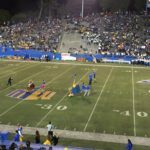 A team of parachutists jump in to deliver the game ball, landing precisely on the menacing open jowls of the Bulldog painted at mid field. Shortly thereafter, the inflatable orange tunnel on the South ramp starts to quake, and the Fresno State squad bounds onto the field, emerging from beneath a giant inflatable Bulldog, enshrouded in a stream of white smoke. 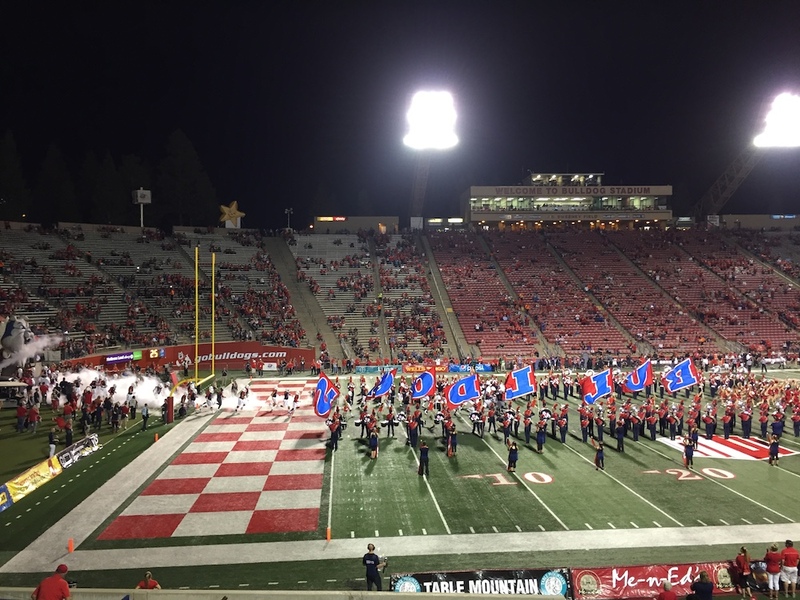 Despite the high energy entrance, first half play is relatively quiet. 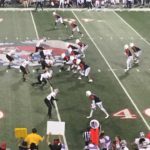 The two squads swap a pair of touchdowns apiece, all of them on long, methodical drives; and the Bulldogs botch a field goal attempt. With the score knotted at 14-14, the two teams retreat to the locker rooms to strategize for the second half. 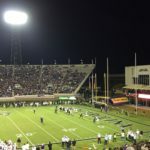 At halftime, I do some strategizing of my own. 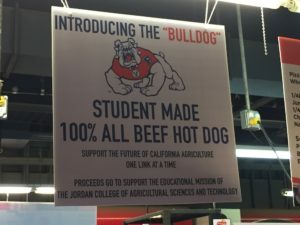 I buy a customary stadium Coke for six bucks, and despite having already downed a few pounds of meat and ice cream during the day, my carnivorous instincts are tempted once again by a sign advertising student made hot dogs. 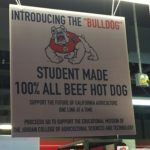 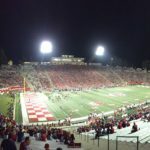 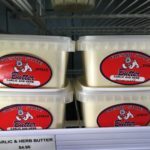 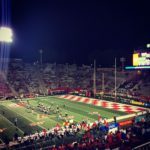 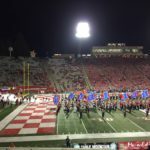 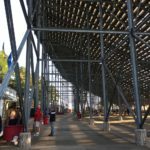 In one of the most brilliant stadium concession ideas I’ve encountered, the all-beef dogs proffered in Bulldog Stadium are made entirely by students in the Fresno State Agricultural School, and proceeds from the dogs go towards fundraising for Jordan College of Agricultural Sciences and Technology. 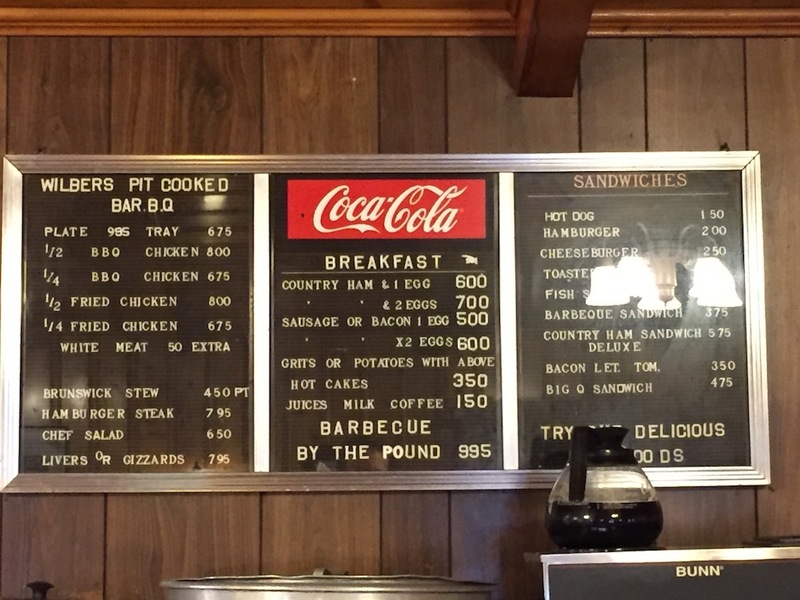 So I pony up another six bucks for one of the plump franks, and slather it with a few pumps of mustard. There is, perhaps, no more appropriate higher educational cause for the PigskinPursuit to support, than the scholastic pursuit of encased meats. 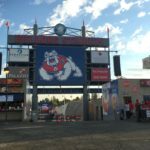 After the break, the Bulldogs dig themselves into the doghouse in the third frame. 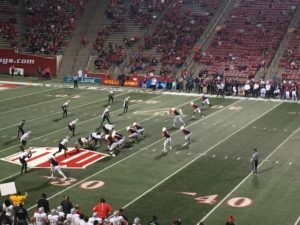 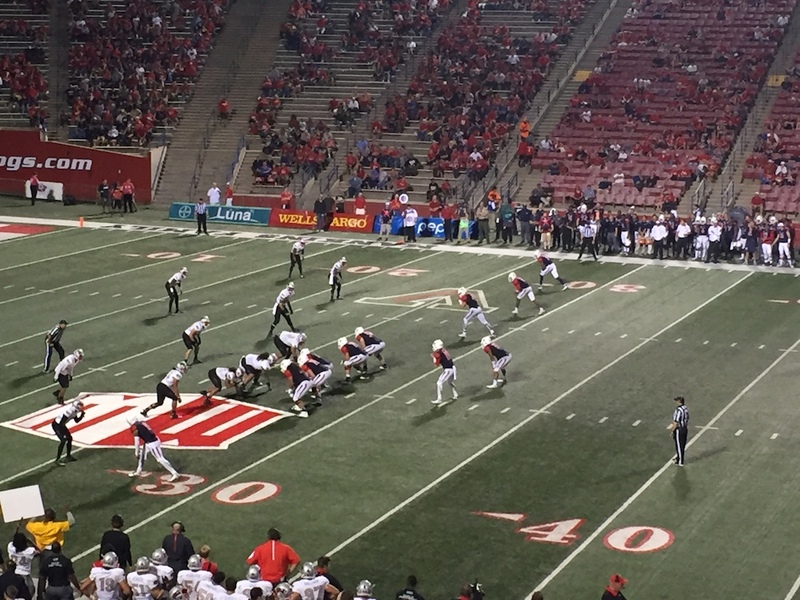 They fumble the ball to UNLV, botch yet another field goal attempt, and yield two touchdowns to the invading Rebels to trail by 11 heading into the fourth quarter. 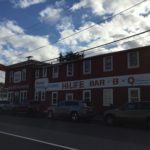 But then, they do an about face. 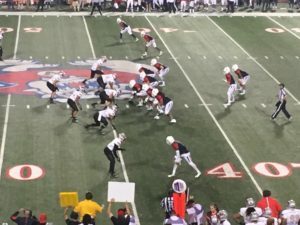 The defense stiffens, stymieing the Rebel attack while the Bulldog offense breaks through, punching in two touchdowns in quick succession (capped off by a two point conversion) to regain the lead 31-28. 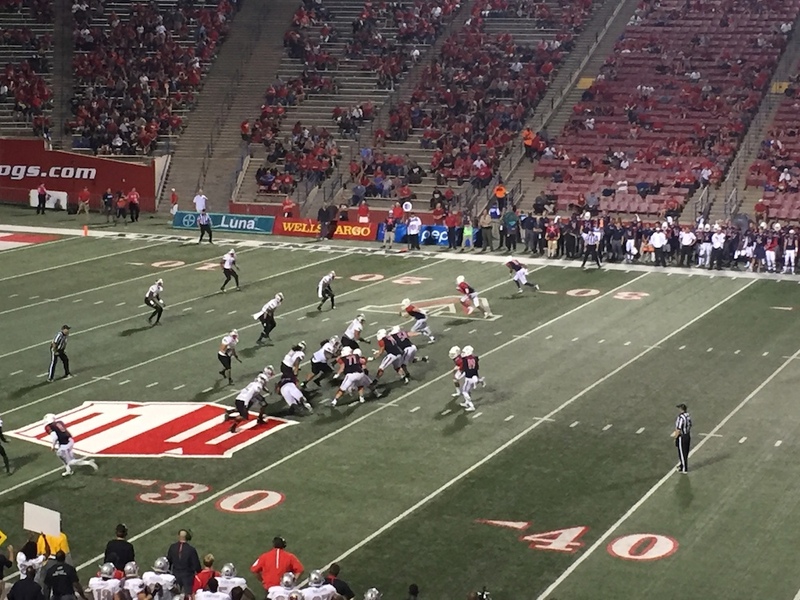 The second score, in particular, is a brilliant run by running back Martez Waller that carves the UNLV defense for 38 yards. With 2:37 remaining, the Bulldogs kickoff to the Rebels clutching a tenuous three point margin, the passive Friday night crowd comes to life. 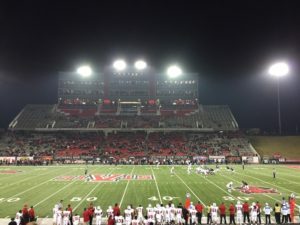 But 2:37 is a lot of time. 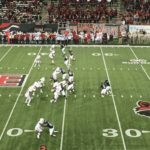 And on the first play of the ensuing drive from his own 25 yard line, UNLV quarterback Kurt Palandech gashes the UNLV defense, sprinting for 39 yards deep into Bulldog territory before he is finally stopped at the 36 yard line. 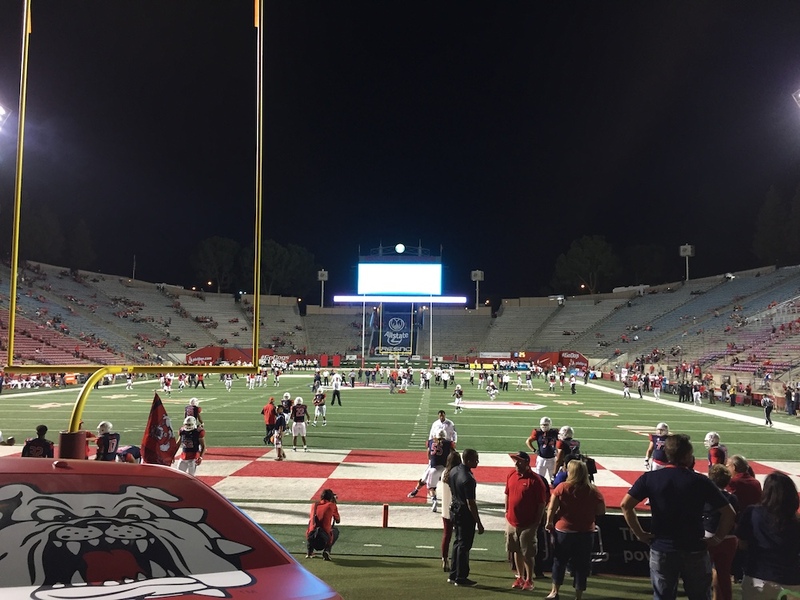 With two minutes remaining, and only 36 yards to go, it portends heartbreak once again for the Bulldog faithful. It is precisely at that moment, in the parched Central Valley of California, that the weather gods intervene in spectacular fashion. 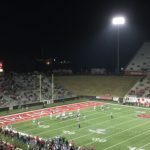 Just as UNLV huddles for the next play, the night skies open up, and a torrential downpour cascades onto the glowing field below. 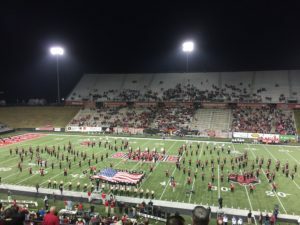 The drops fall heavy and cool in the tepid night air, liquid patters and chimes on the aluminum benches, the crowd rises and roars like a wilted flower refreshed. 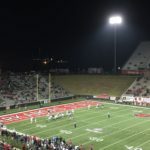 Both the ball and the field are immediately slickened, and the Las Vegas natives are ill equipped to deal with such elements. 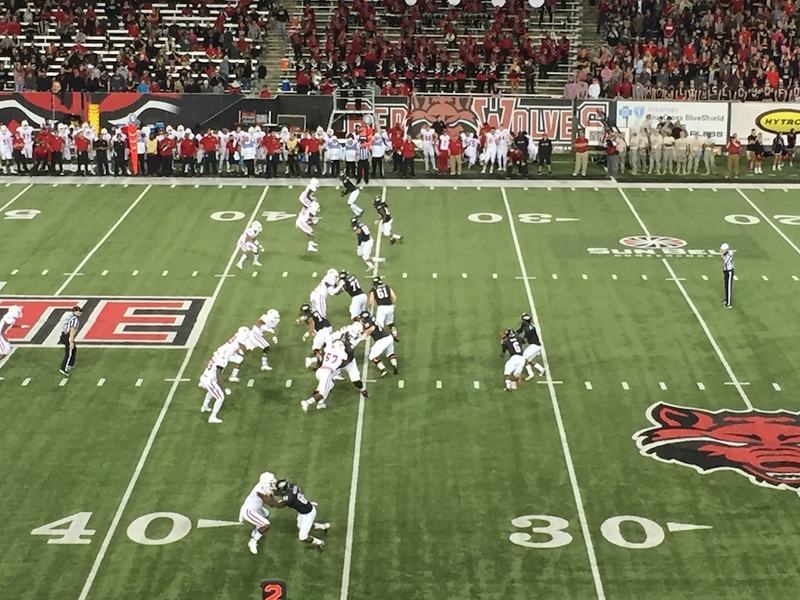 Their offense falters, tattered in the deluge, and they are swept away in four quick plays. 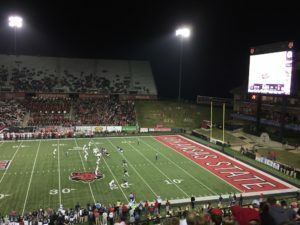 The final two are sacks, where the Rebel QB is stuffed ceremoniously into the soggy turf to lie, defeated in a puddle of tears and rain. 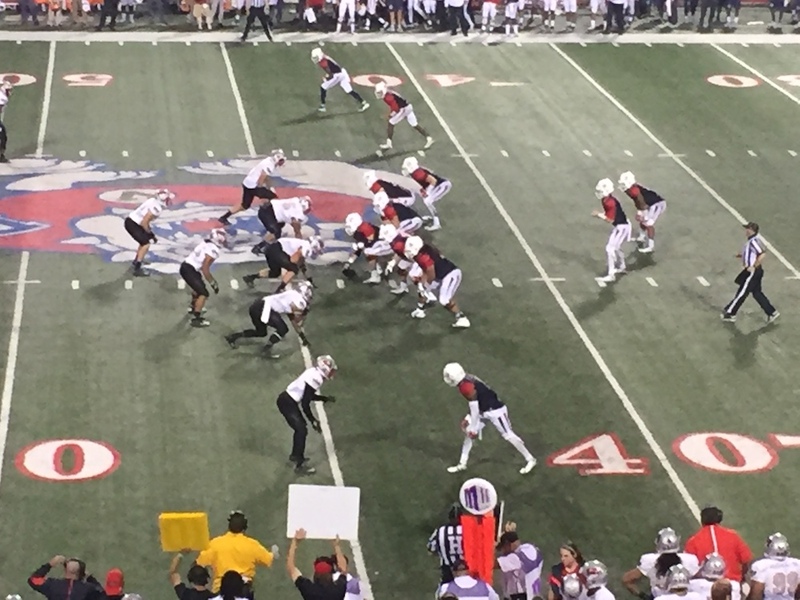 Dramatically, the Bulldog’s prevail 31-28. God is credited with one assist on the night. 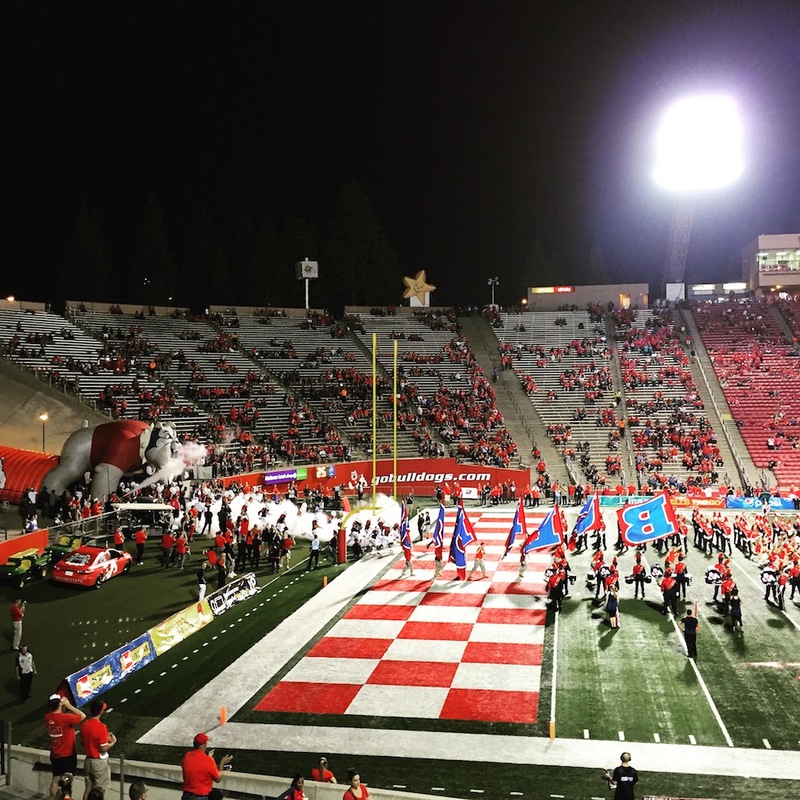 It’s a poetic ending for a game at Fresno State. 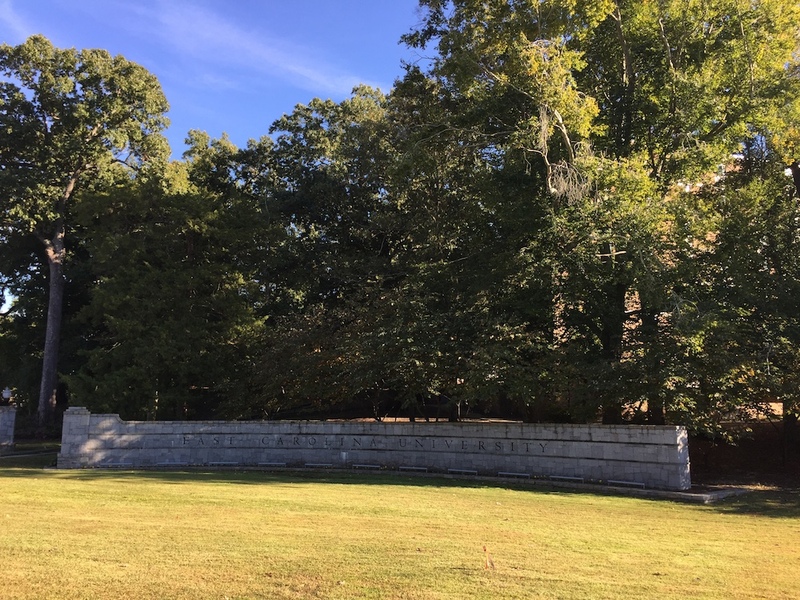 The garden of America, scorched and cracked, thirsting for a few drops of water. A proud football team, struggling too, in need of a lift of their own. 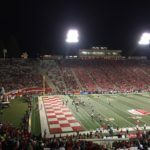 The green “V” on the back of the Bulldog helmets stands for the California Central Valley, the very mission of the school interwoven into the agricultural backbone of the of the state. 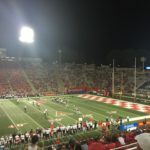 It was a fitting end, then, that the Bulldogs escaped with a win during my brief visit to Fresno, both the team and the valley quenched by a few precious drops of rain. 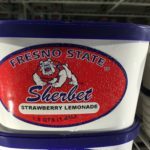 footnote: There are two other exceptional eateries to be found in Fresno during a game weekend that are worthy of inclusion for future reference. 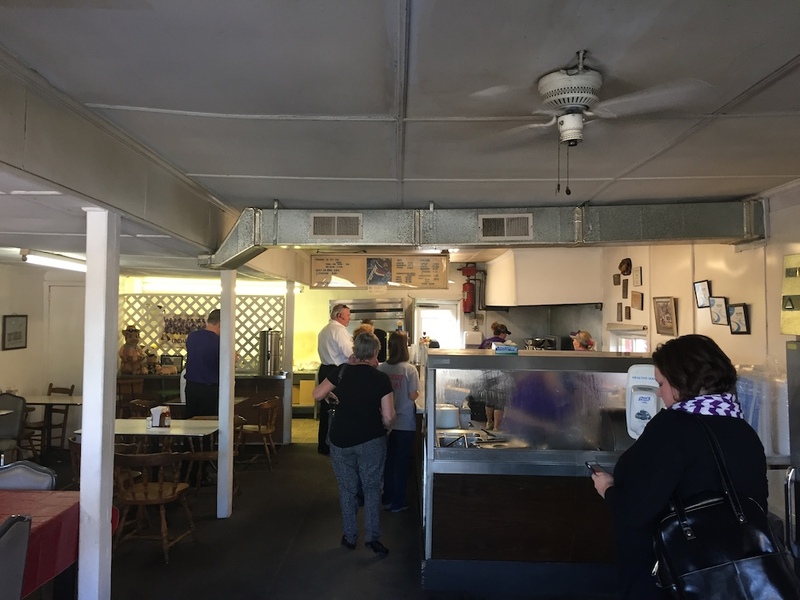 Mike’s Grill – which serves the best Santa Maria style Tri-Tip sandwich that I’ve had anywhere in California, and is found in an unassuming shack in the middle of a strip mall parking lot. 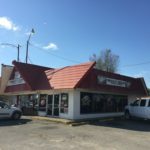 the Chicken Pie Shop – which specializes in, well, chicken pies and is a unspoiled, beautifully original, green vinyl boothed throwback to the golden age of the american diner. 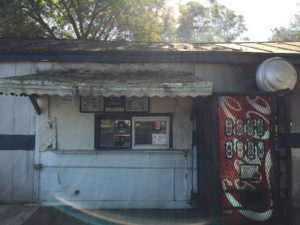 Drugs are sumptuous, and definite men cannot get the medicaments they need. 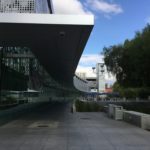 Certain drugs are as a rule used to treat varied types of infection caused by definite types of bacteria, such as tonsillitis and infections of the throat. 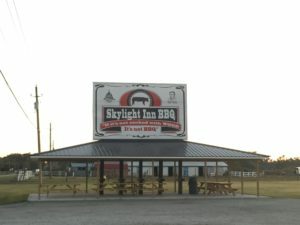 If you’re concerned about sexual problem, you probably know about http://isviagraoverthecounter.com/Male-Enhancement-Pills.html. 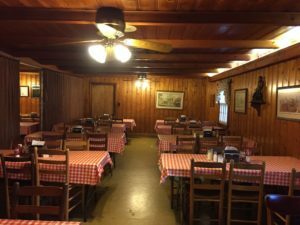 What are side effects of Cialis? 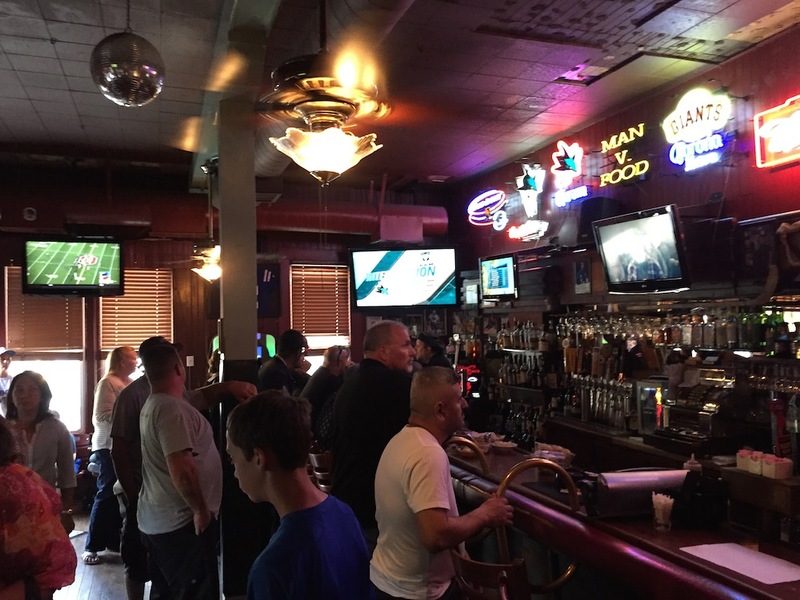 There are varied drugs for male impotence cure. 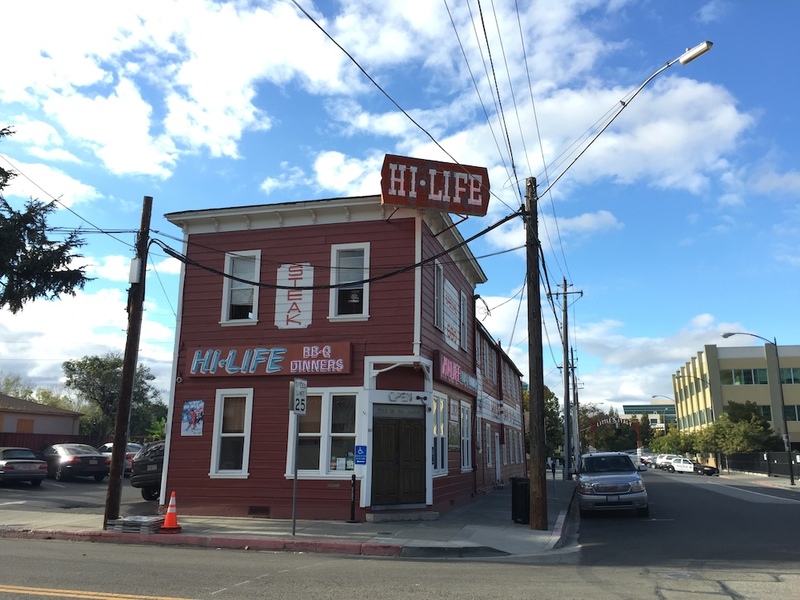 Very likely Male Enhancement Pills Over the Counter is a very complicated topic. 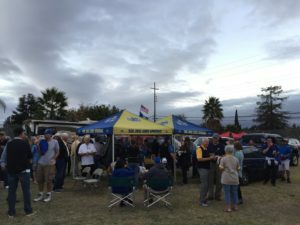 More data about Cialis available at best male enhancement pills over the counter. 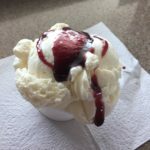 While the generic is credited with improving nausea, it may also kill the mood in bedroom. 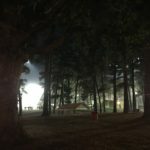 All kinds of medications, from those that are elaborate ‘all natural’ to those that are chemically produced in a laboratory, may cause some kind of aftereffects.